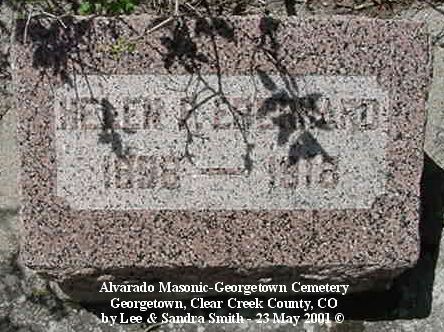 Georgetown is located 50 miles west of Denver, Colorado on Interstate 70. 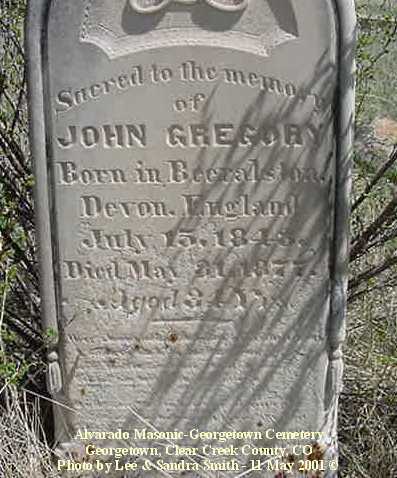 George Griffith and his brother David founded the town of Georgetown around 1865. 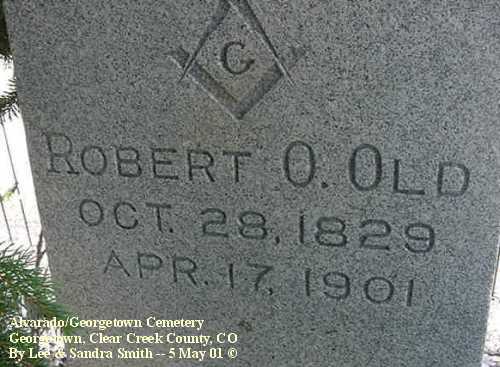 A brief history of the town can be found at www.georgetowncolorado.com/birthofatown.htm. 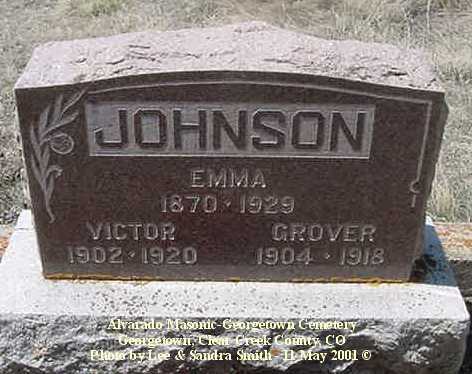 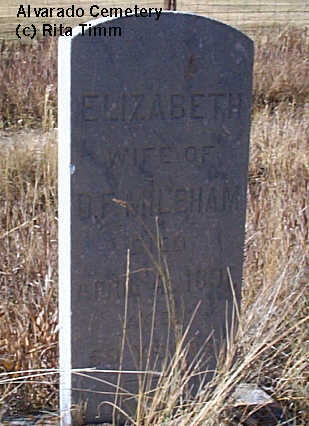 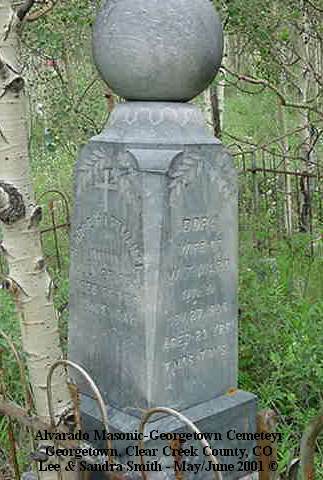 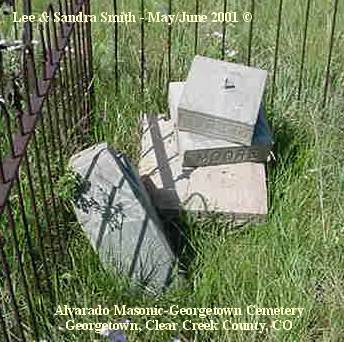 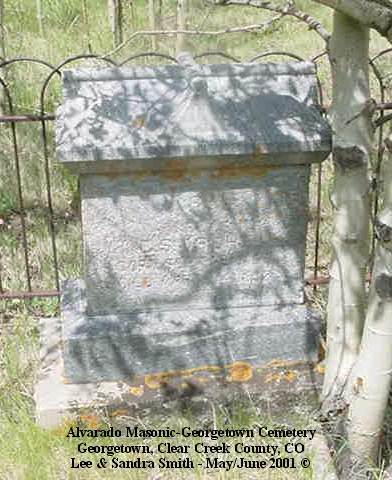 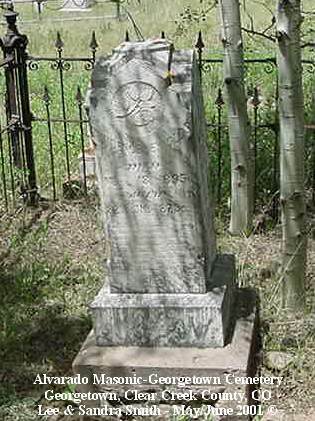 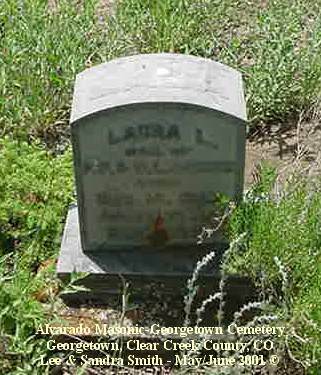 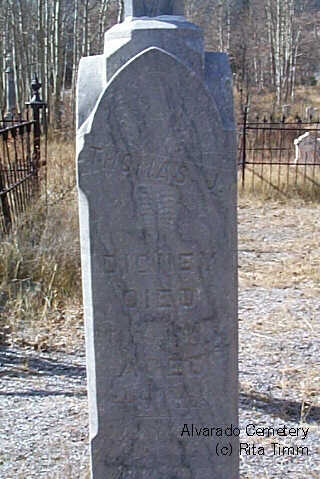 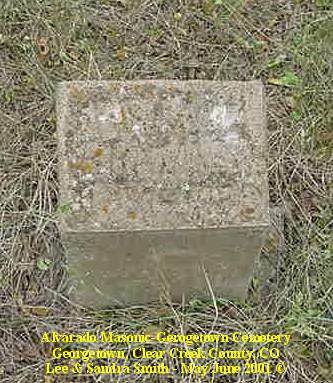 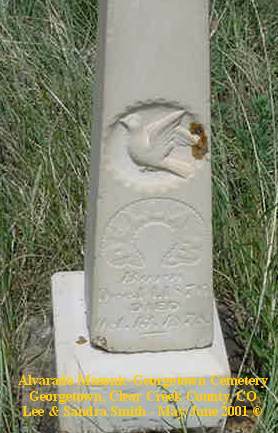 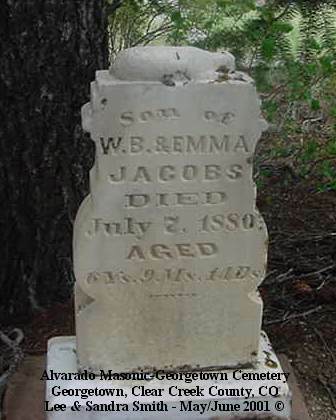 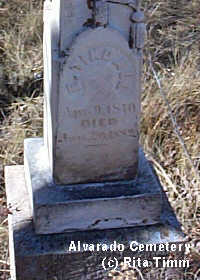 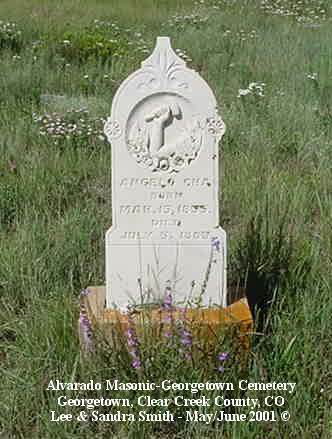 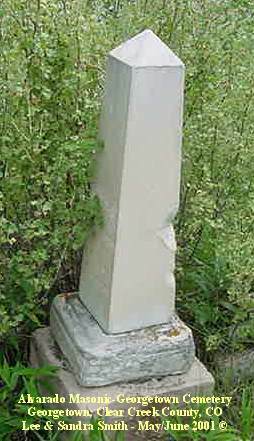 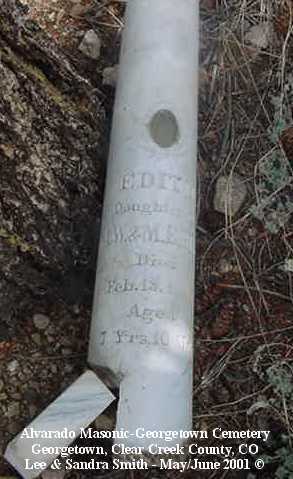 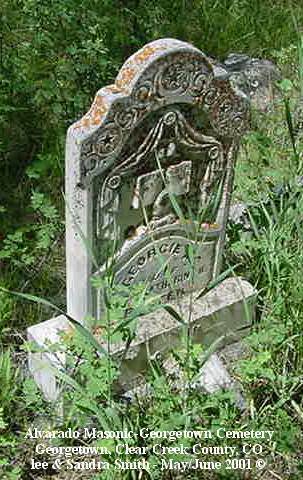 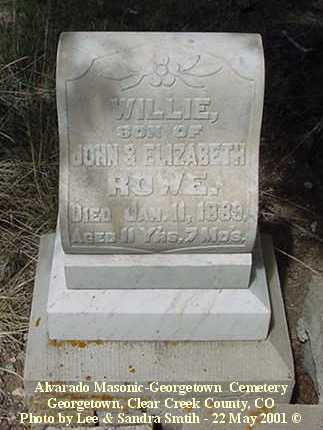 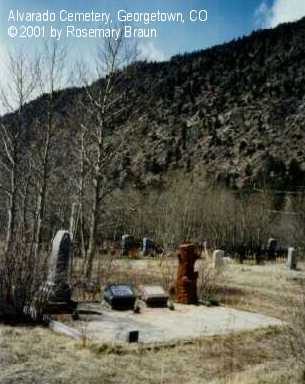 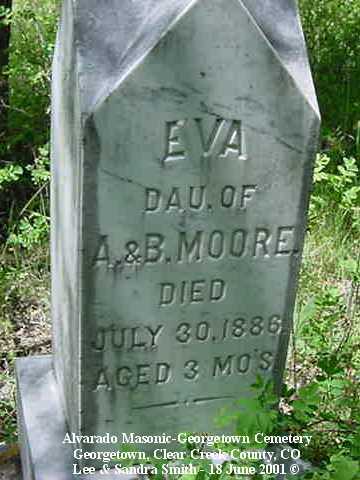 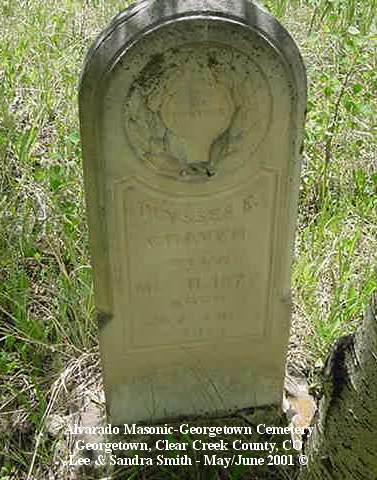 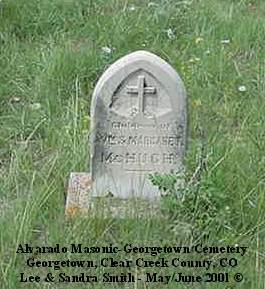 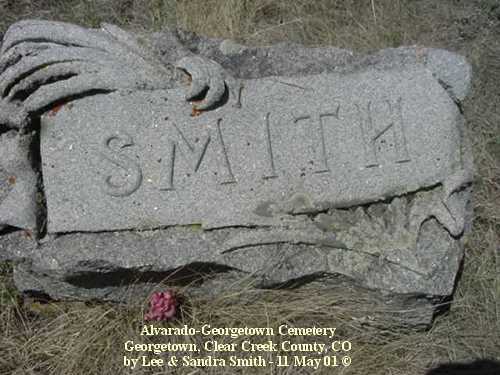 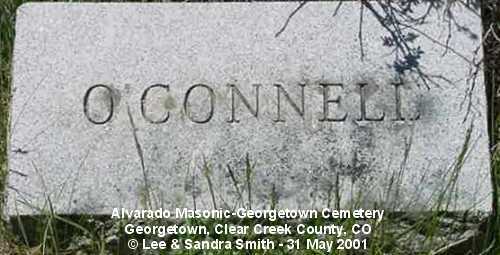 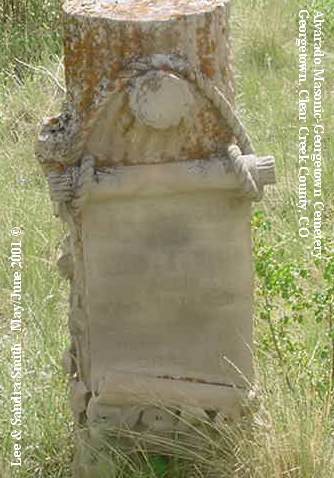 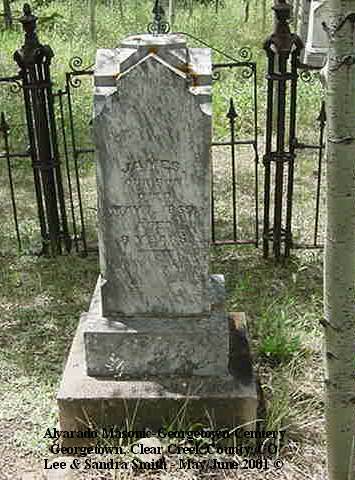 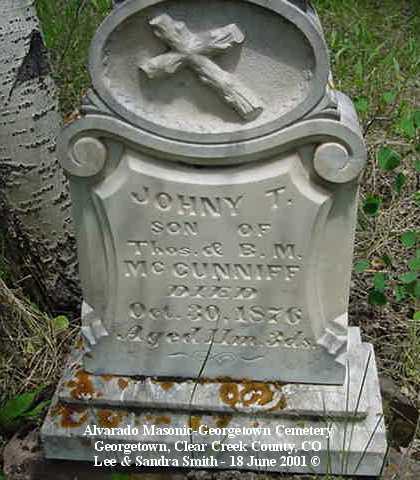 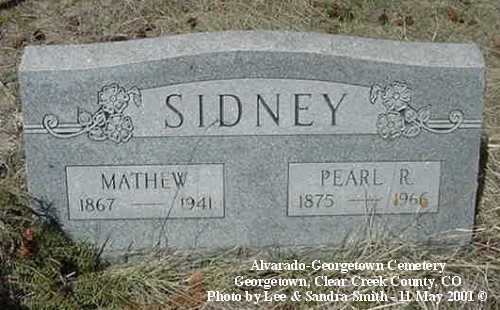 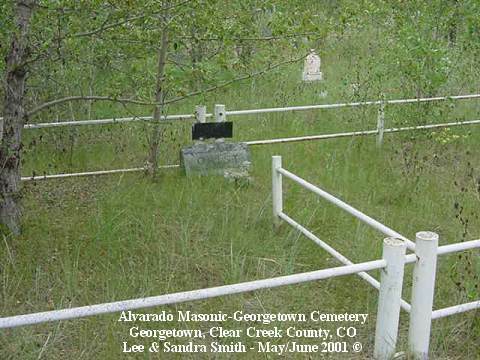 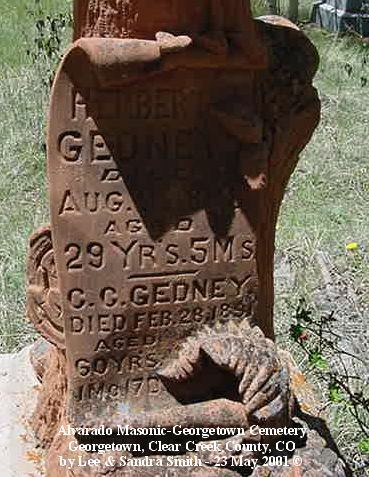 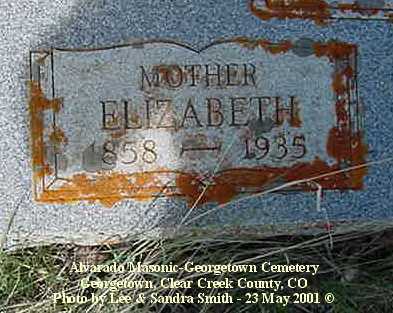 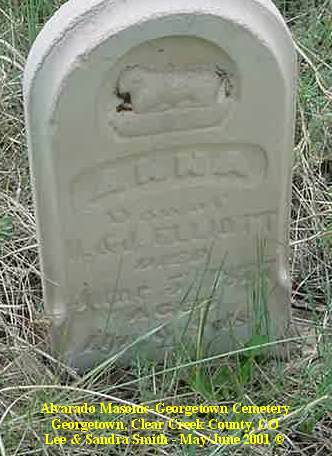 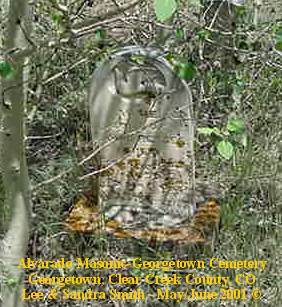 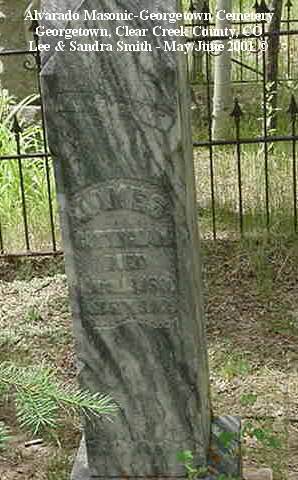 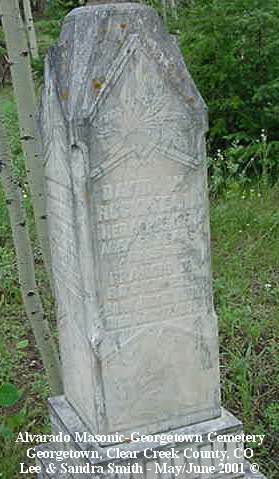 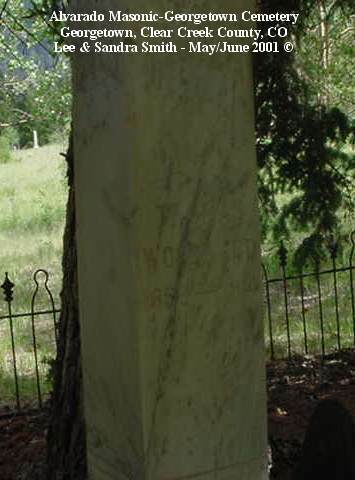 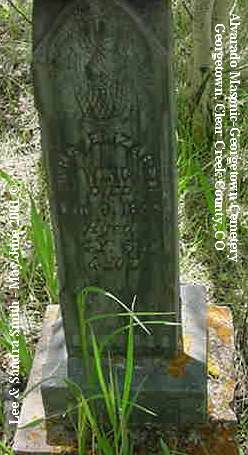 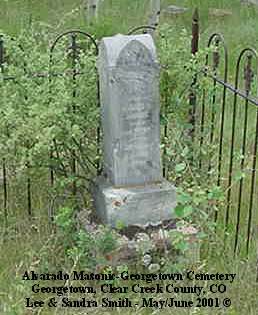 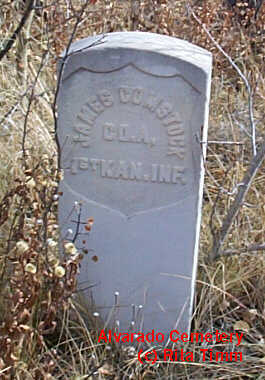 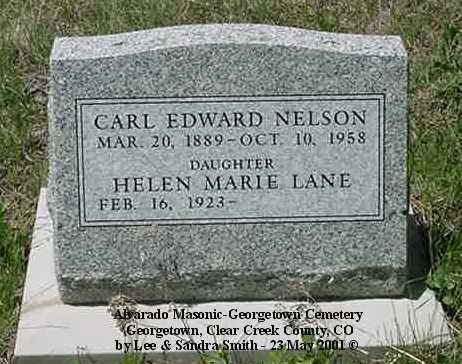 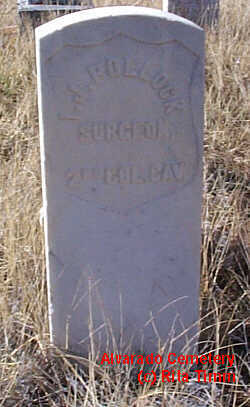 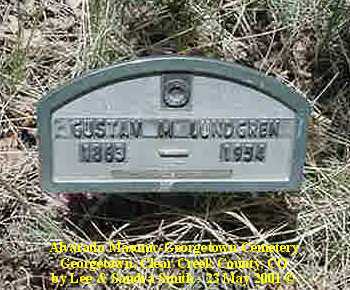 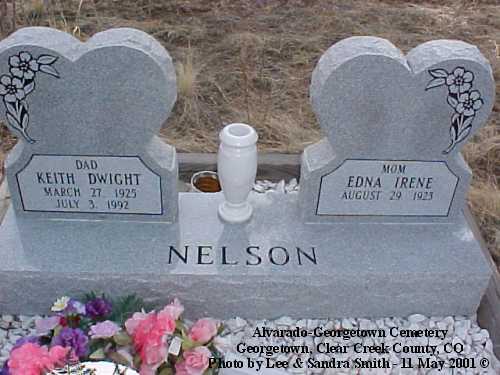 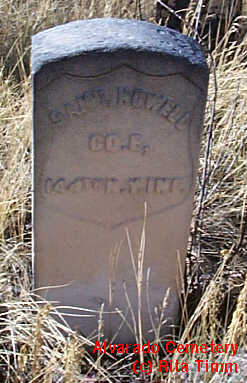 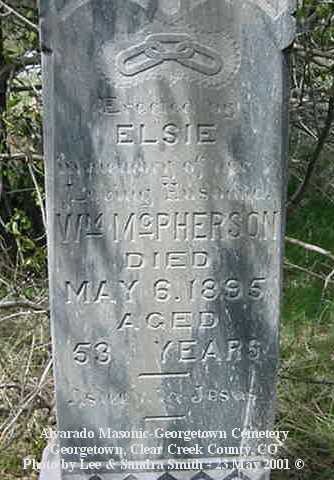 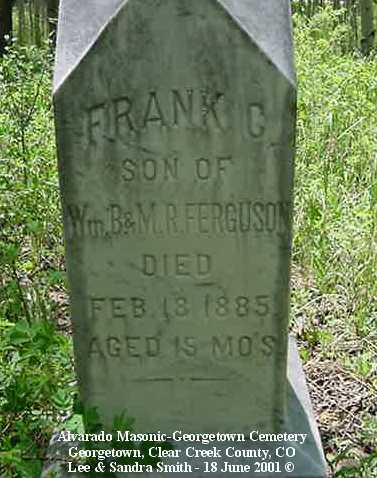 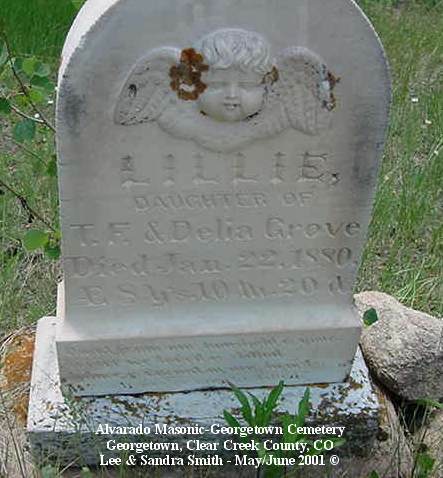 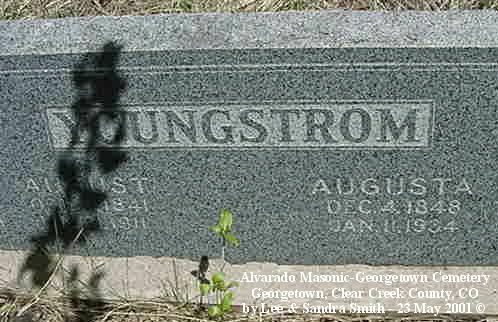 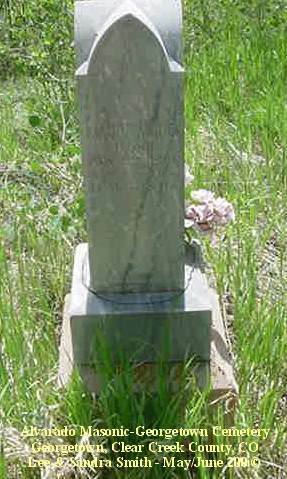 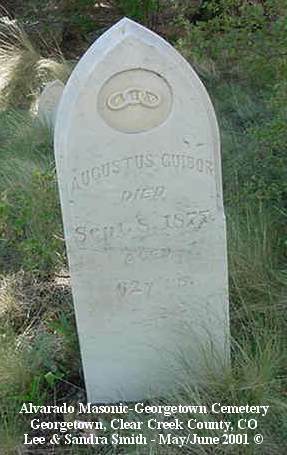 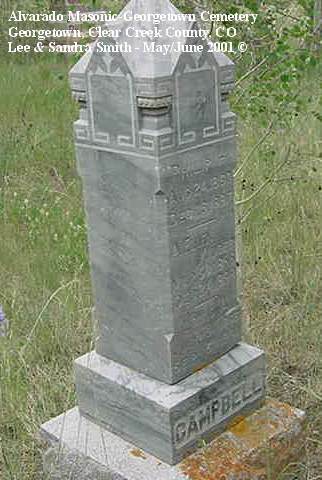 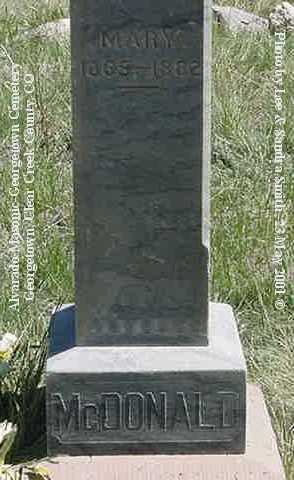 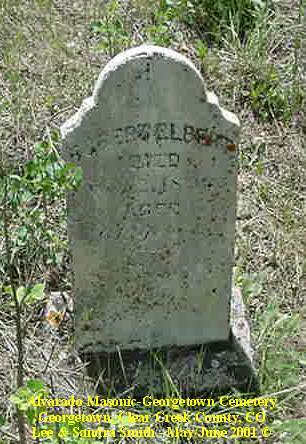 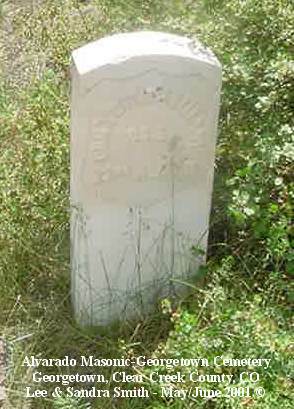 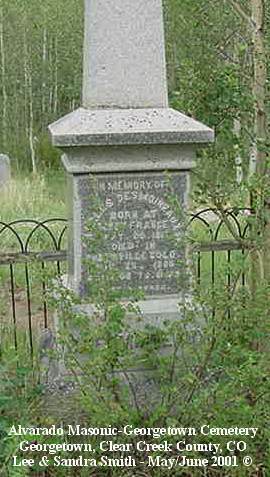 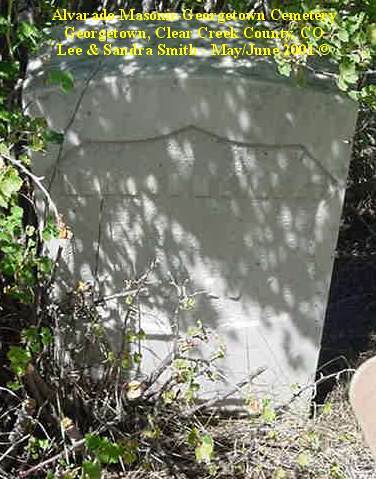 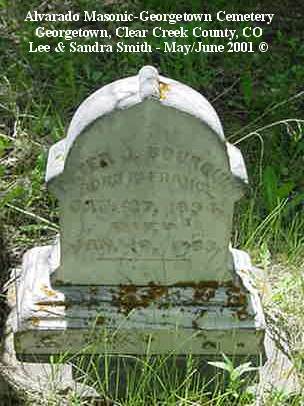 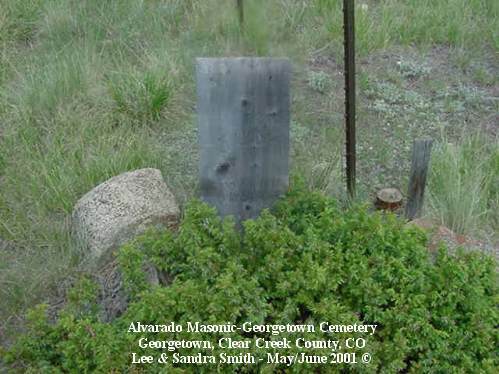 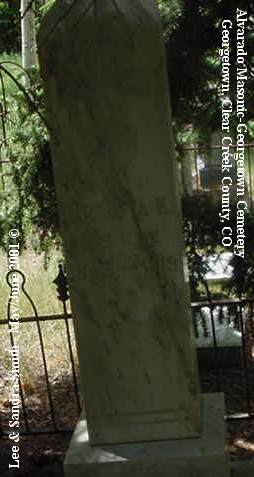 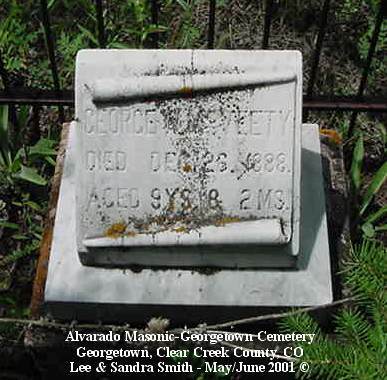 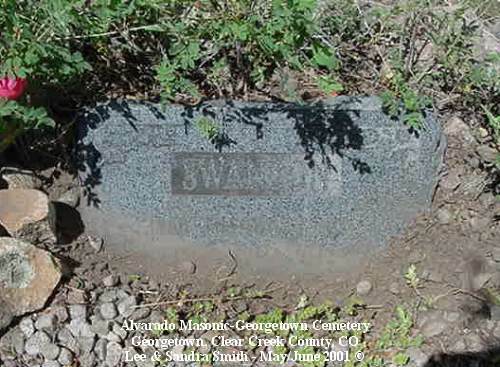 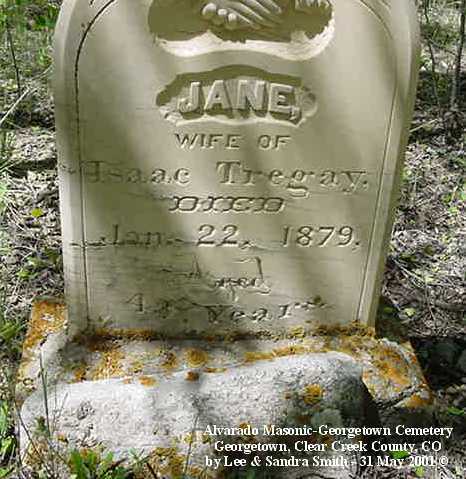 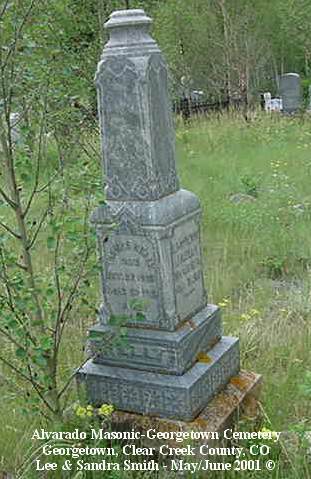 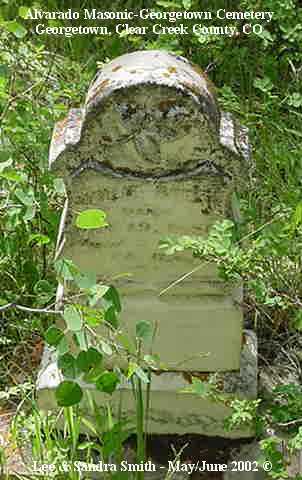 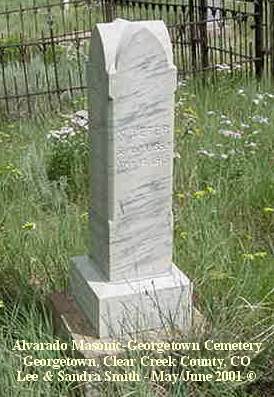 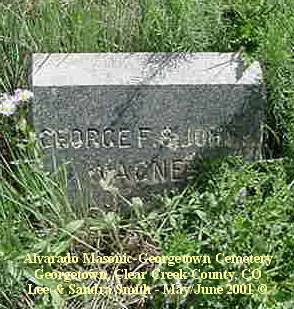 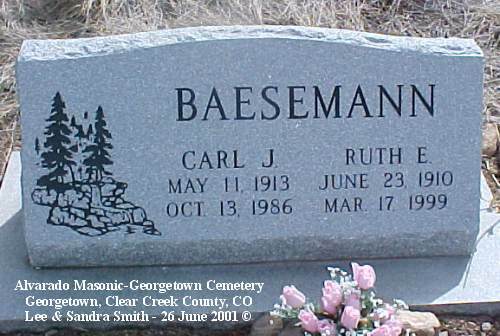 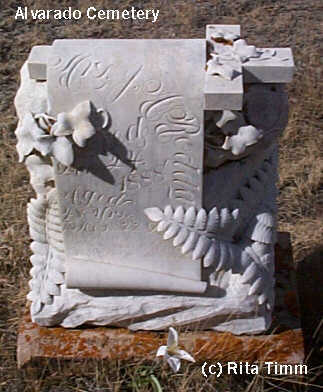 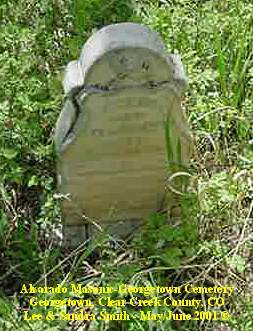 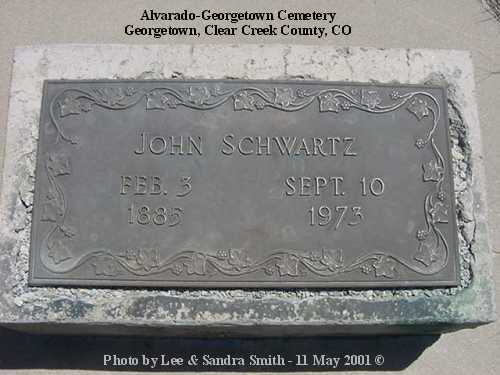 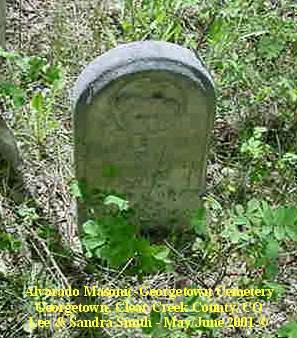 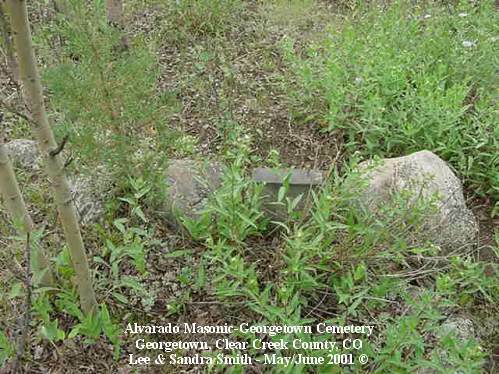 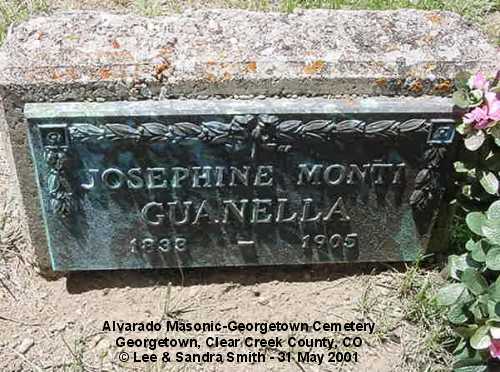 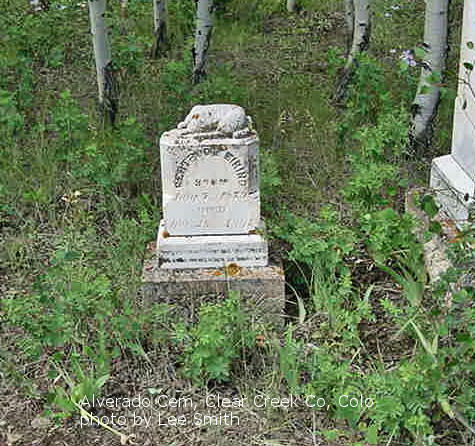 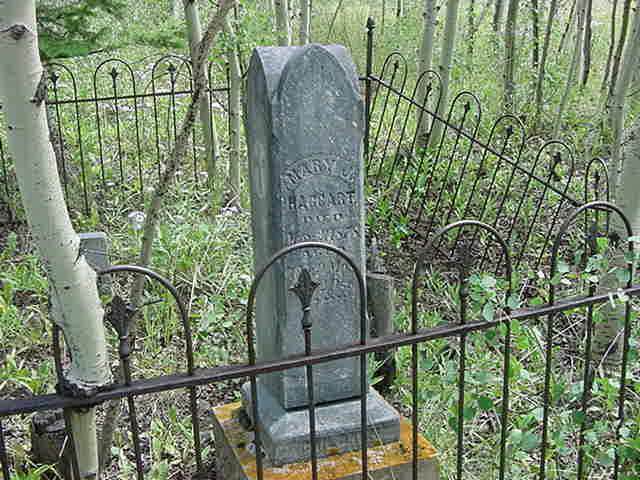 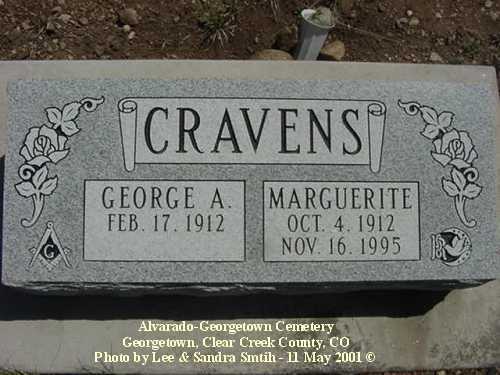 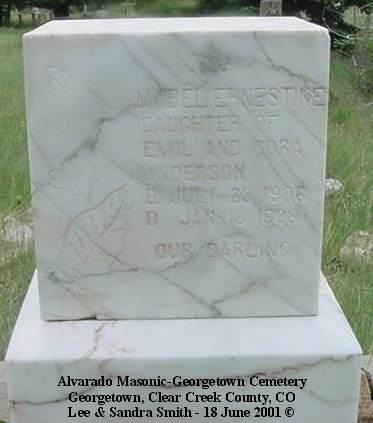 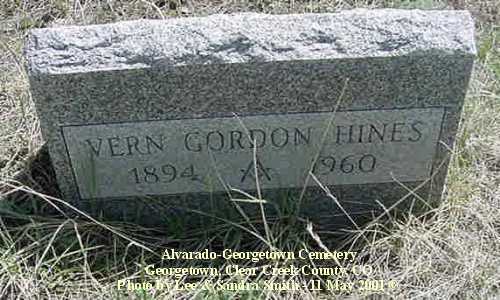 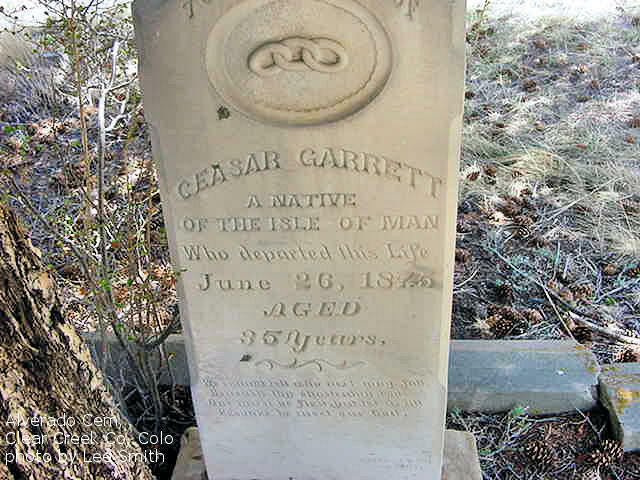 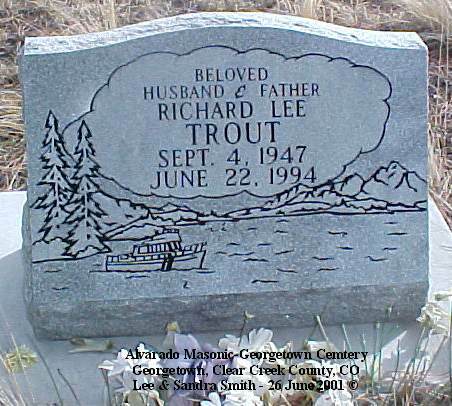 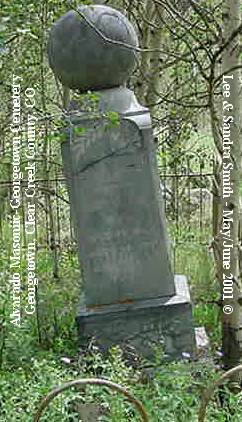 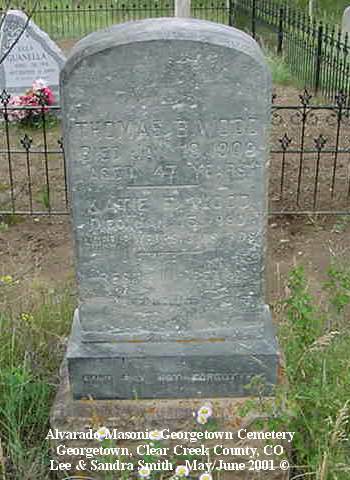 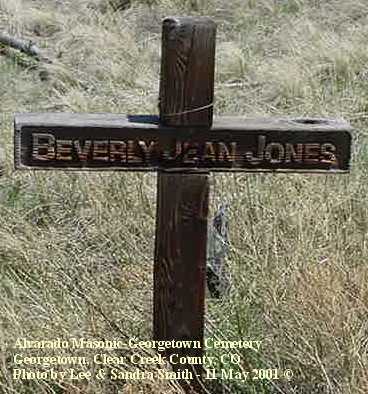 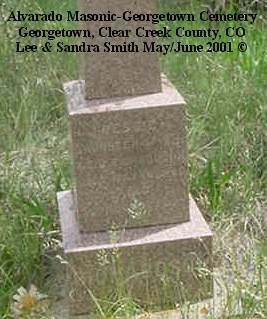 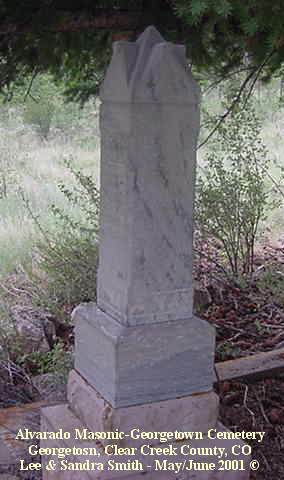 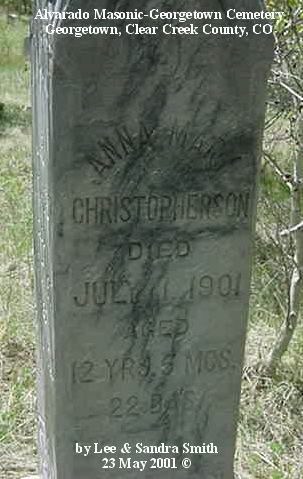 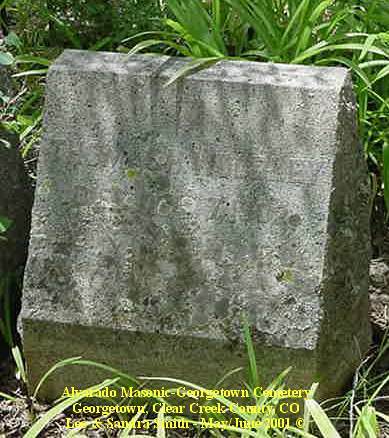 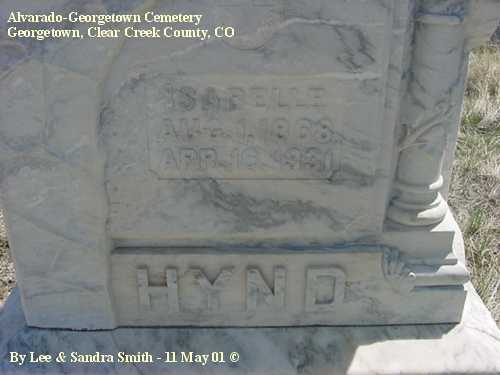 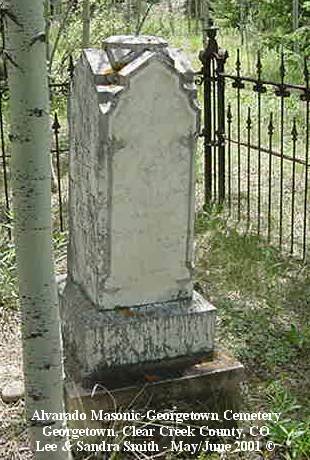 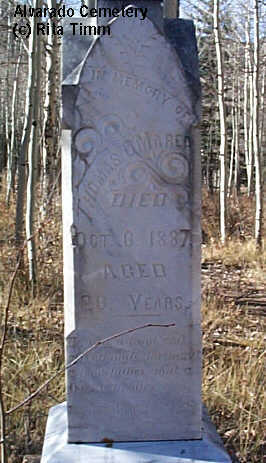 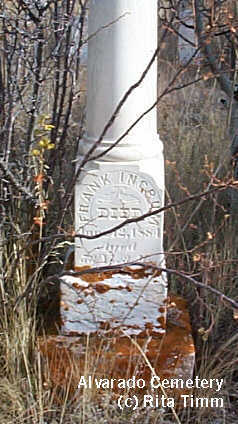 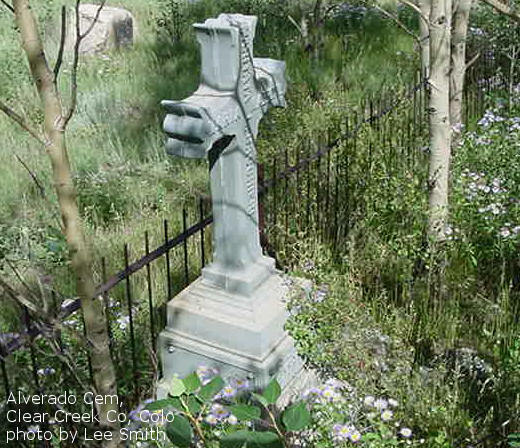 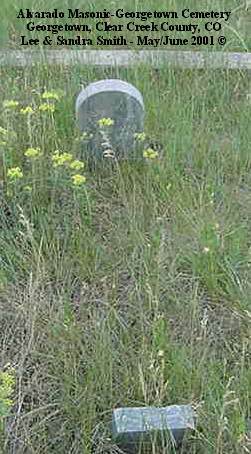 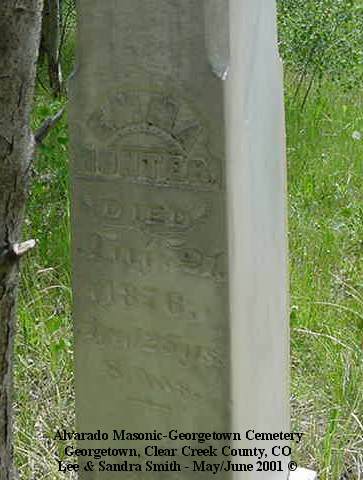 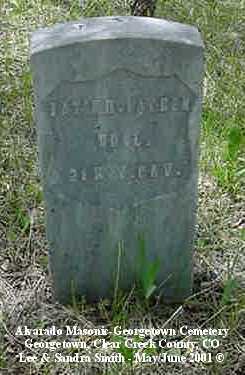 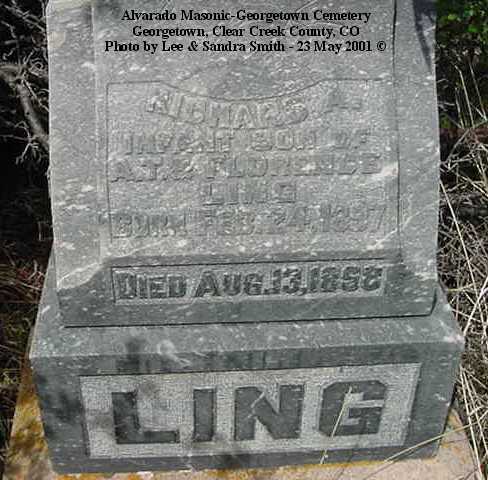 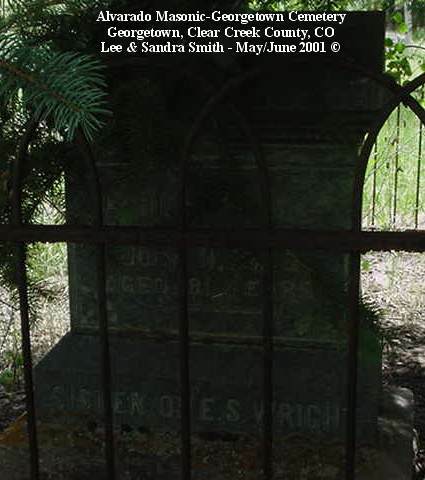 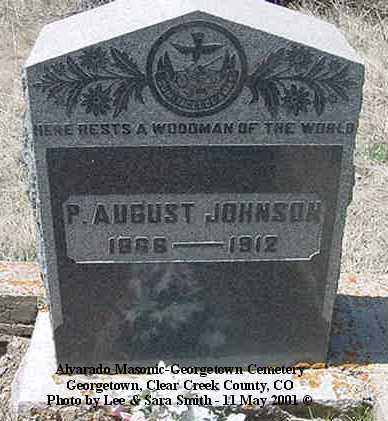 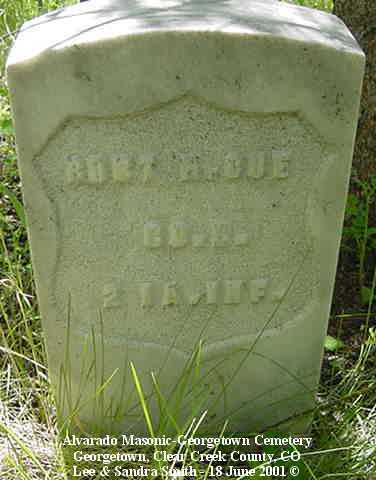 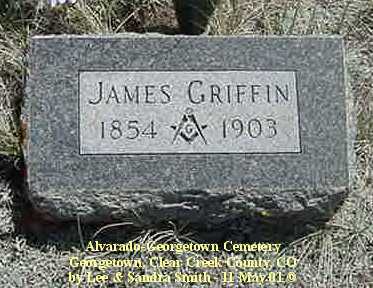 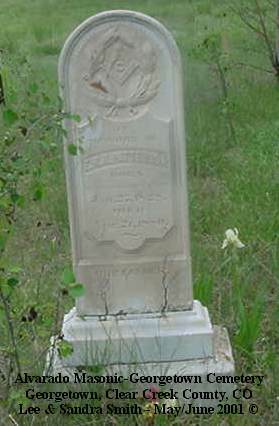 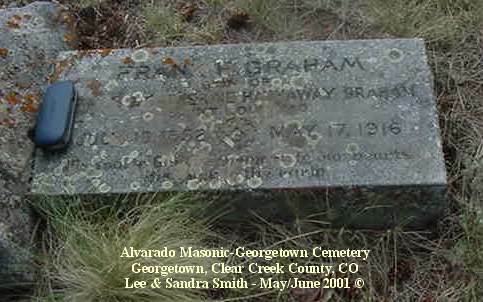 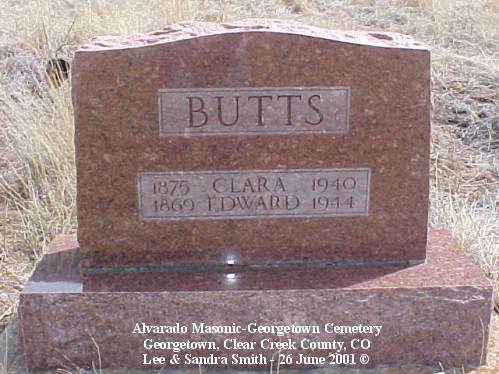 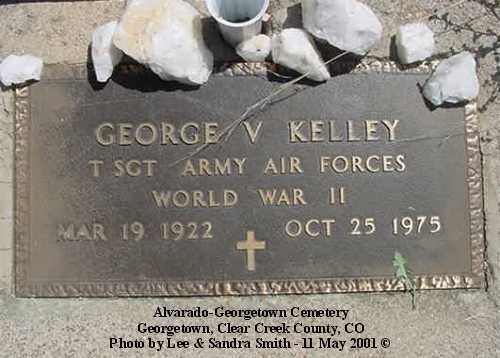 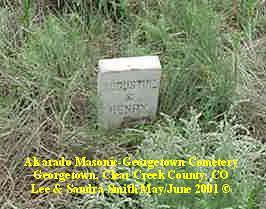 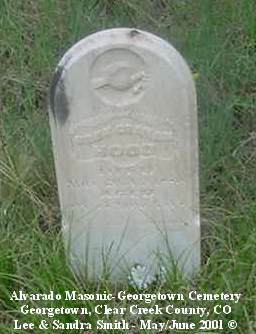 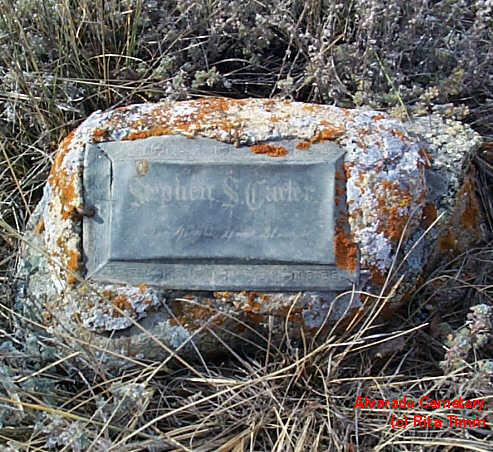 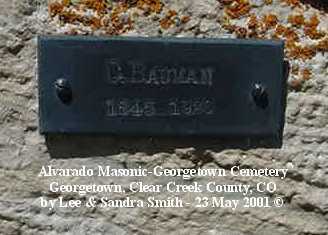 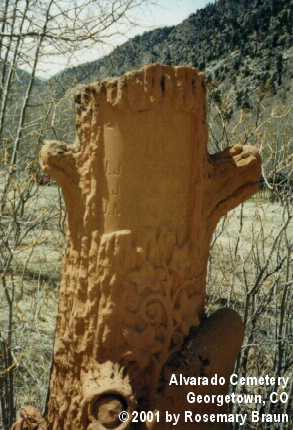 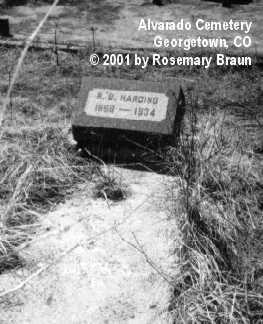 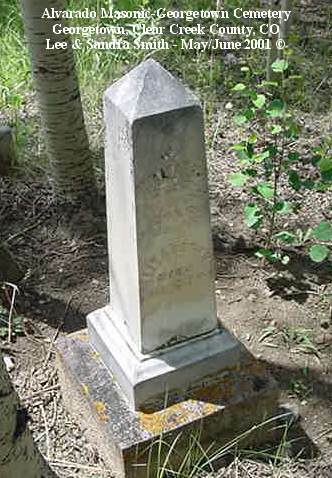 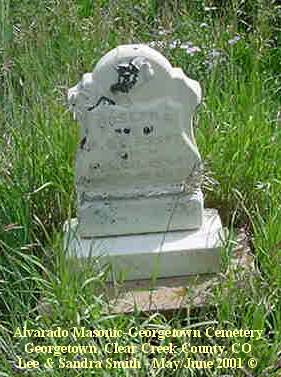 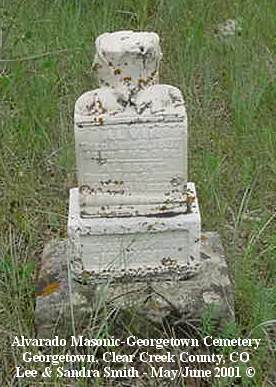 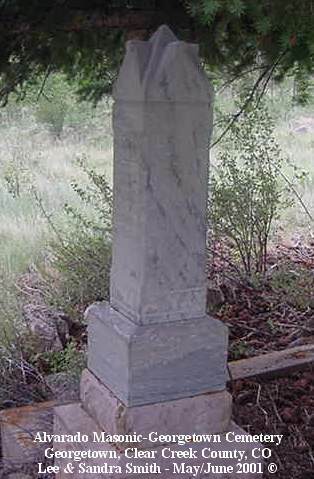 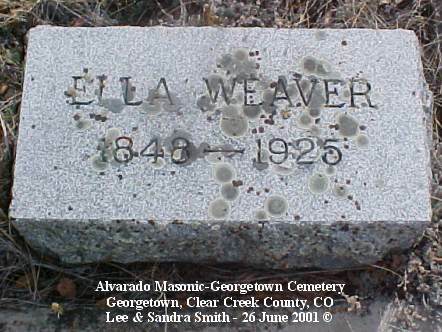 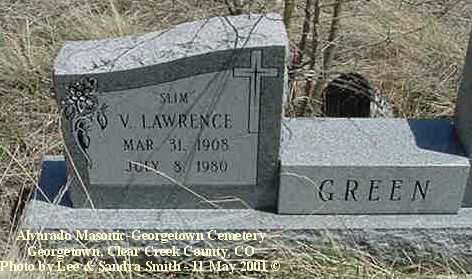 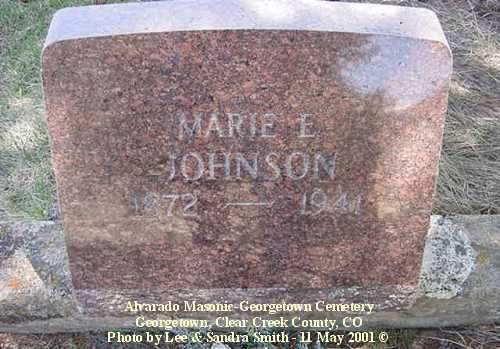 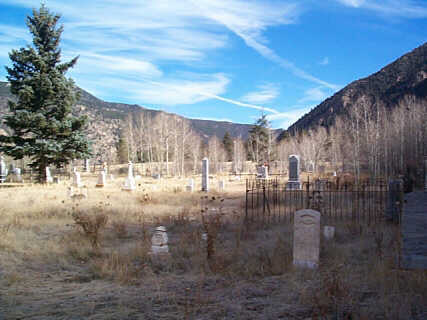 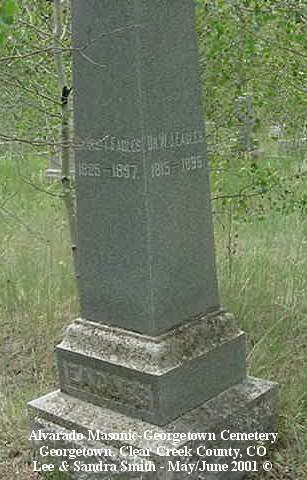 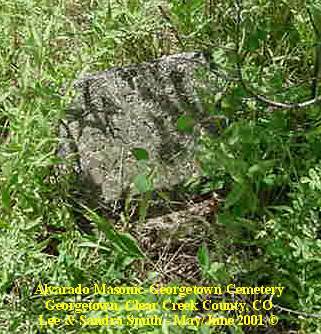 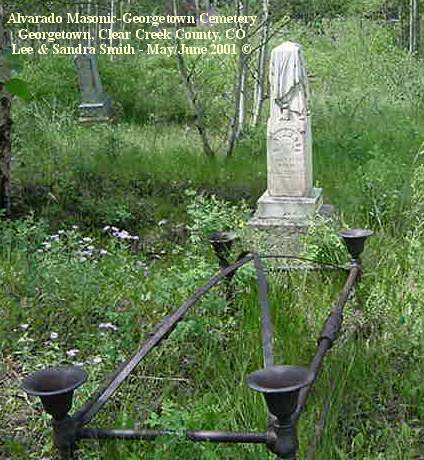 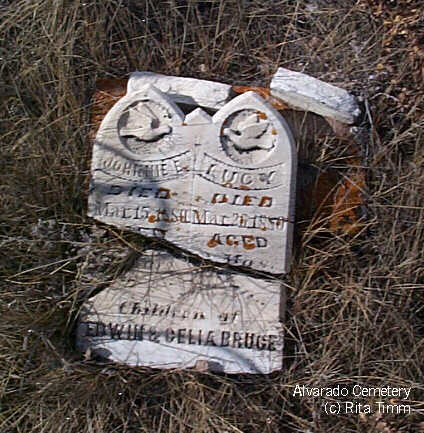 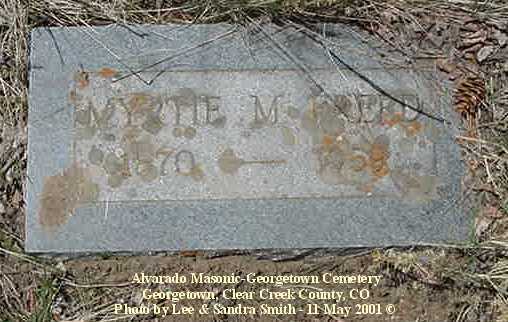 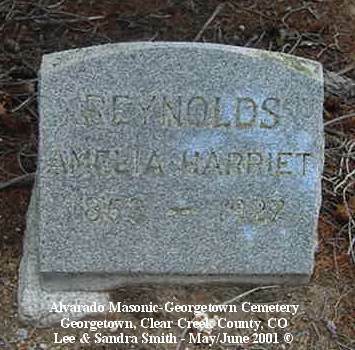 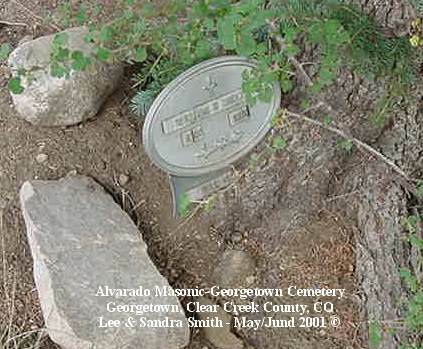 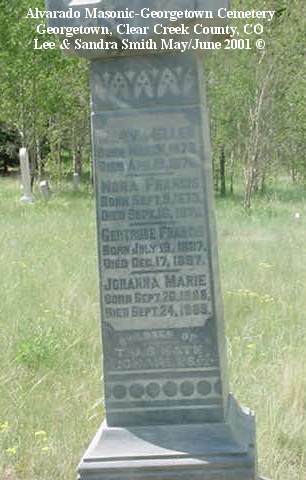 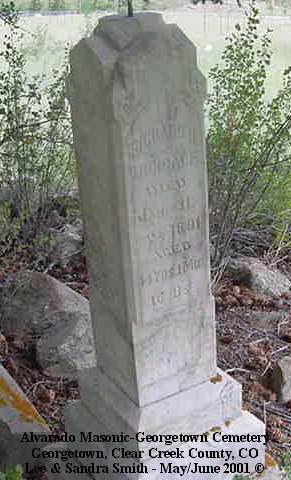 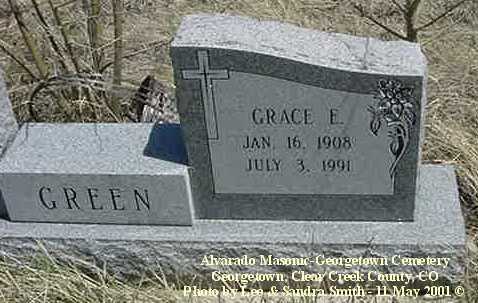 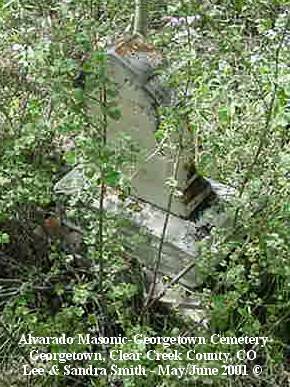 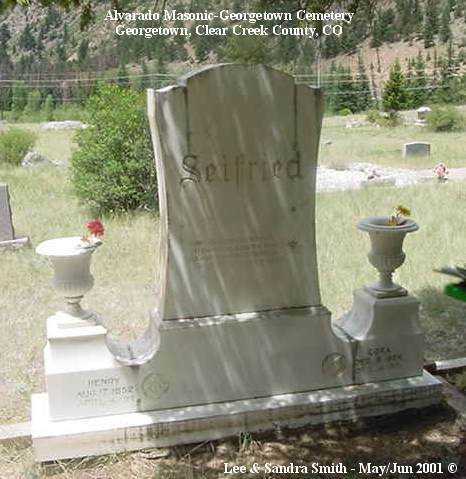 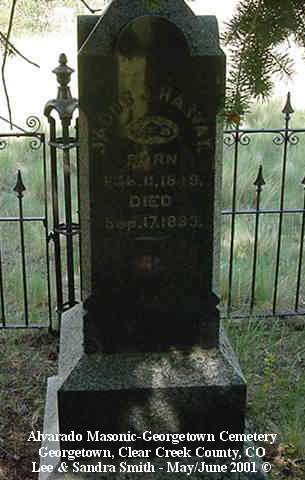 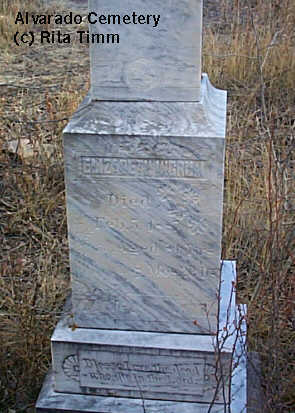 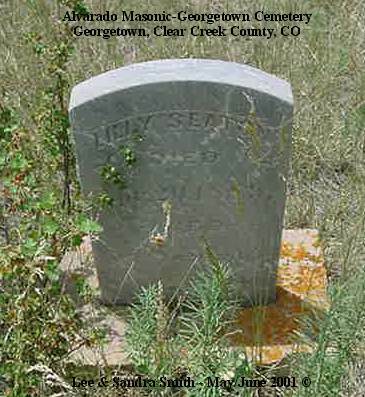 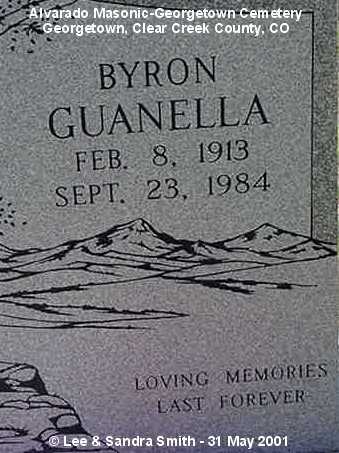 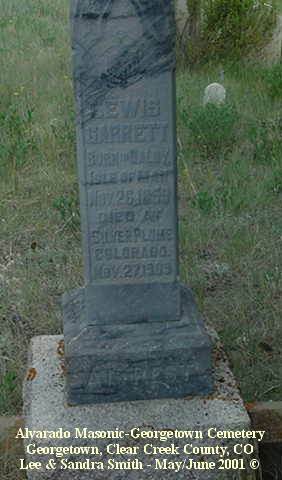 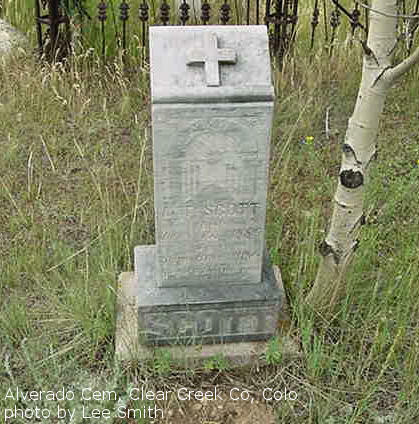 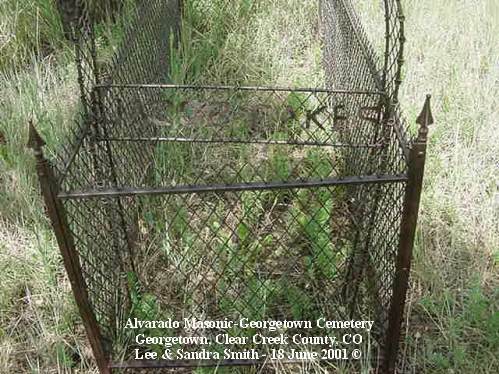 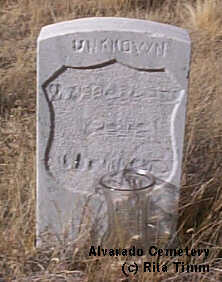 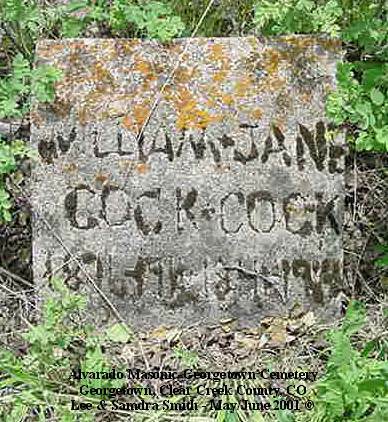 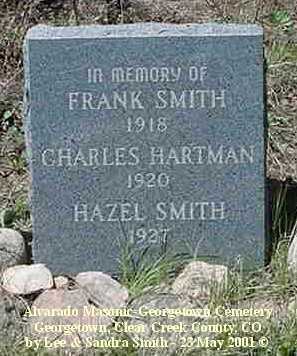 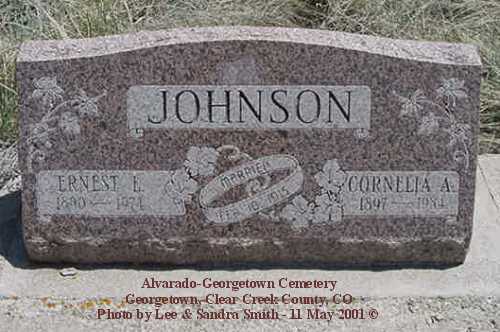 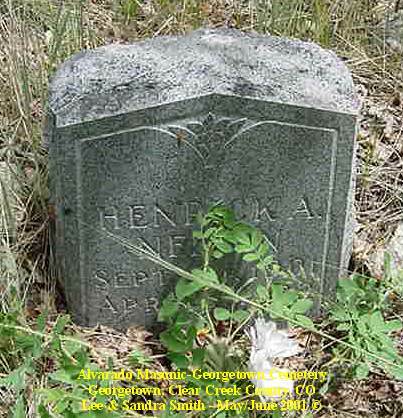 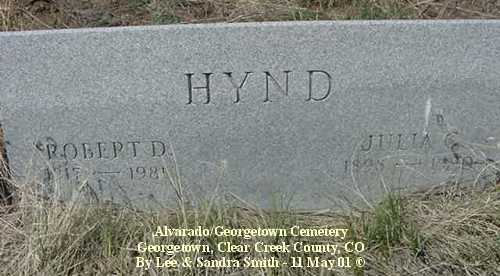 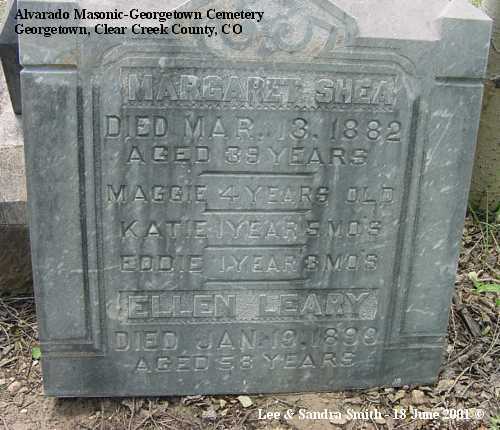 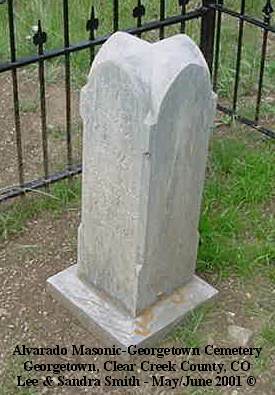 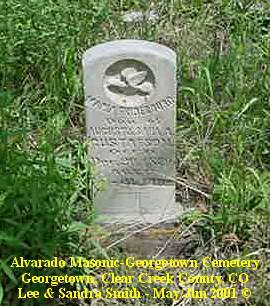 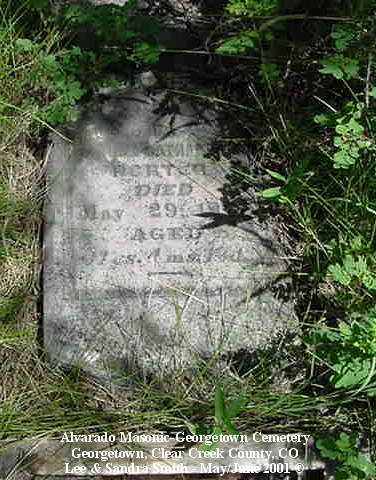 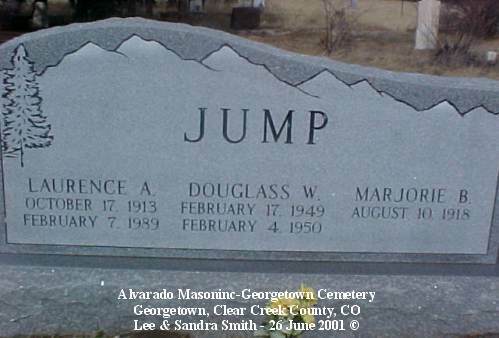 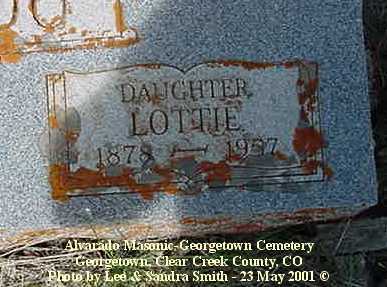 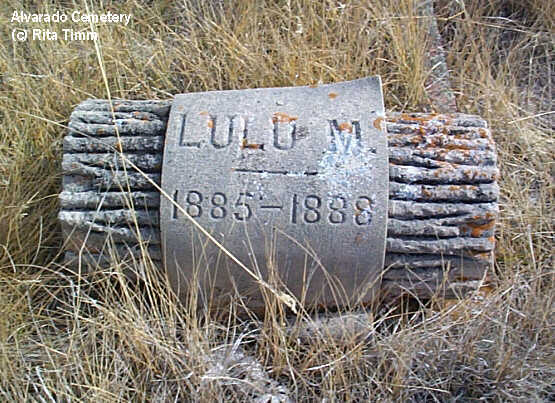 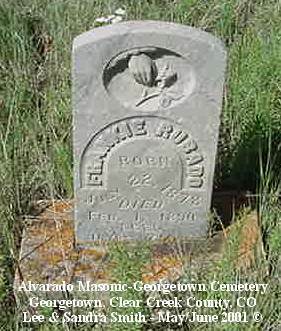 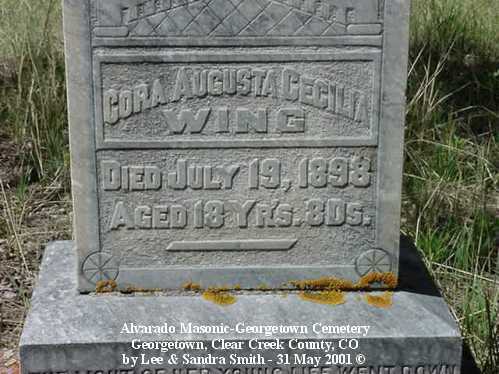 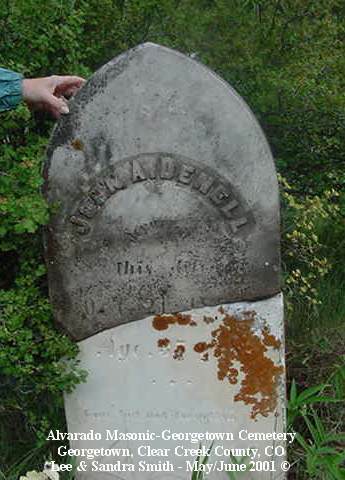 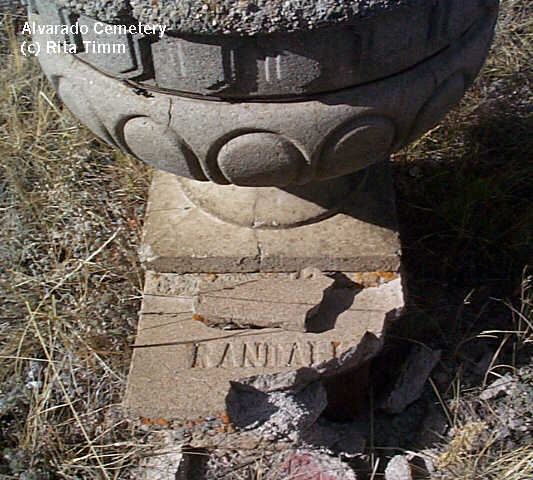 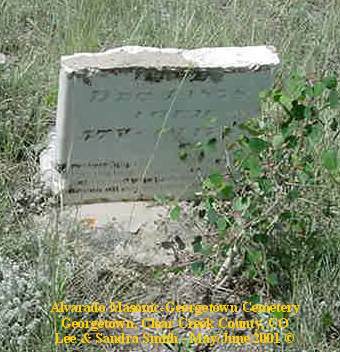 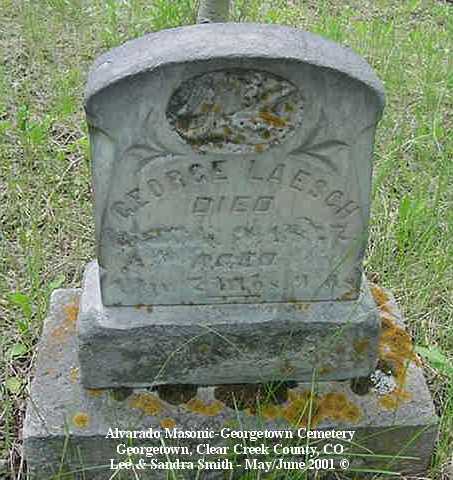 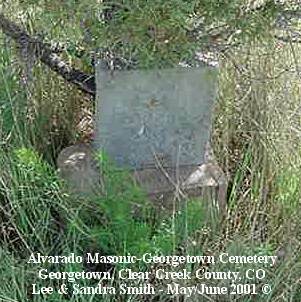 The Georgetown Cemetery was located on the south shore of the lake at Georgetown, Colorado until approximately 1970. 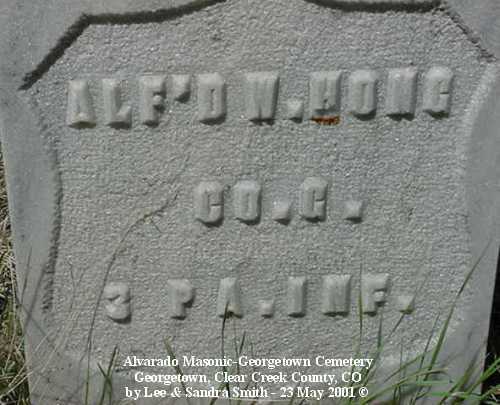 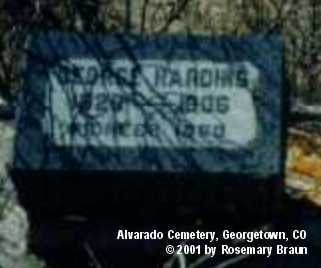 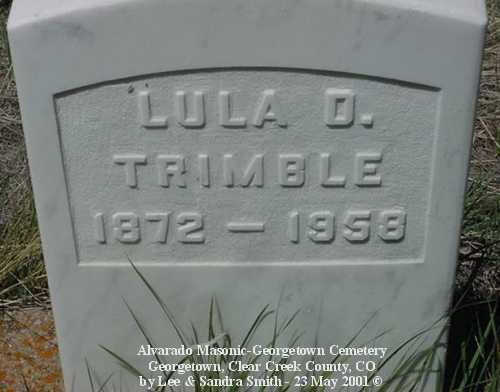 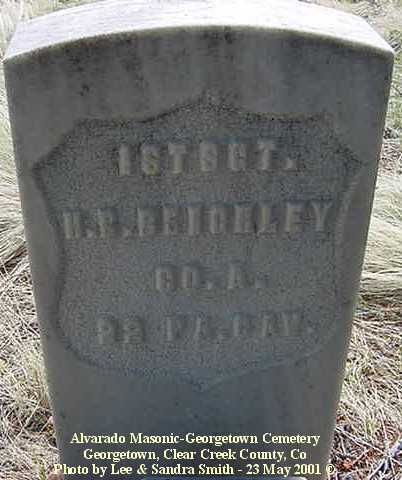 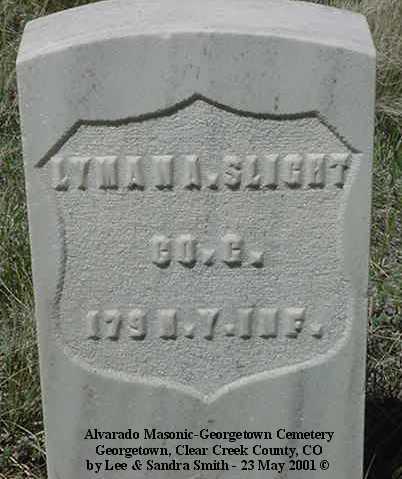 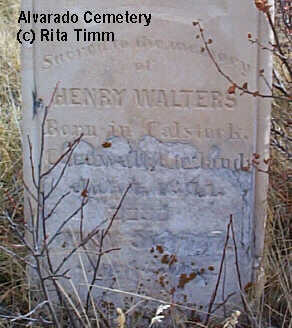 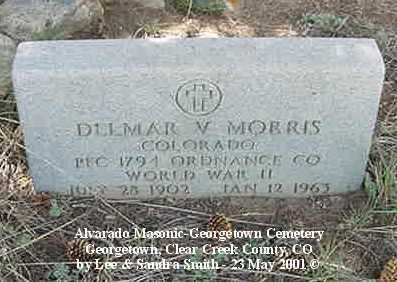 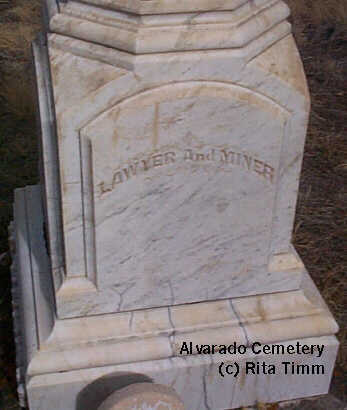 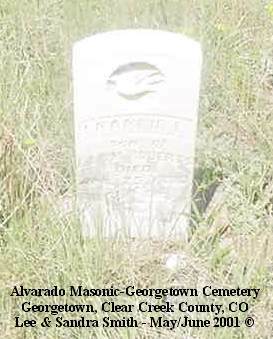 At that time the cemetery was moved to the Masonic Alvarado Cemetery. 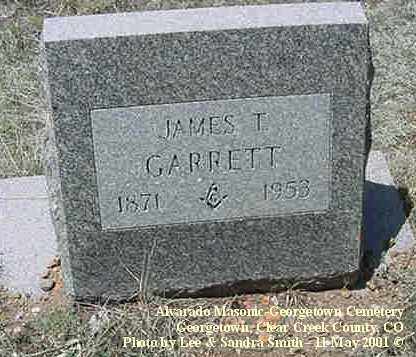 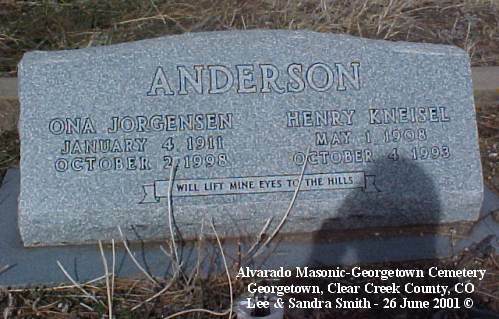 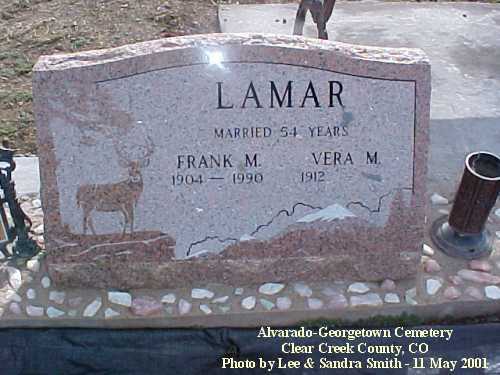 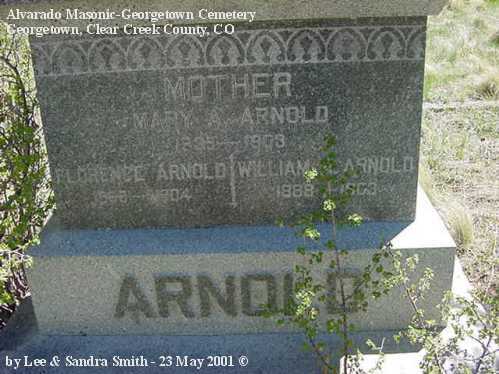 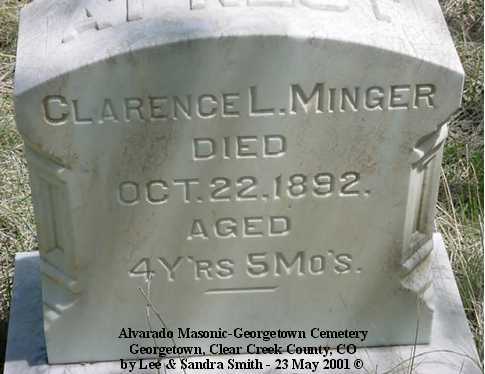 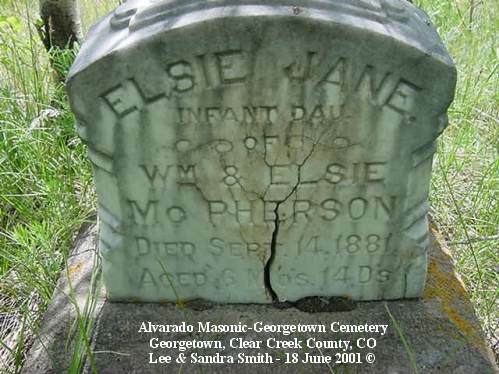 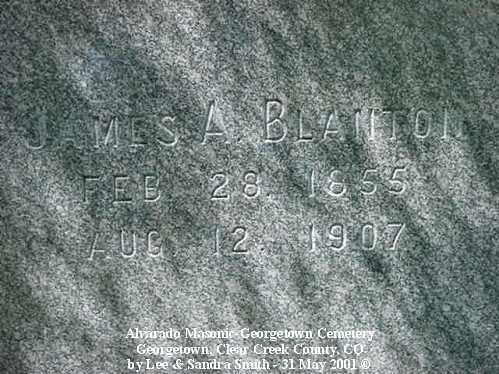 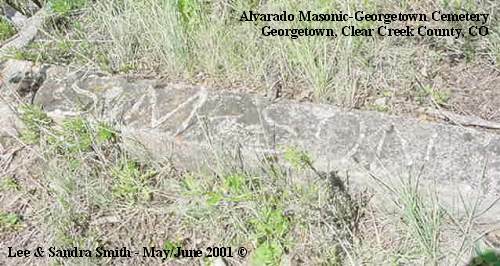 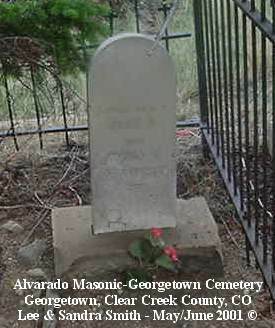 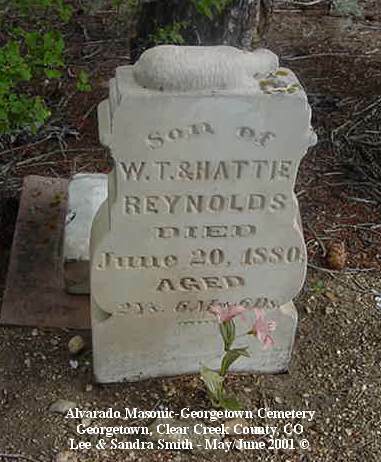 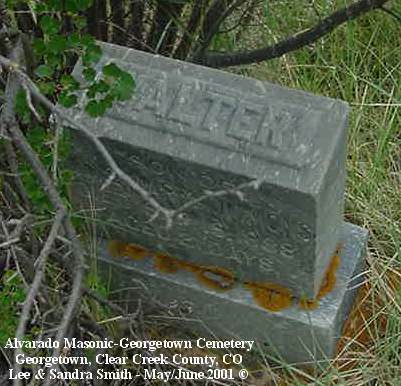 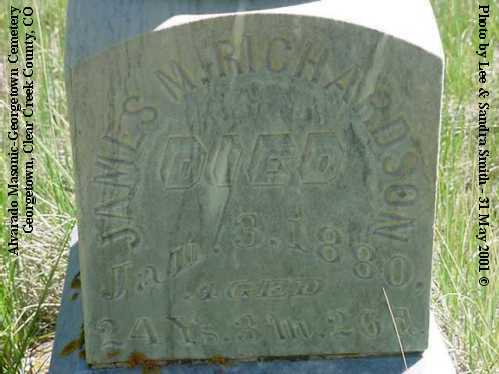 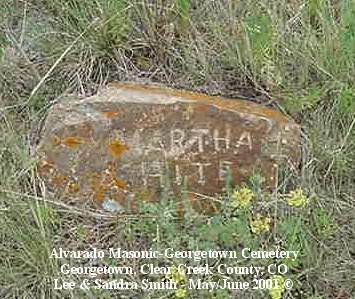 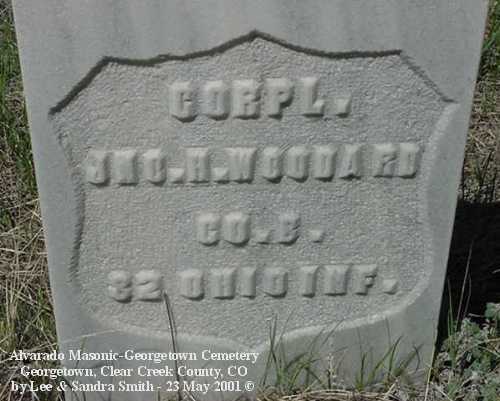 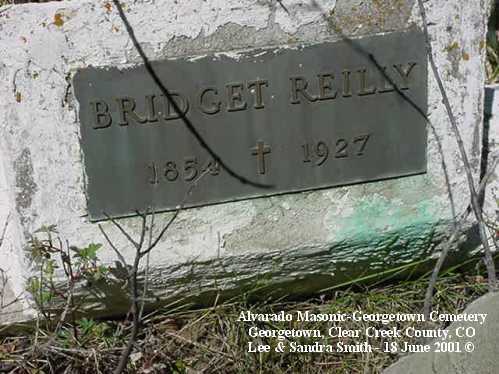 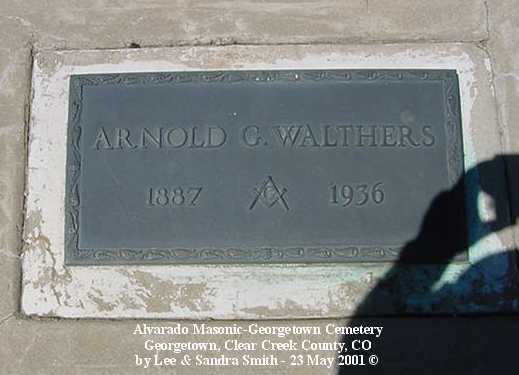 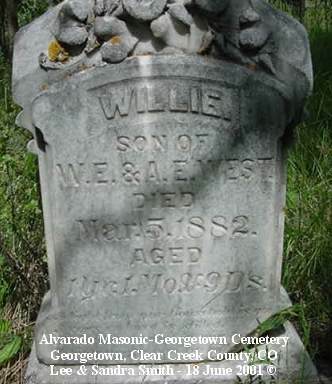 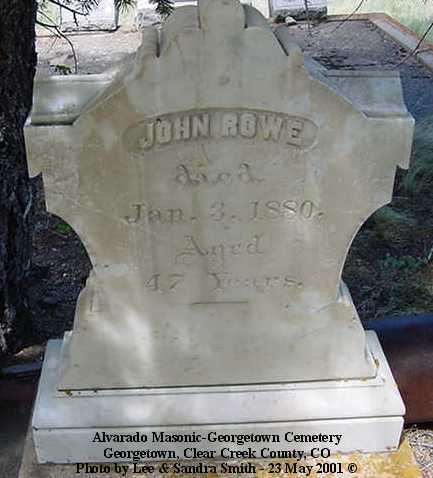 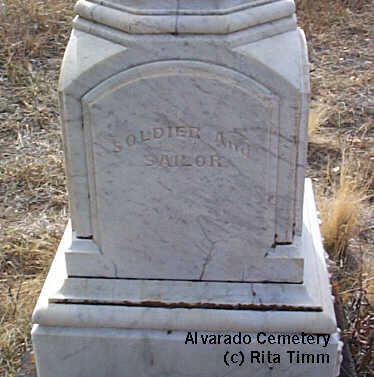 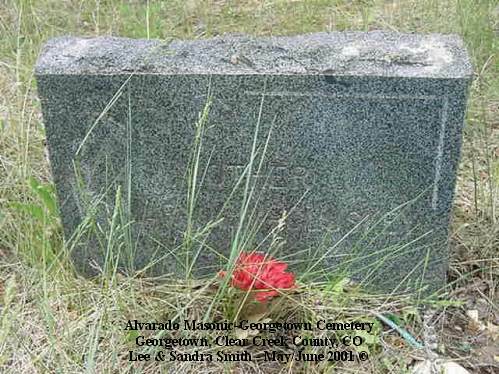 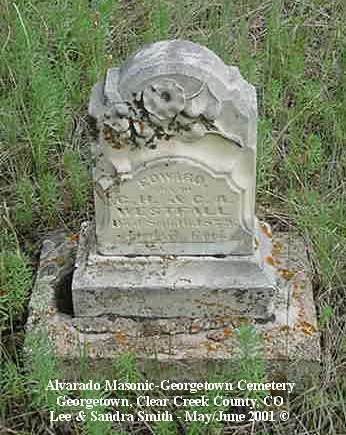 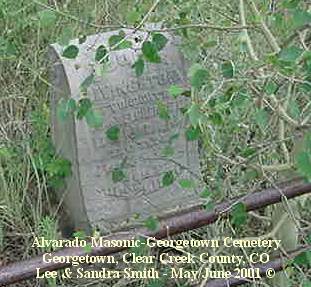 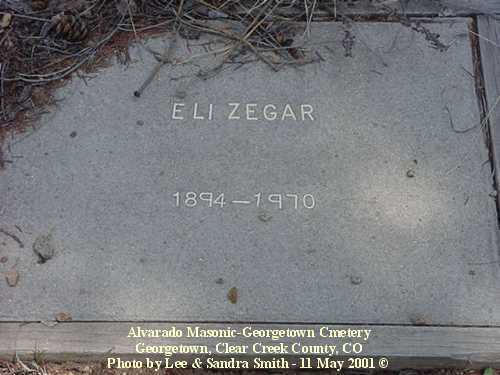 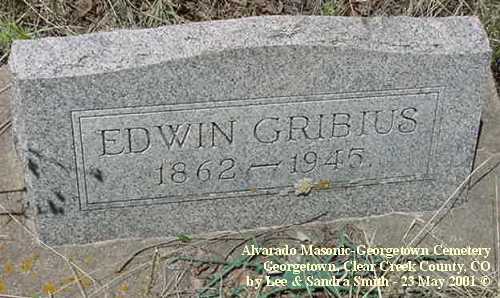 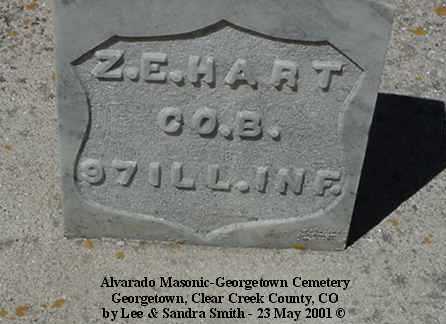 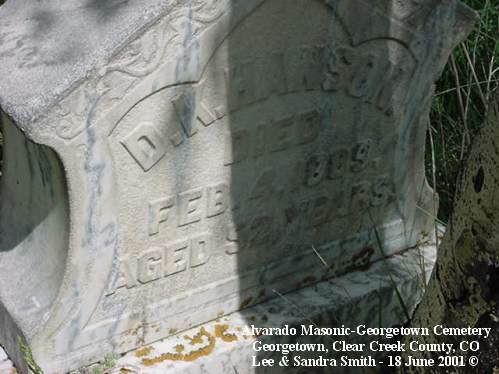 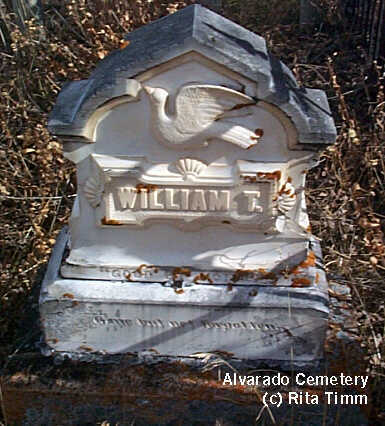 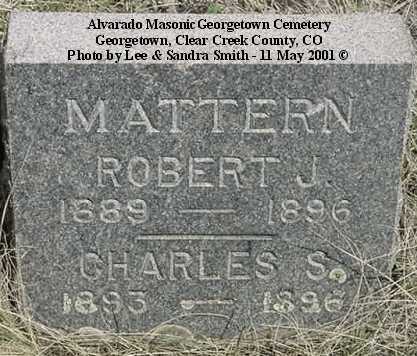 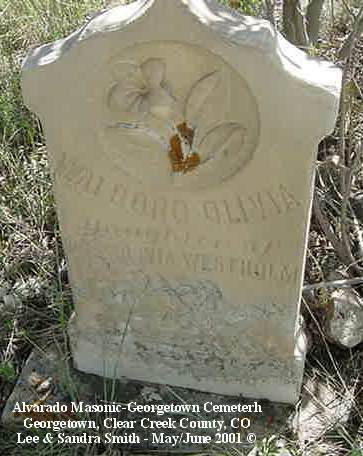 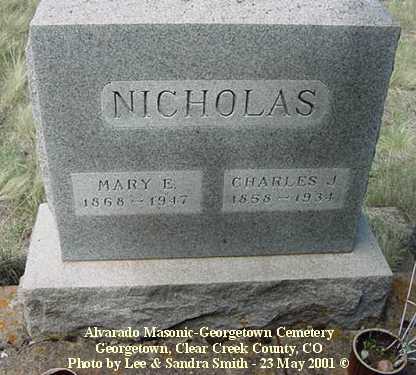 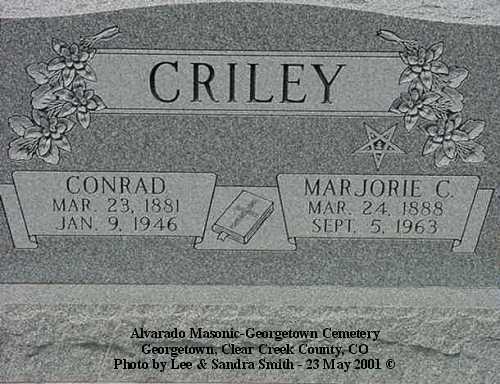 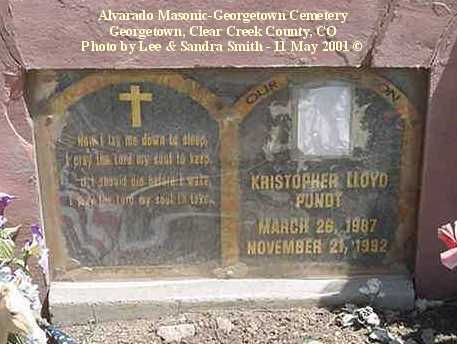 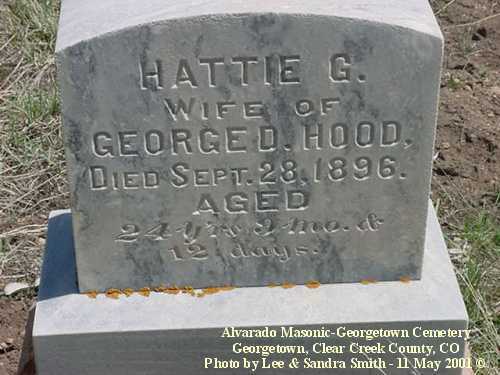 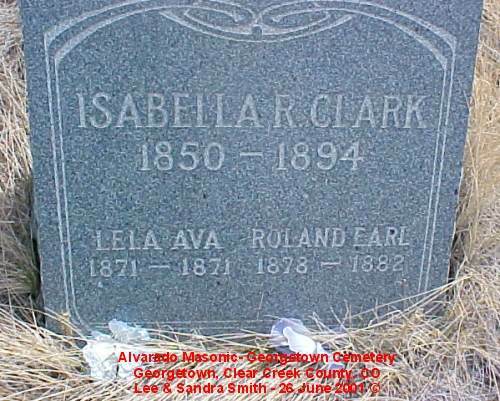 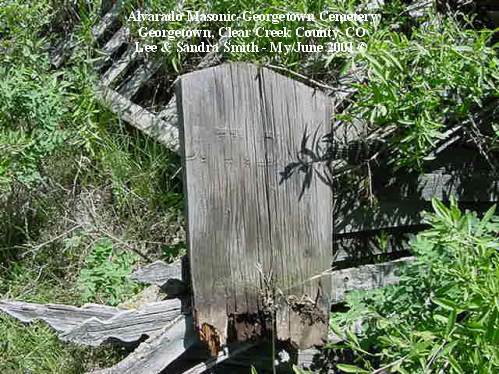 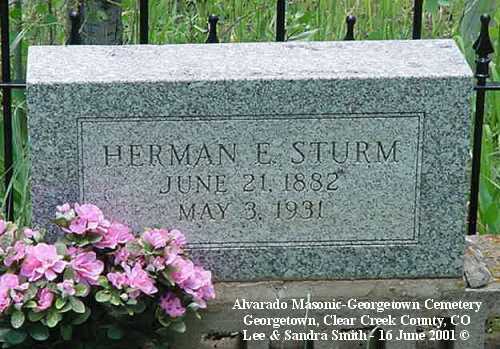 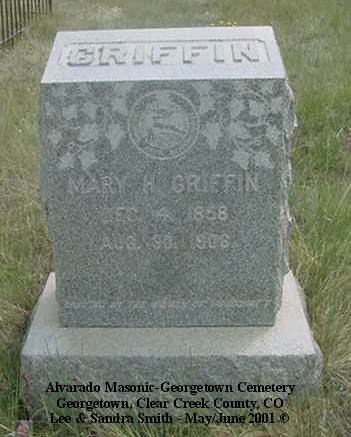 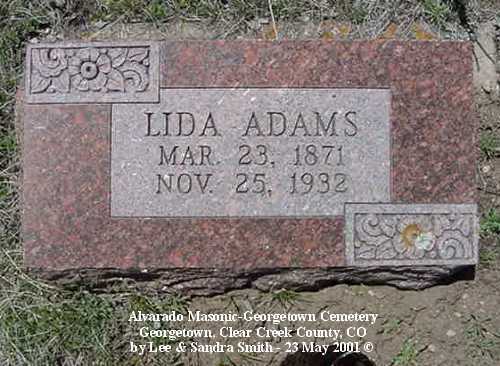 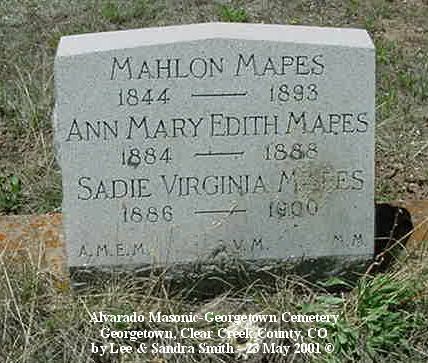 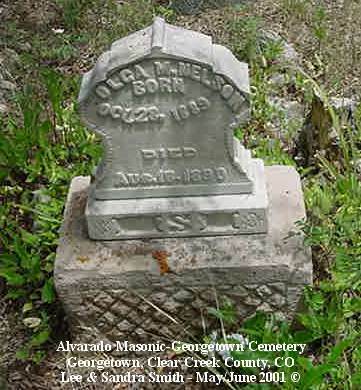 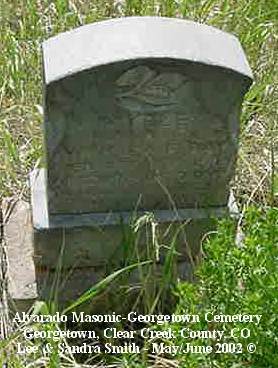 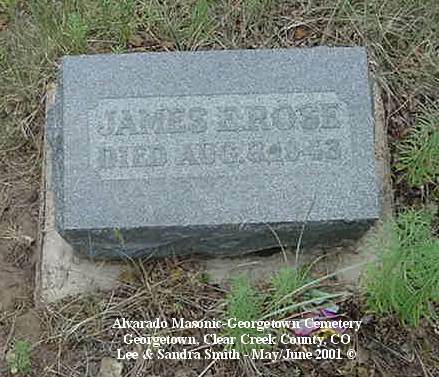 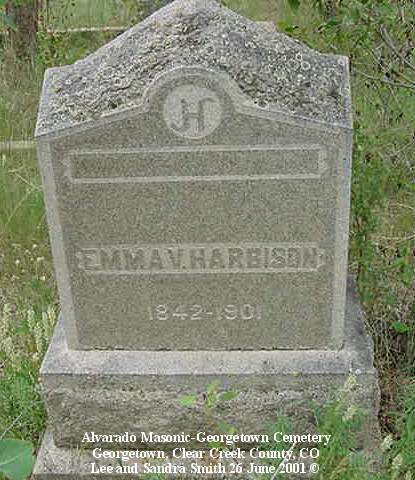 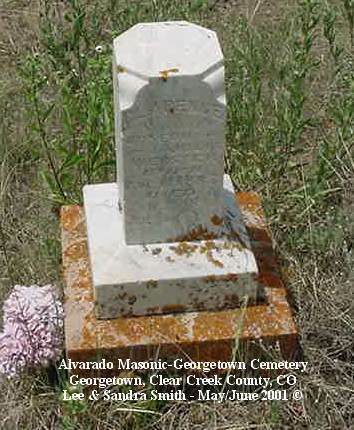 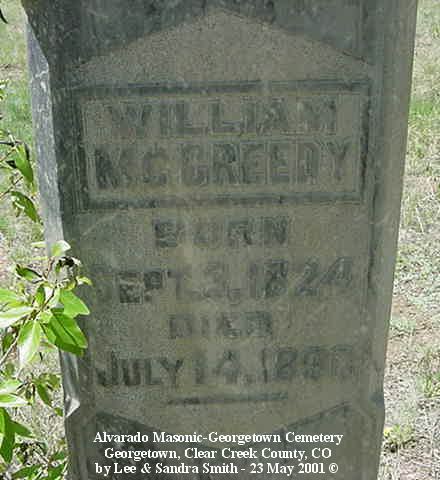 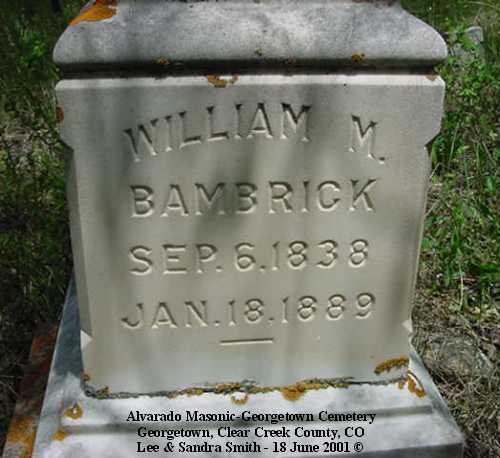 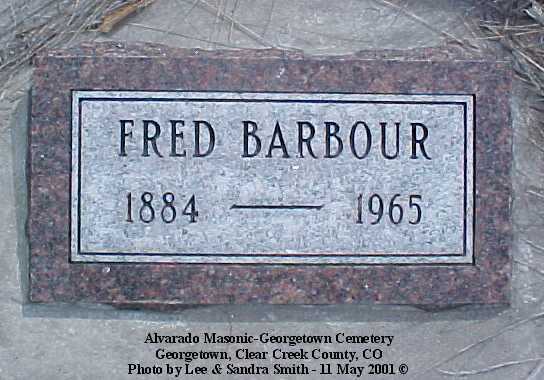 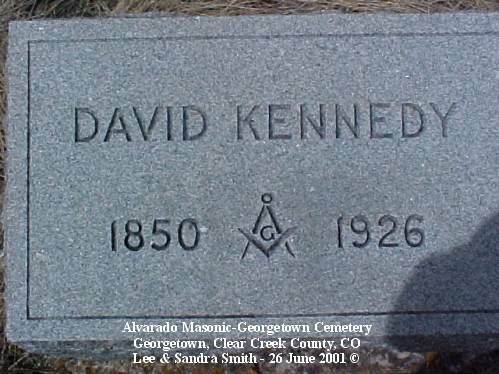 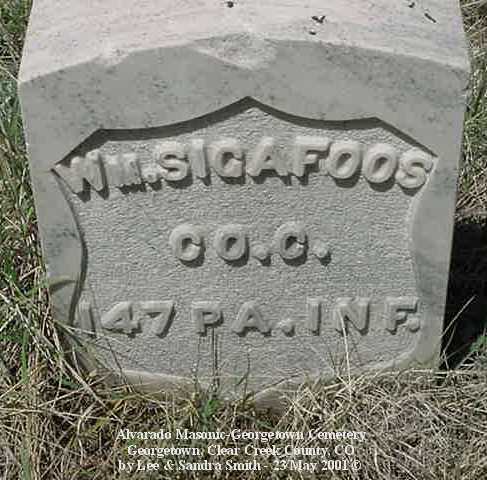 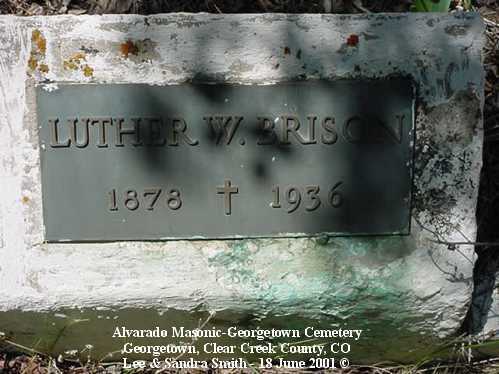 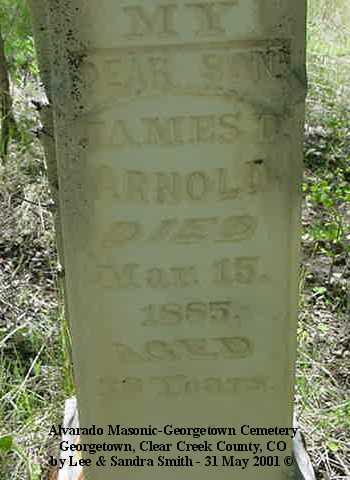 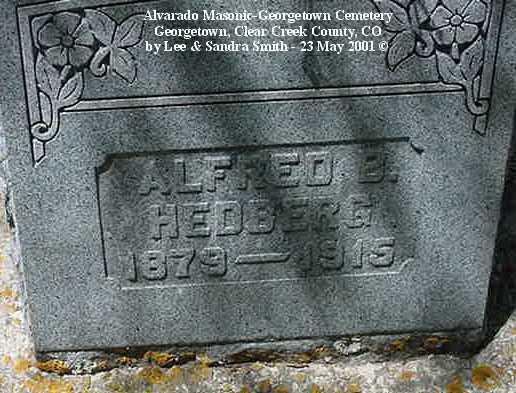 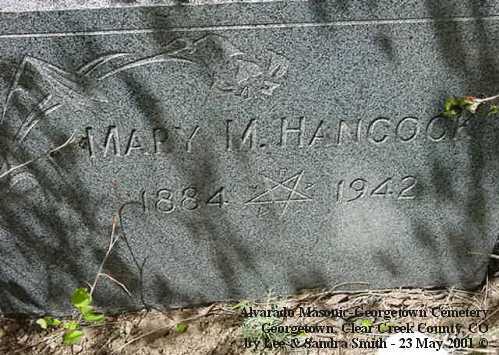 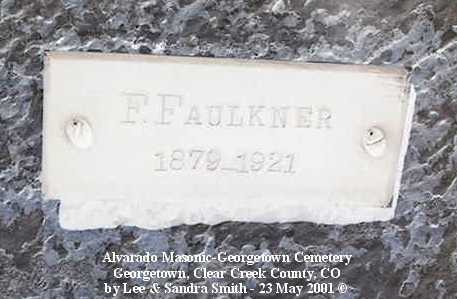 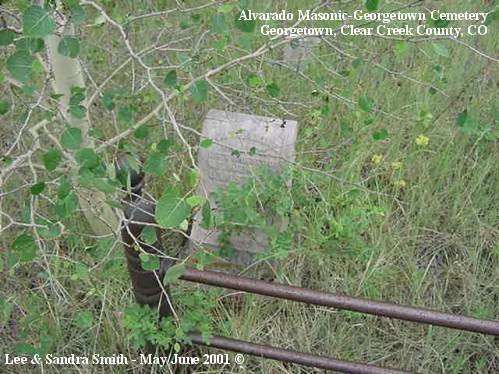 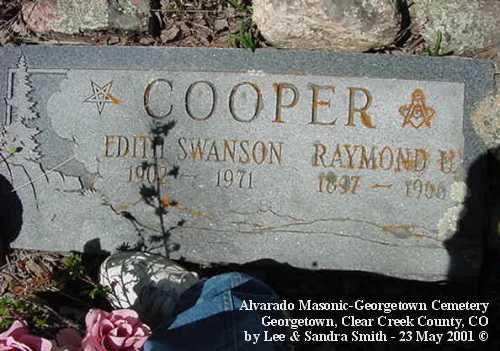 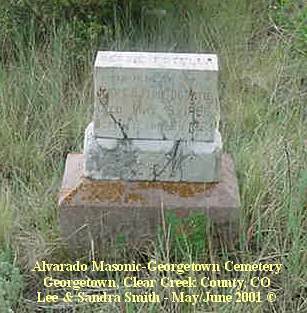 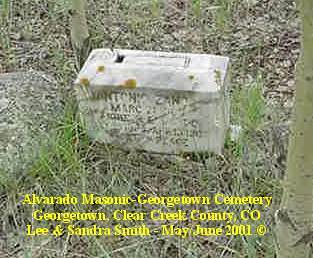 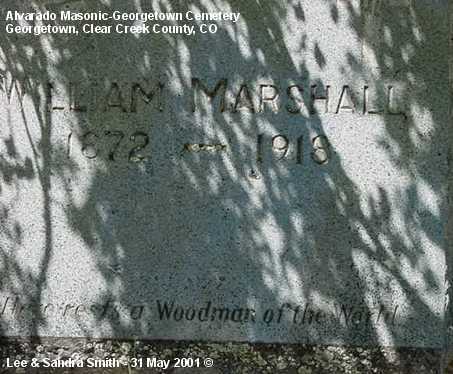 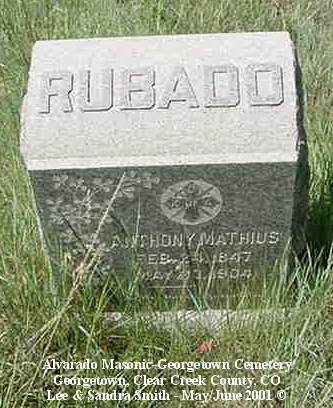 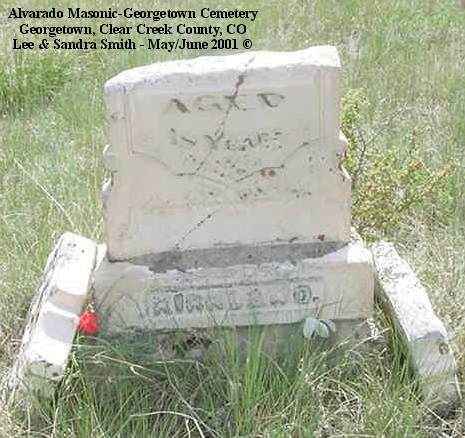 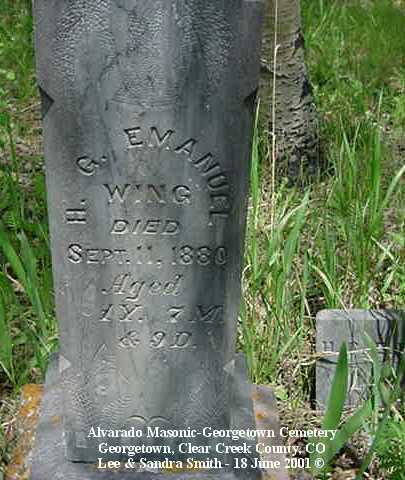 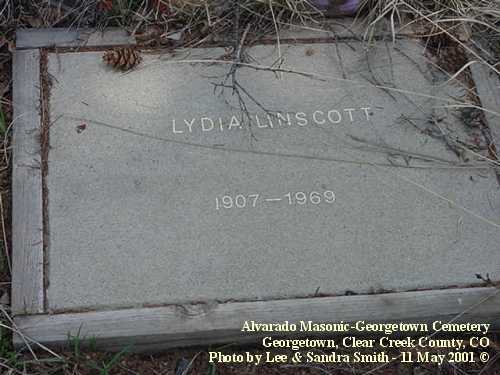 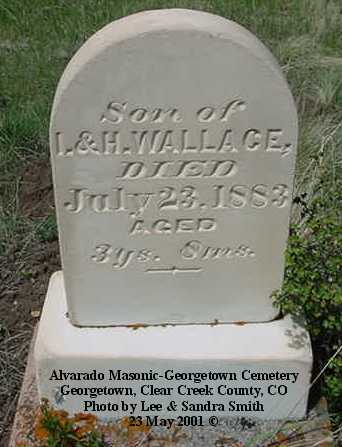 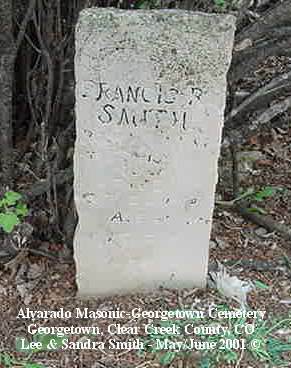 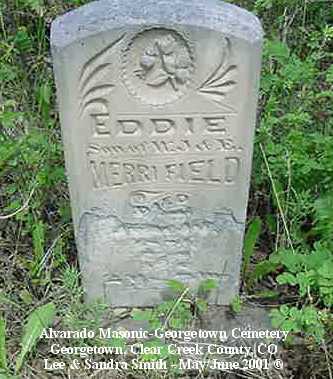 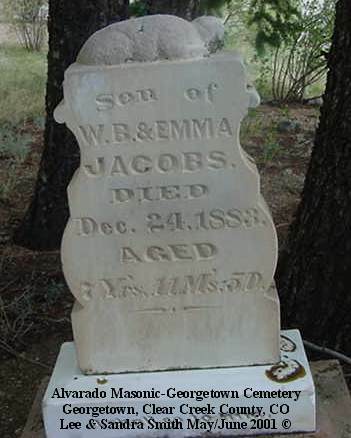 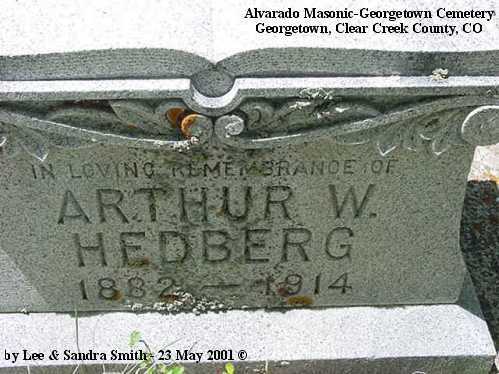 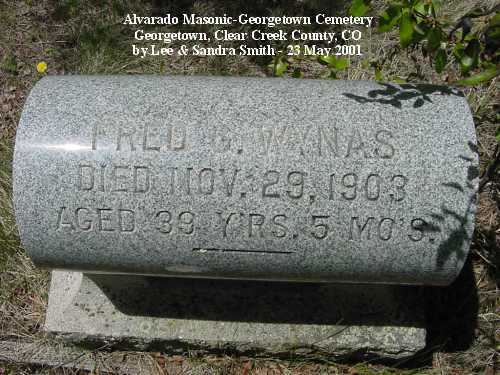 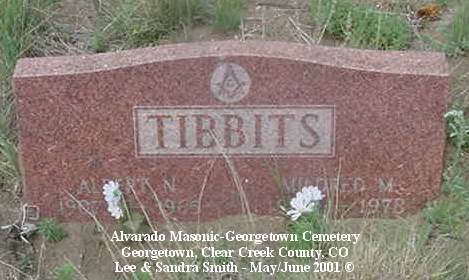 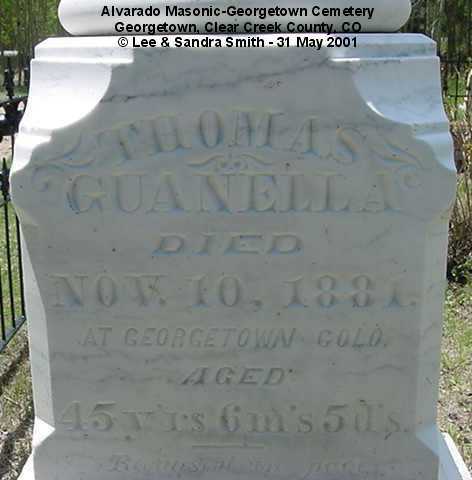 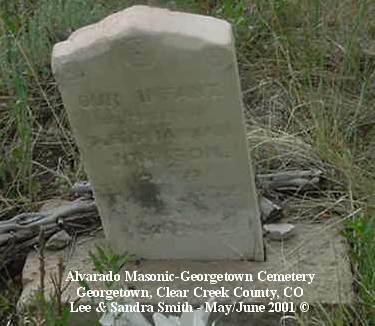 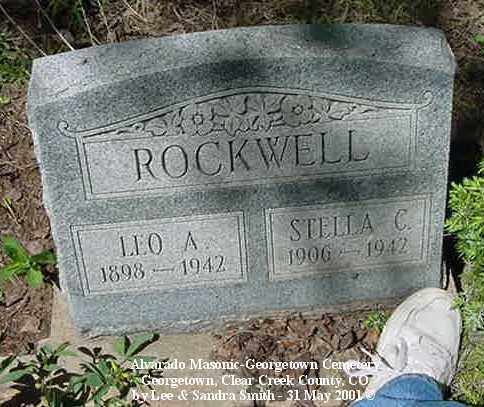 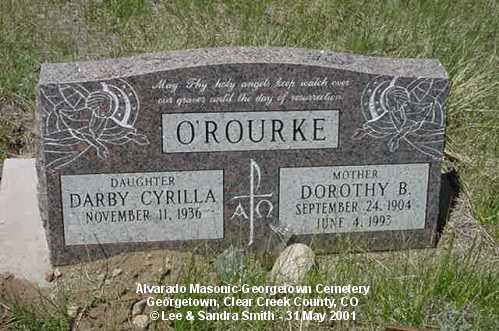 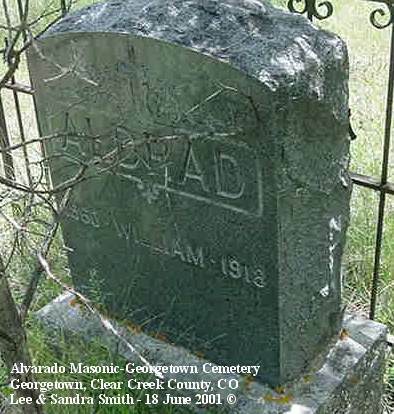 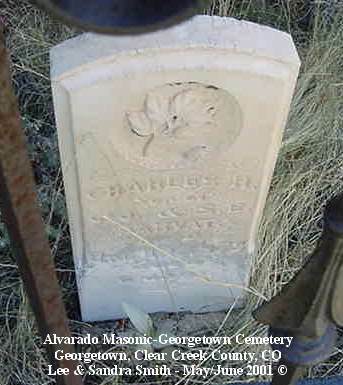 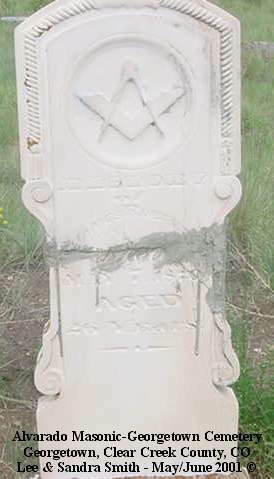 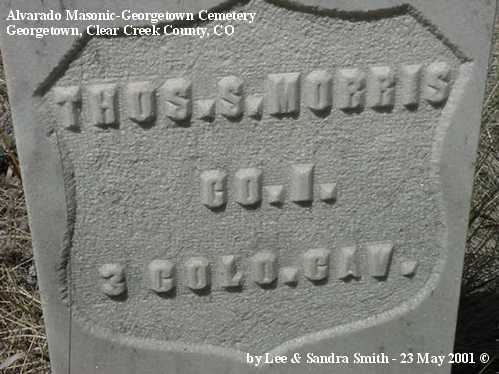 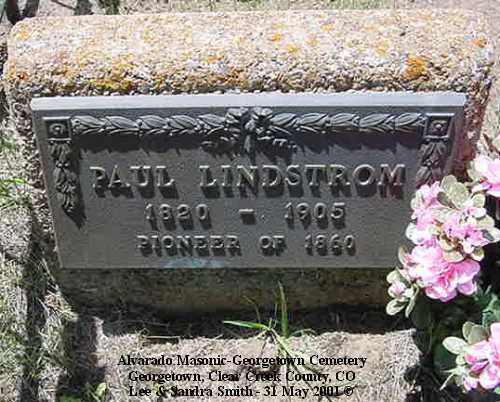 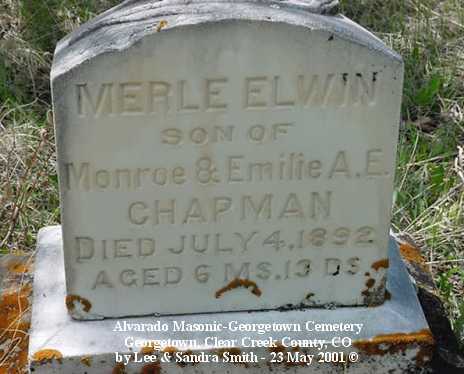 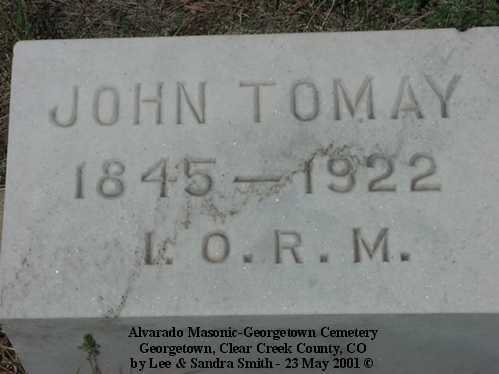 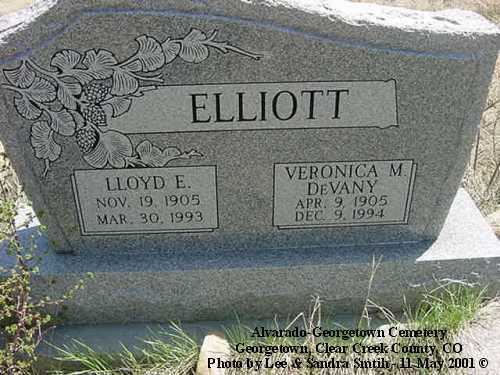 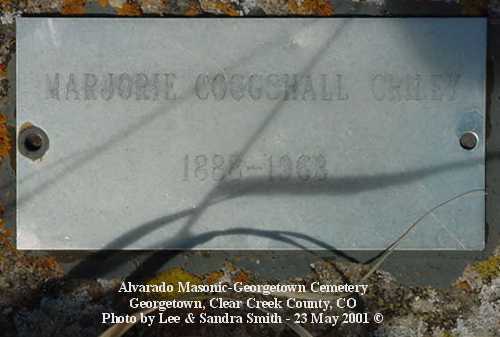 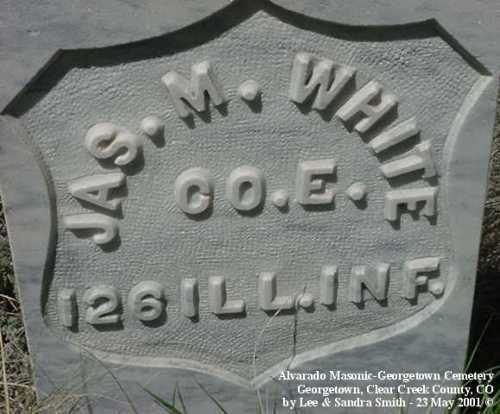 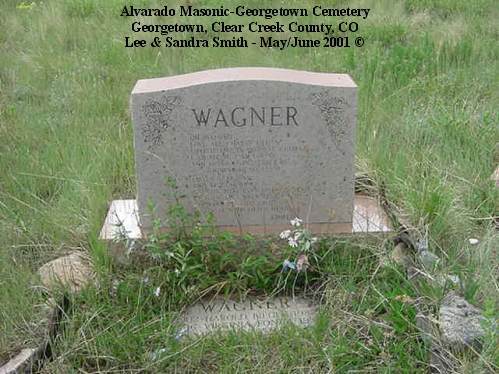 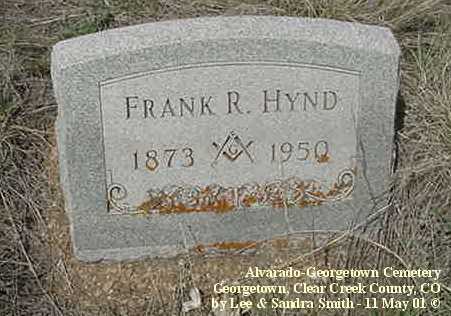 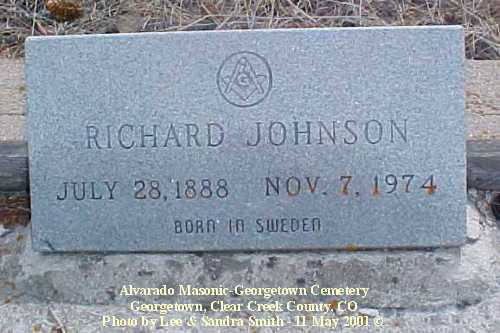 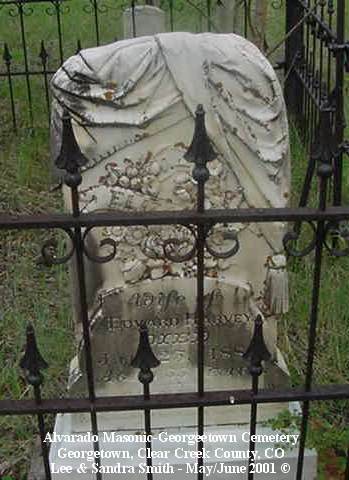 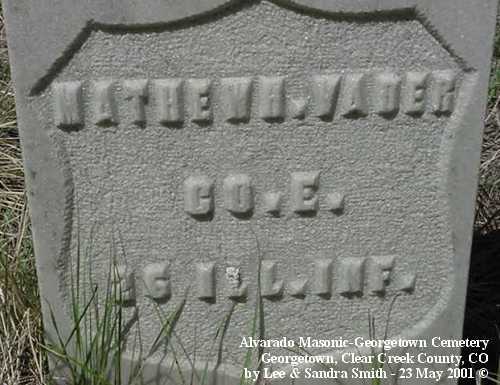 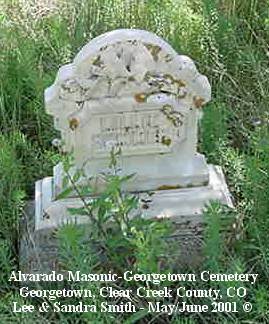 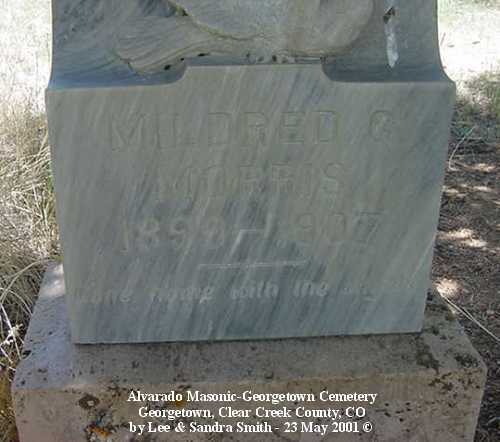 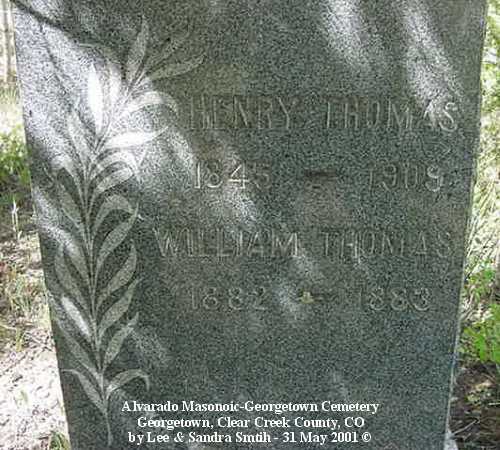 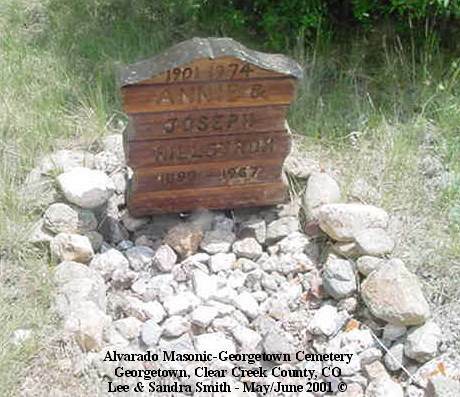 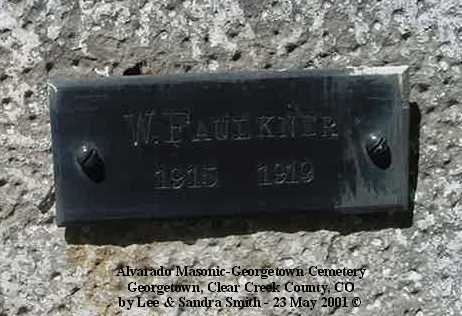 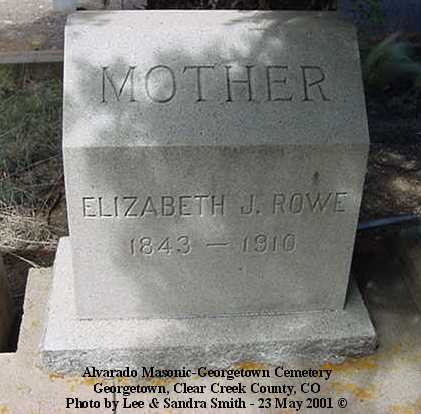 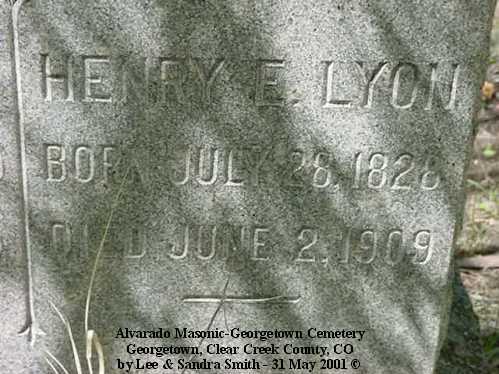 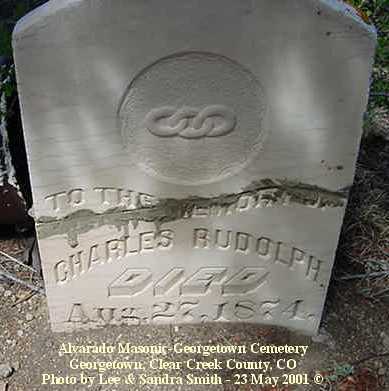 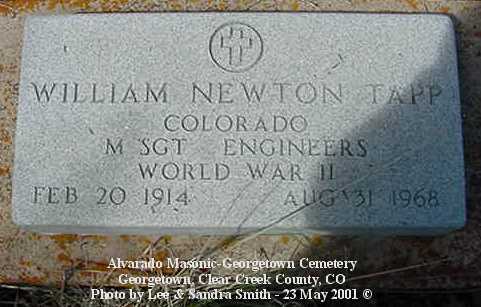 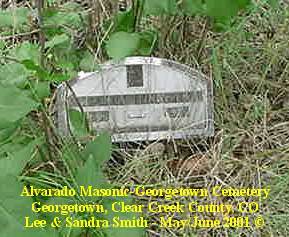 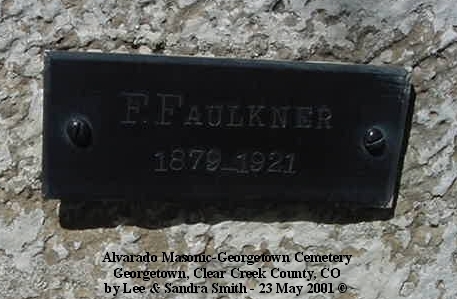 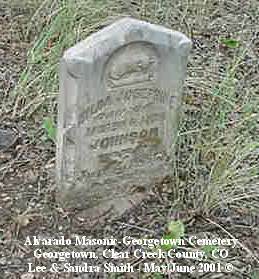 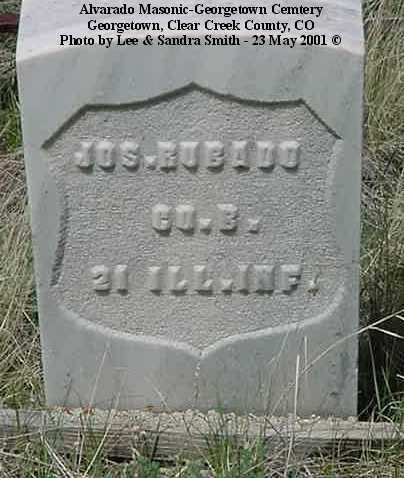 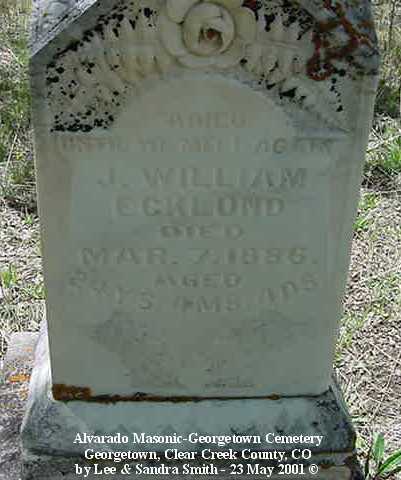 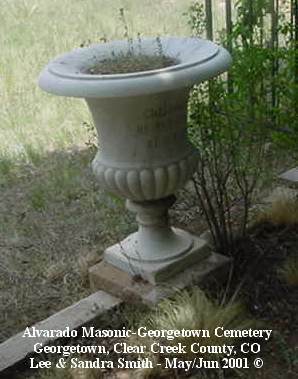 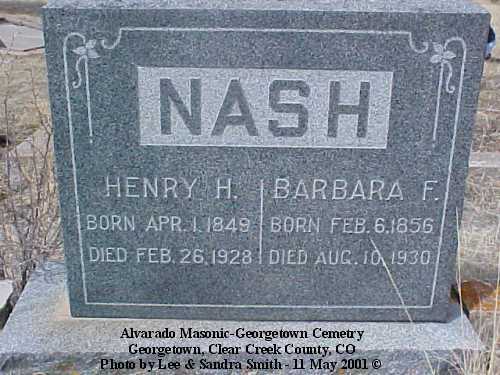 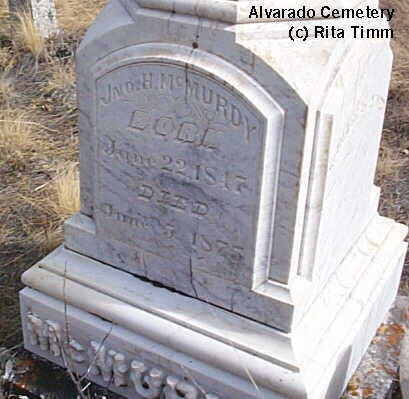 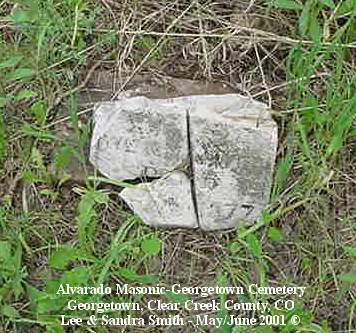 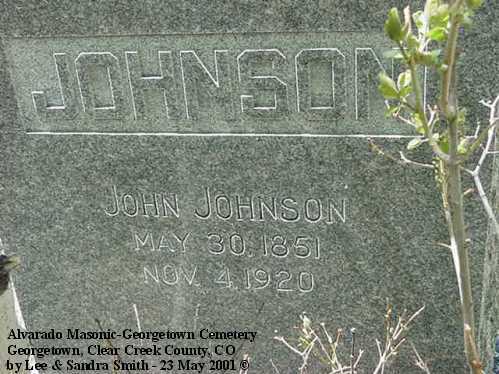 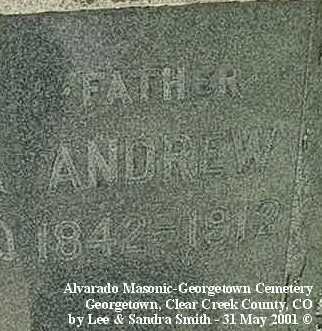 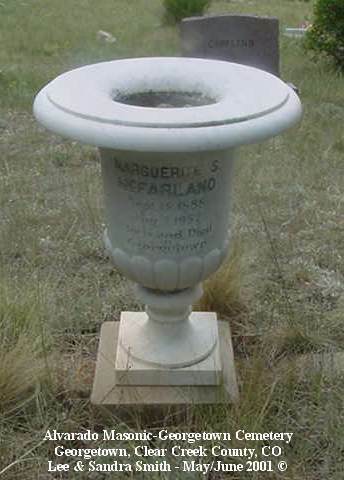 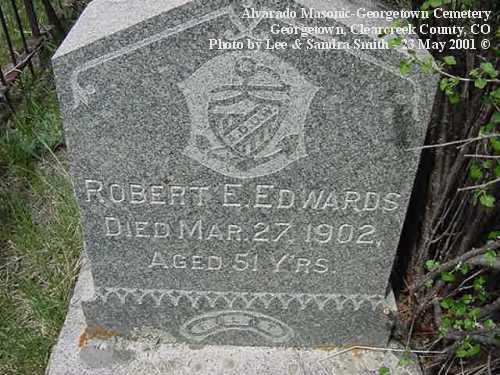 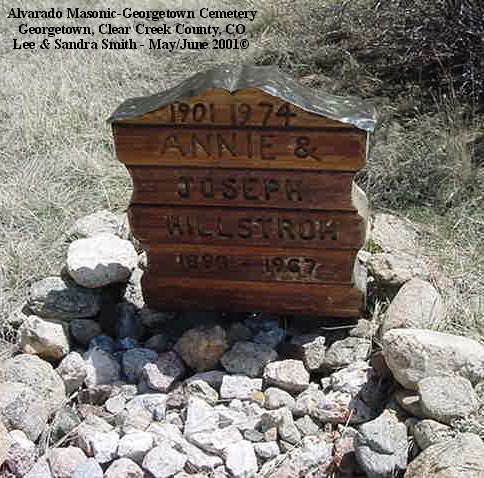 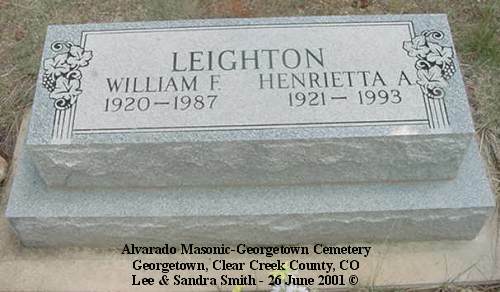 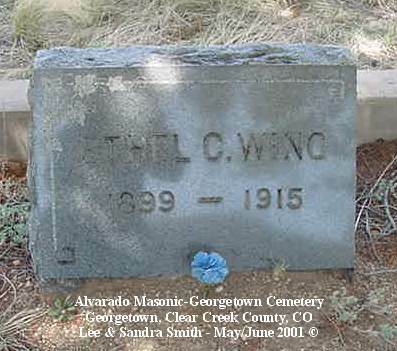 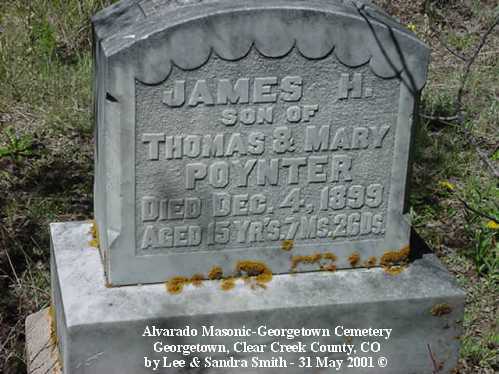 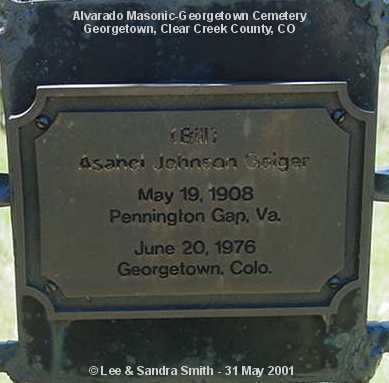 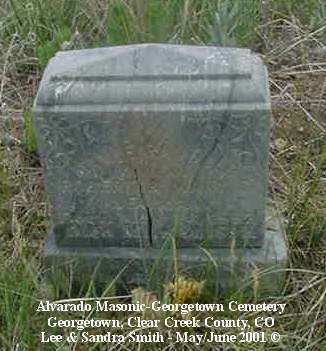 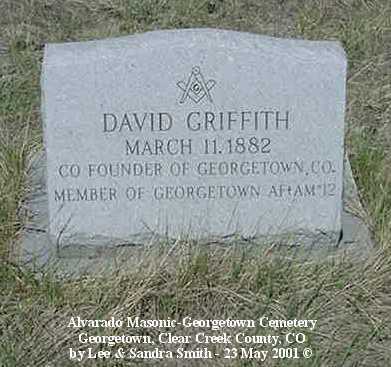 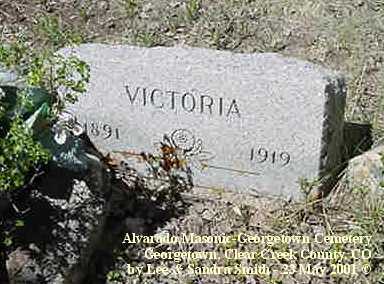 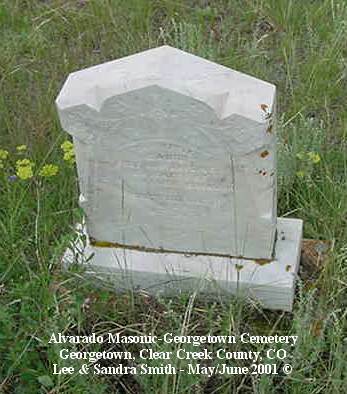 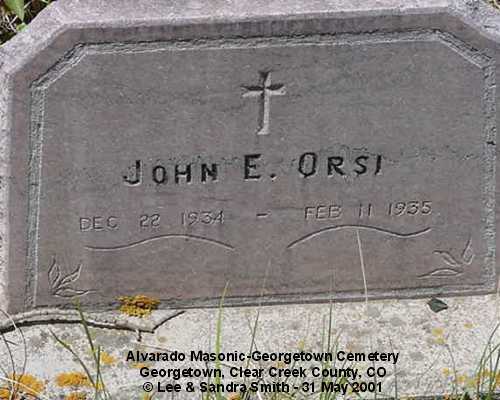 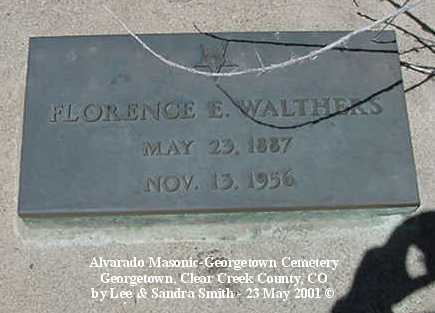 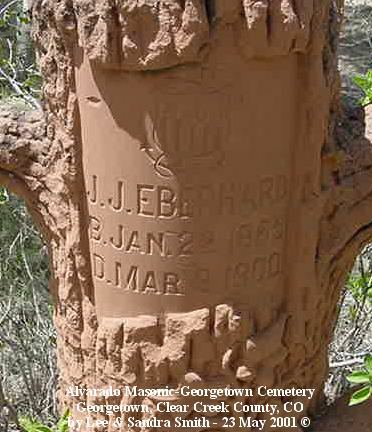 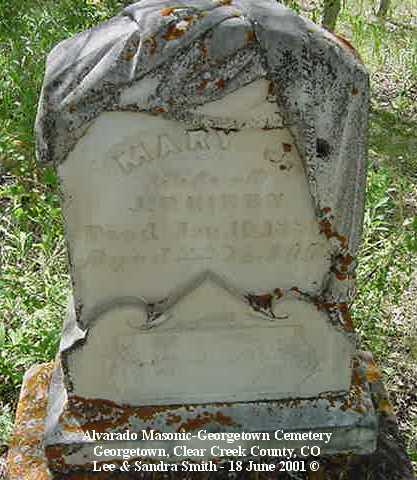 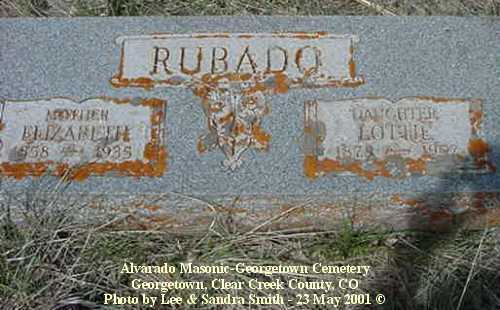 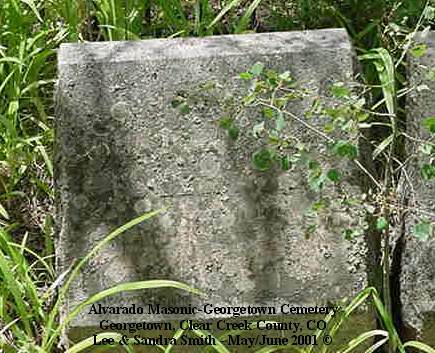 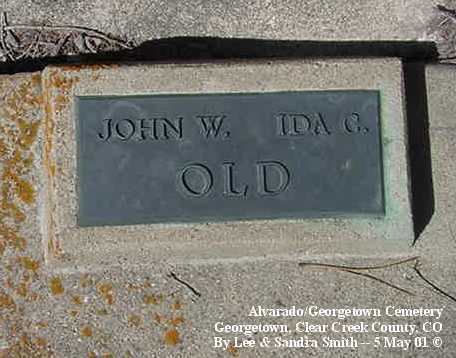 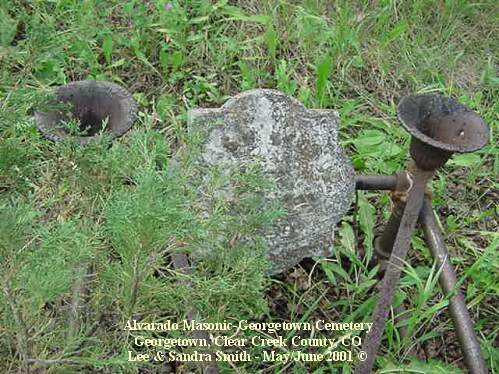 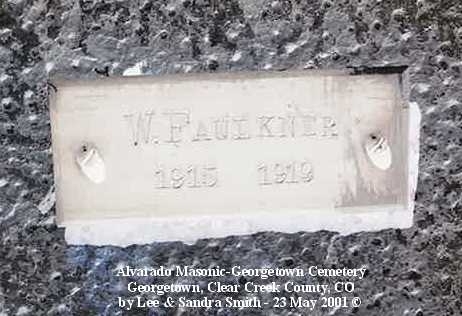 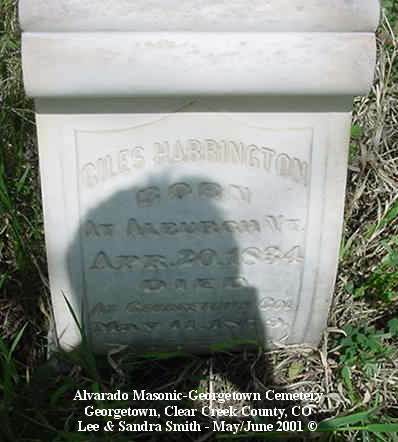 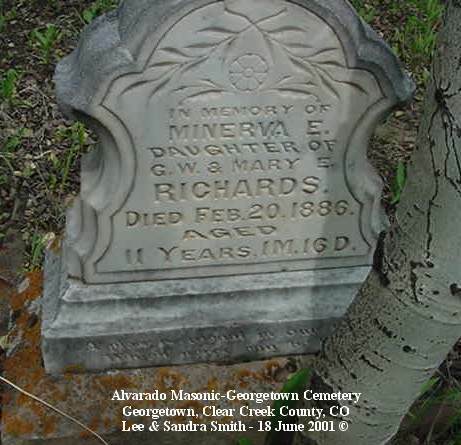 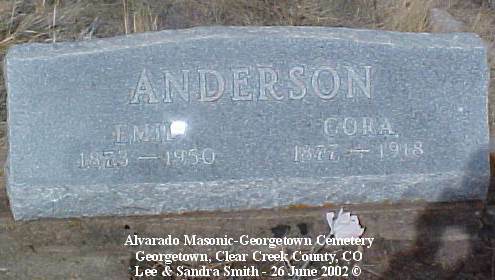 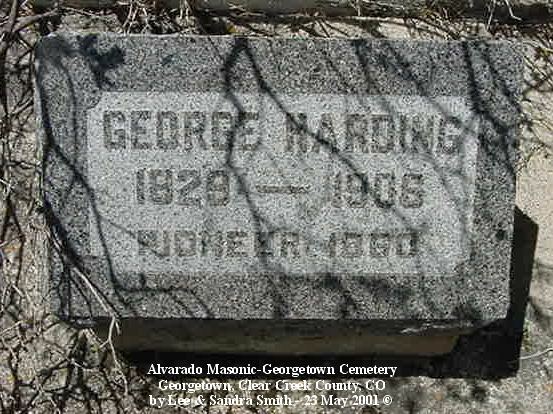 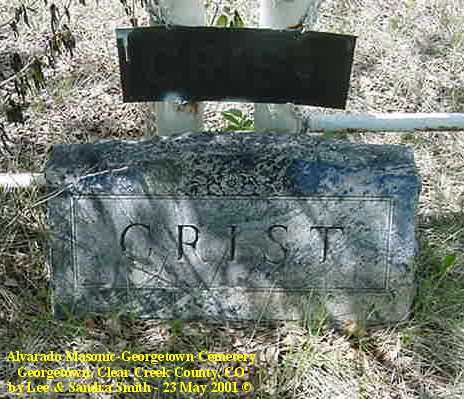 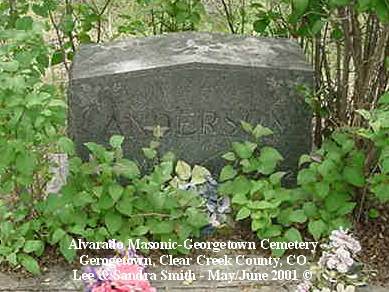 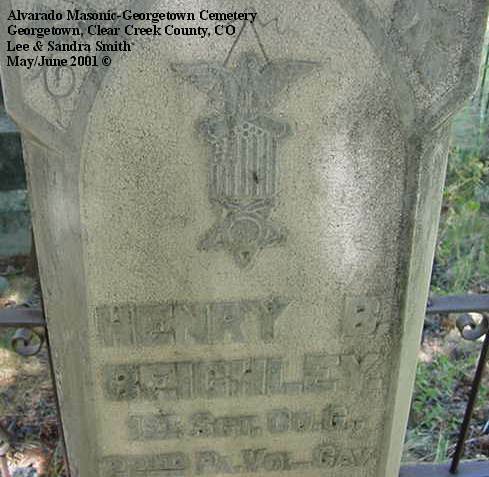 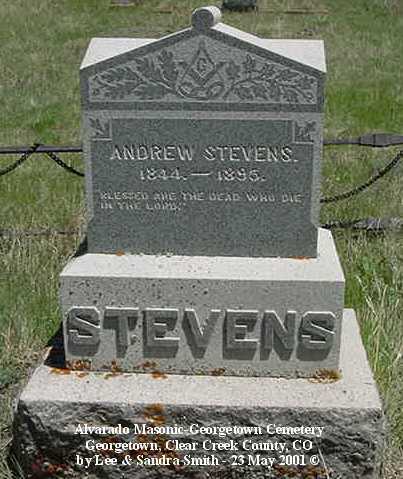 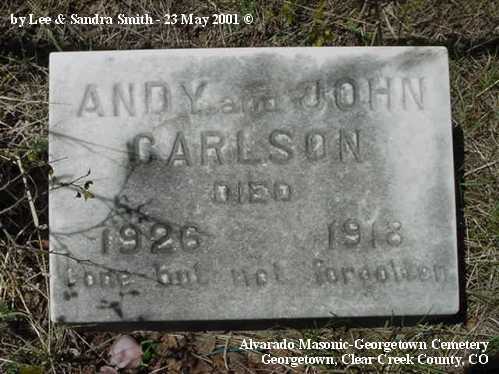 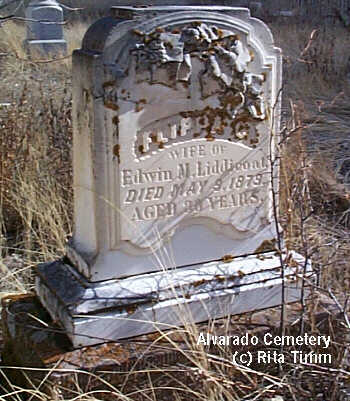 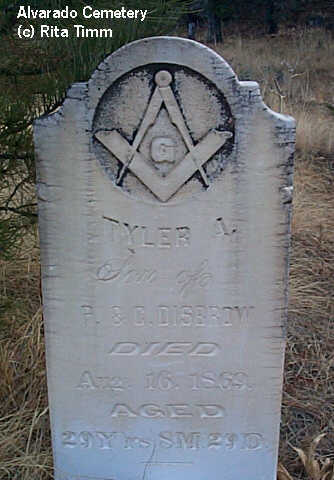 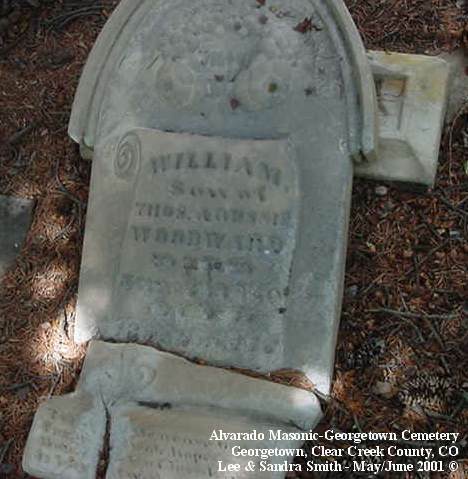 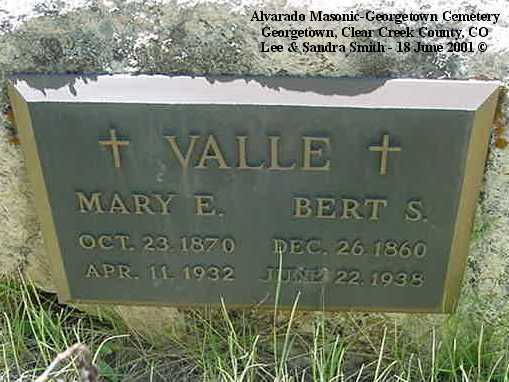 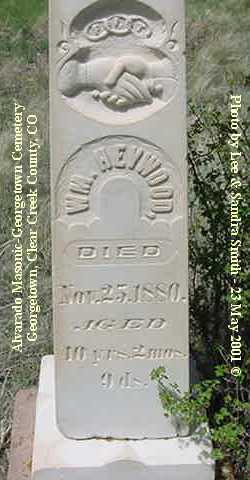 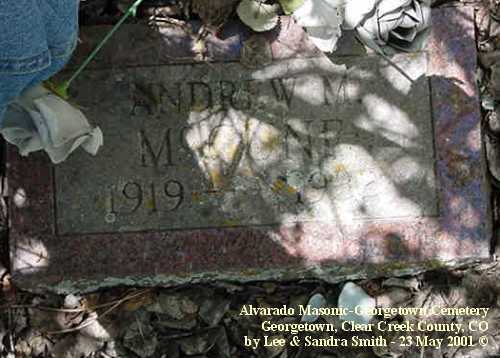 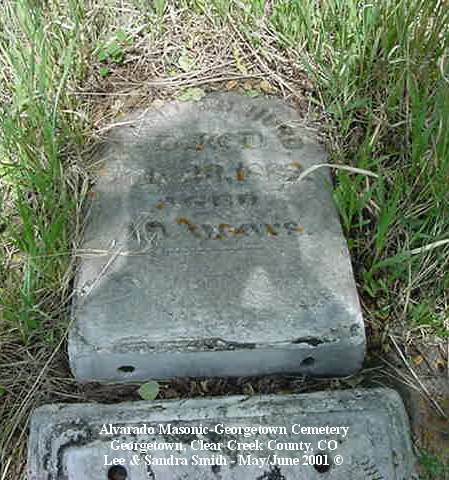 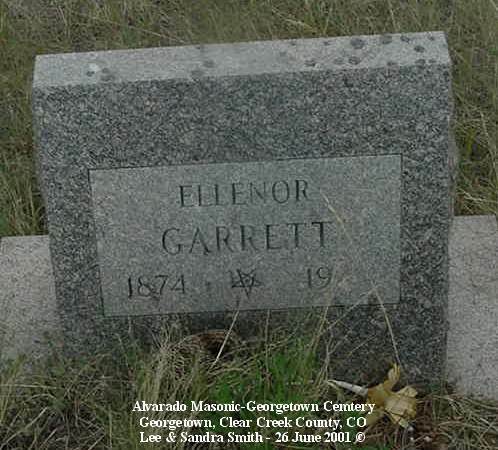 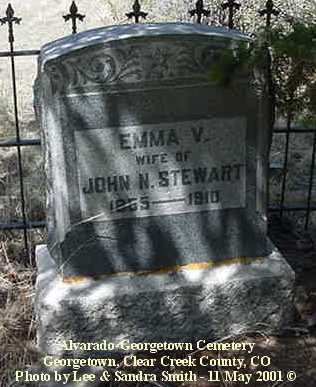 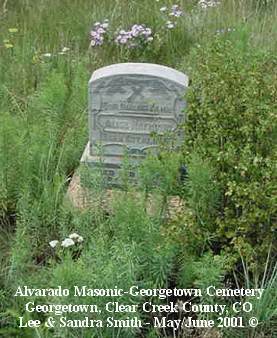 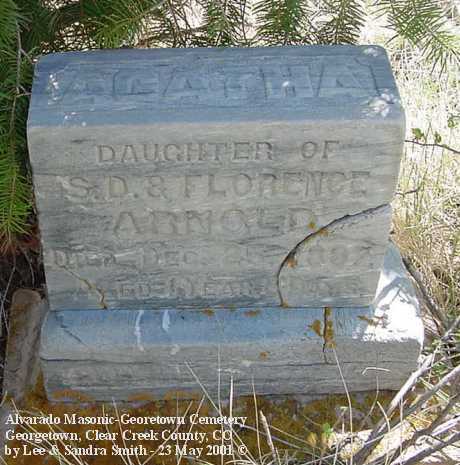 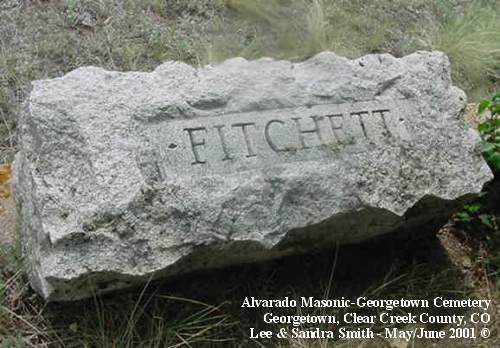 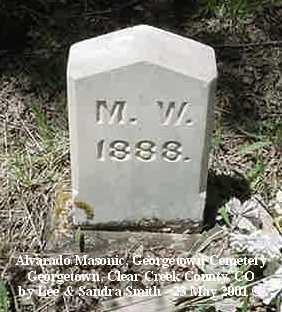 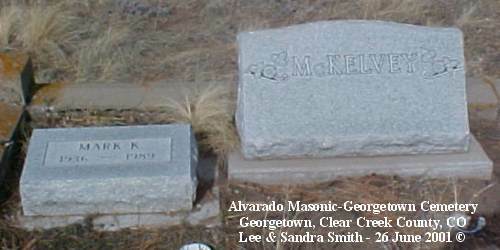 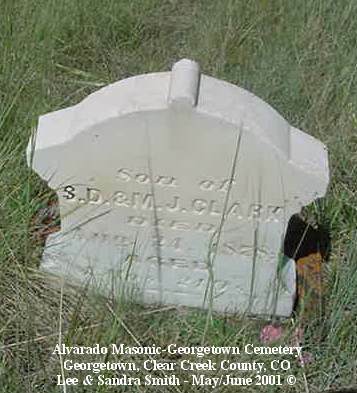 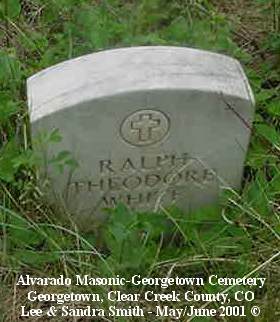 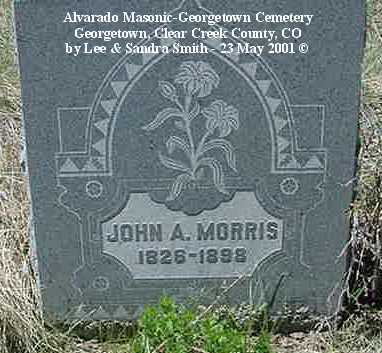 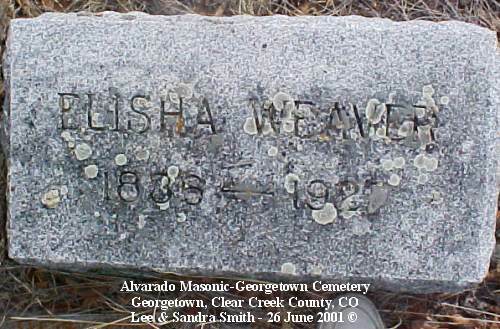 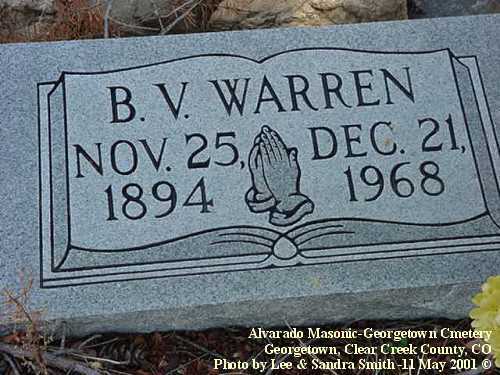 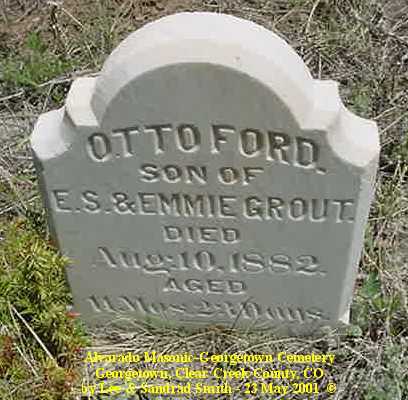 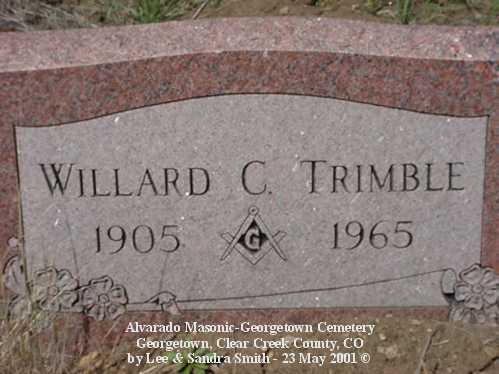 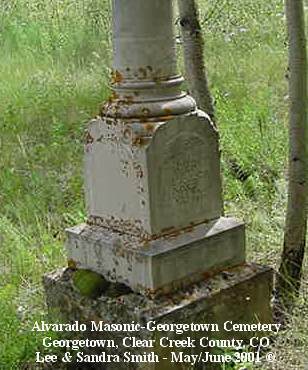 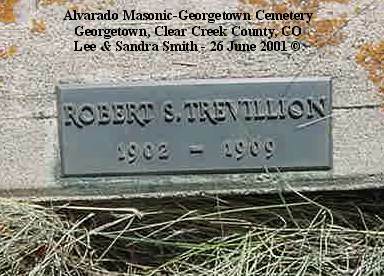 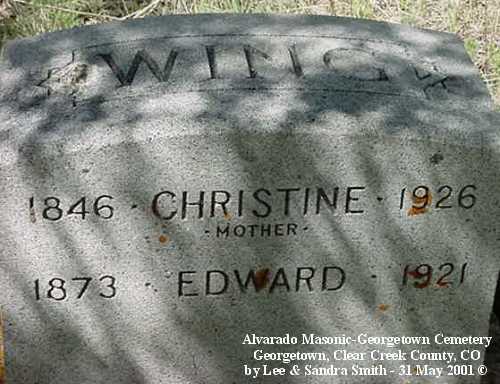 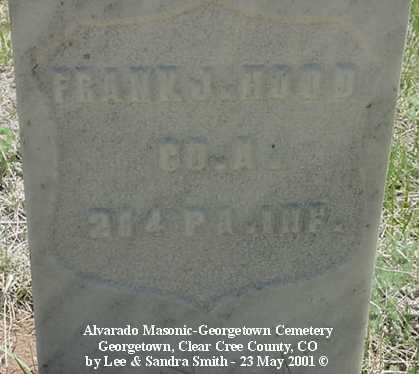 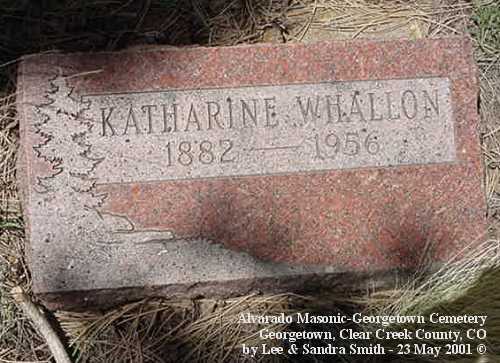 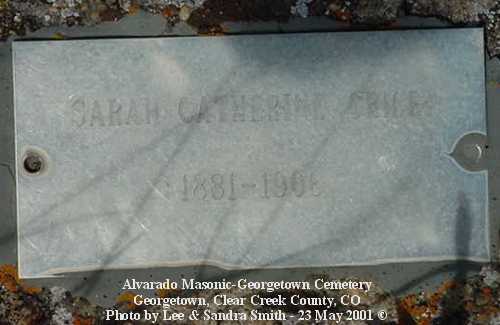 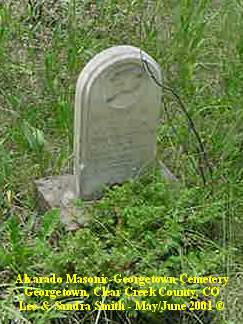 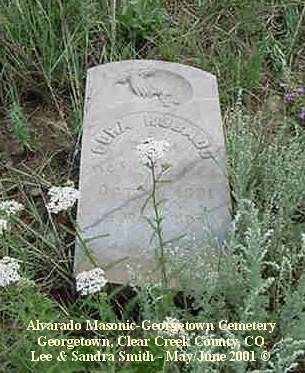 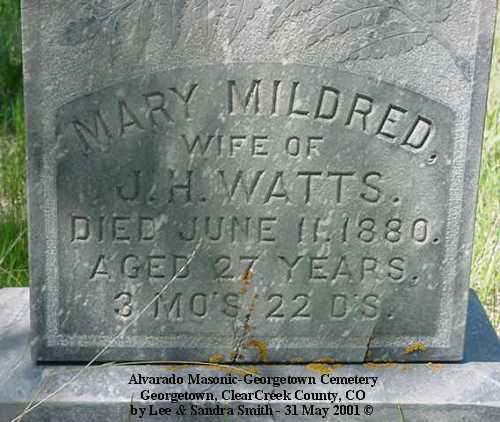 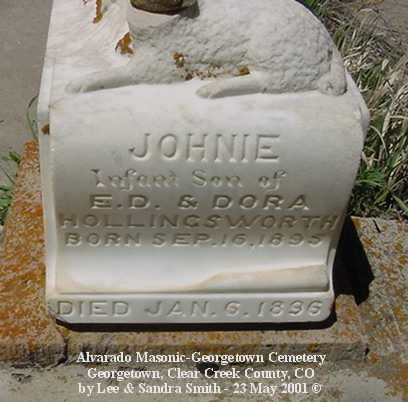 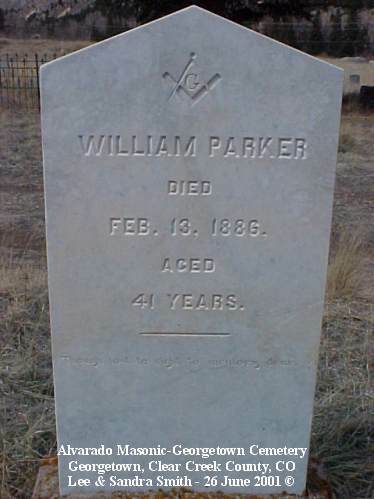 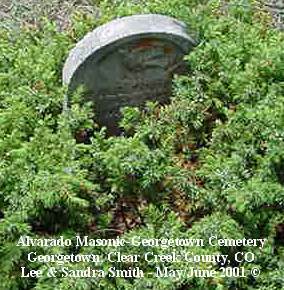 The Masons own the Alvarado cemetery and it is in no way connected to the town of Georgetown nor the county of Clear Creek. 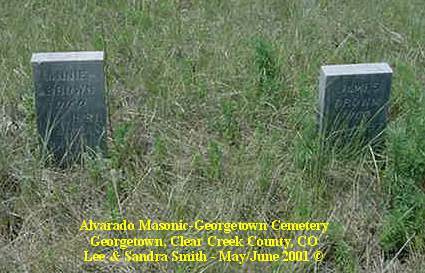 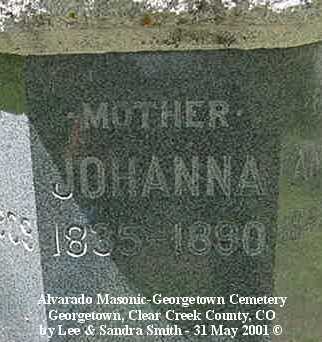 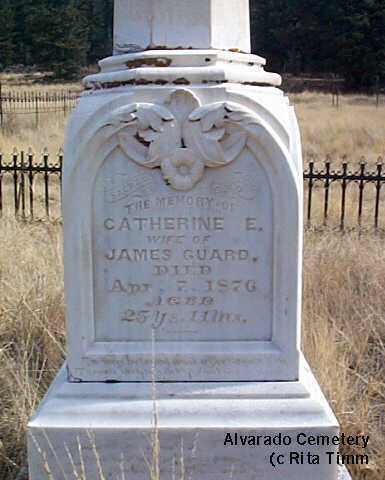 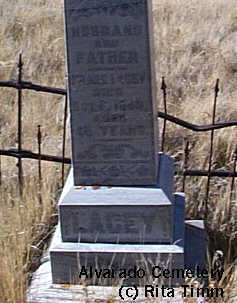 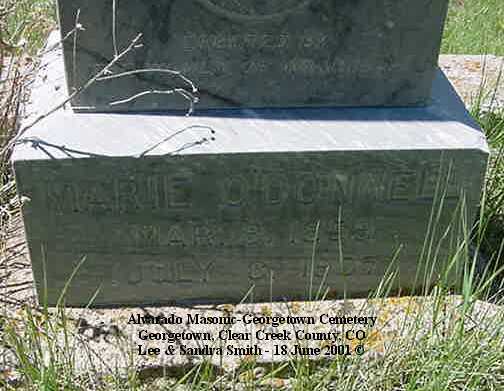 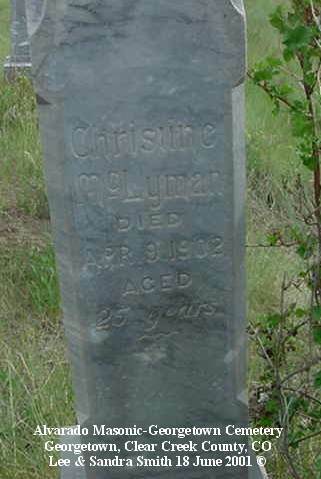 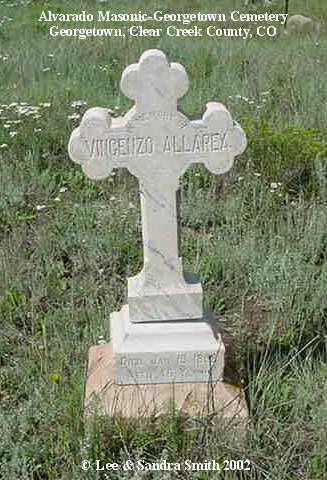 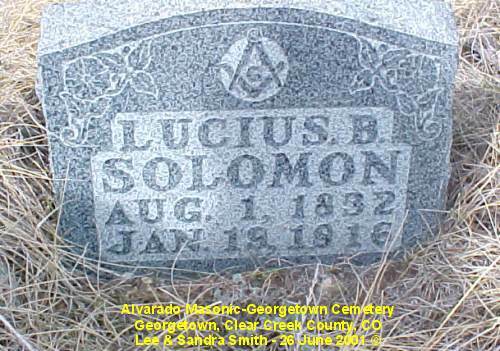 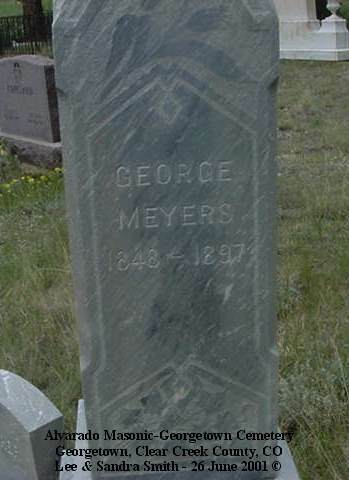 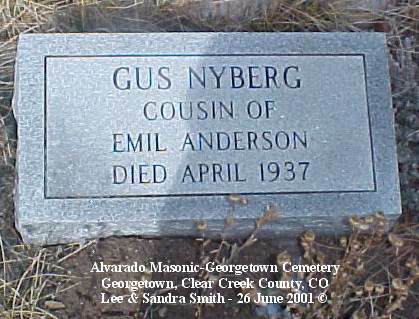 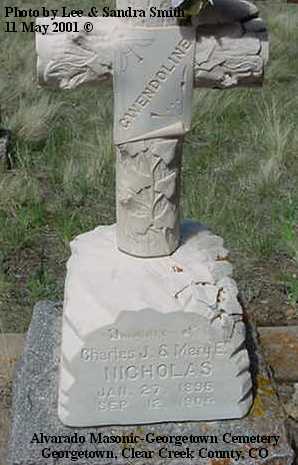 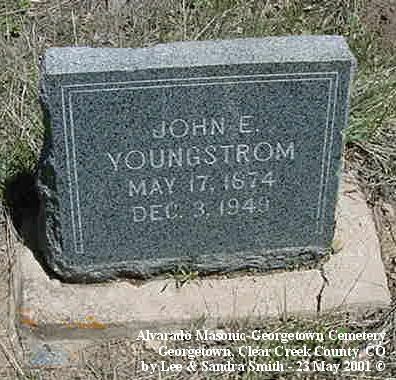 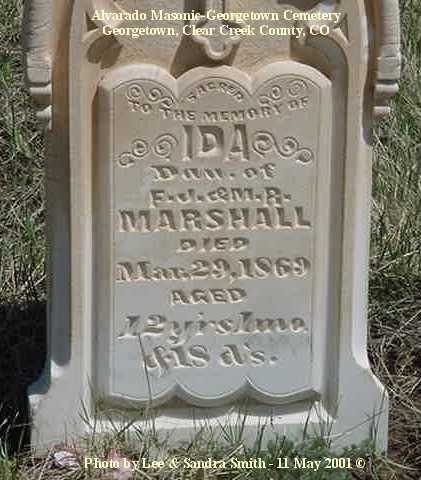 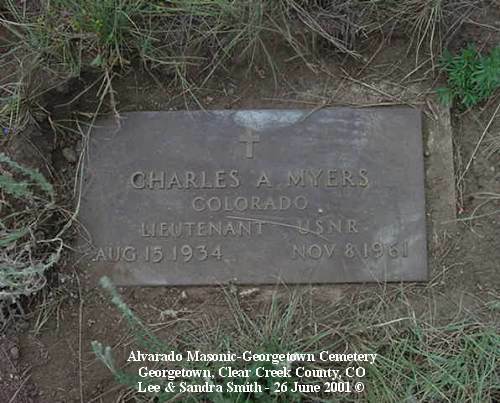 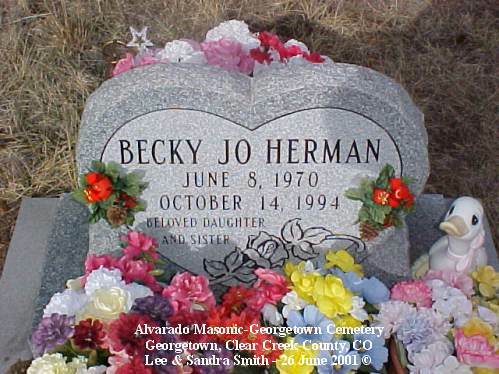 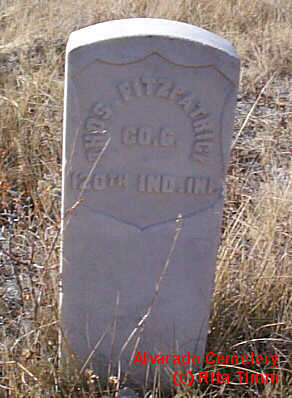 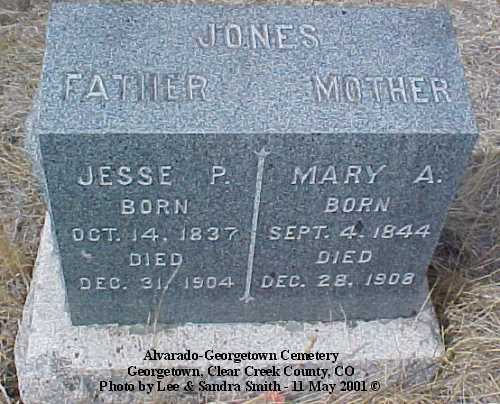 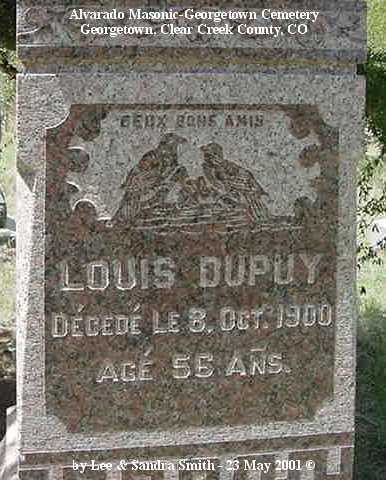 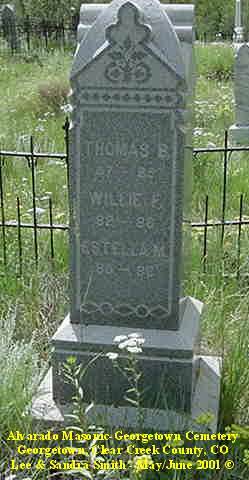 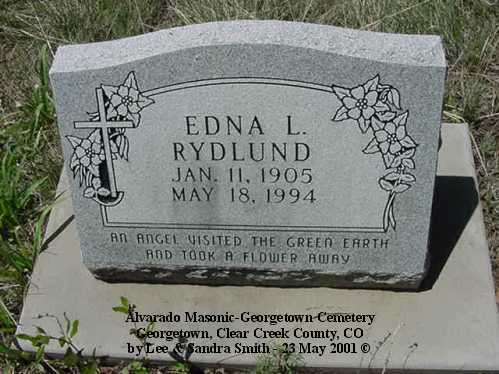 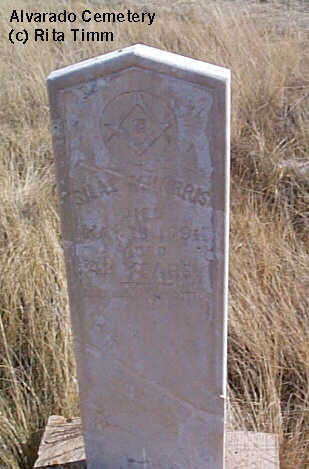 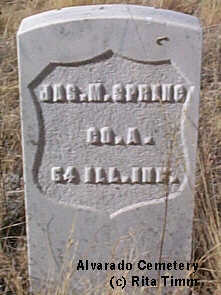 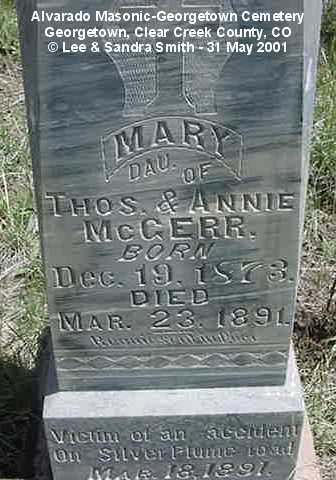 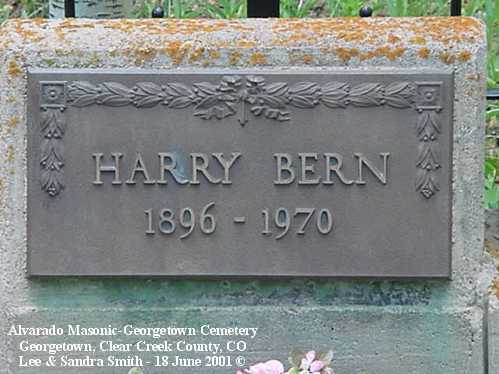 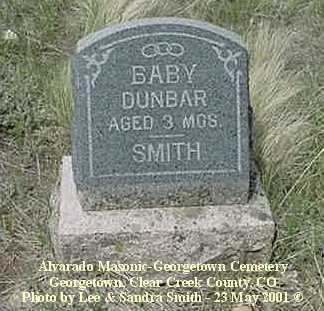 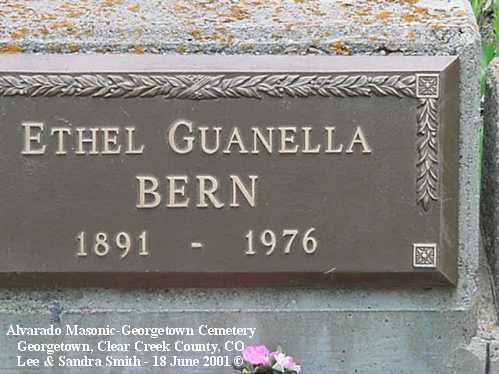 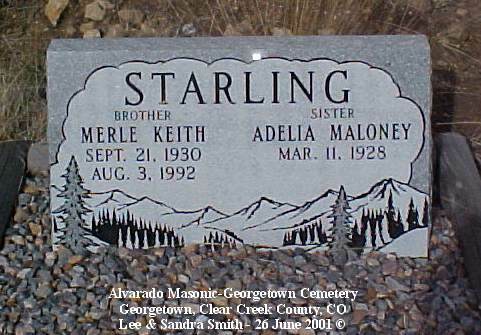 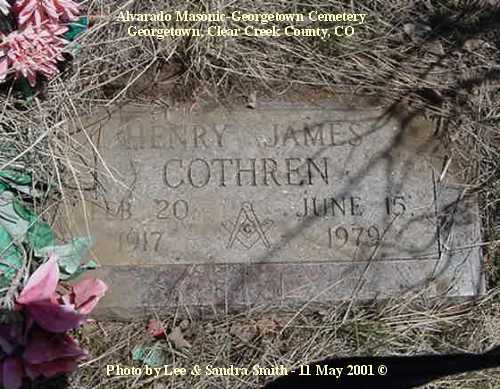 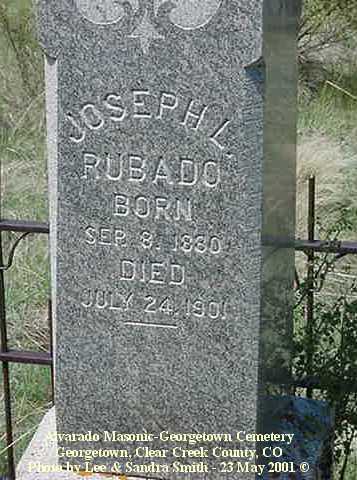 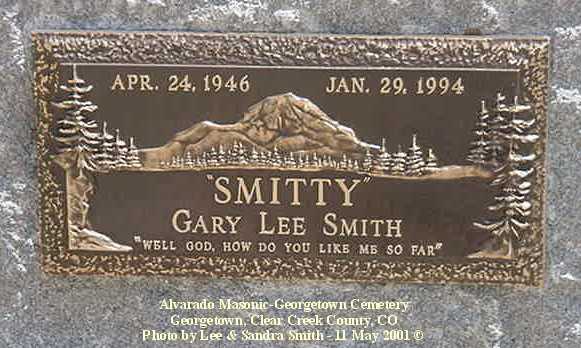 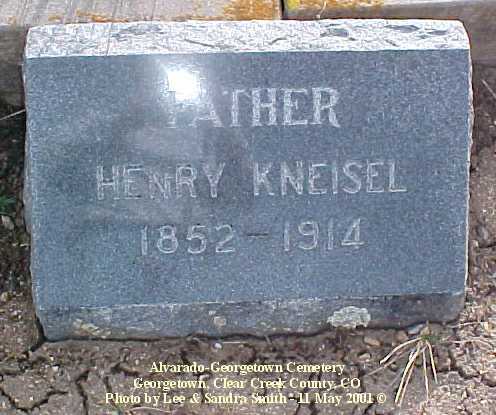 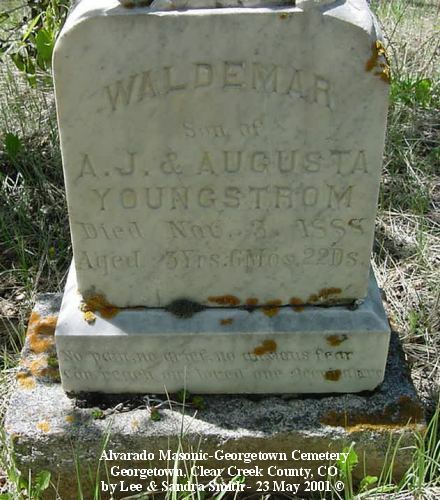 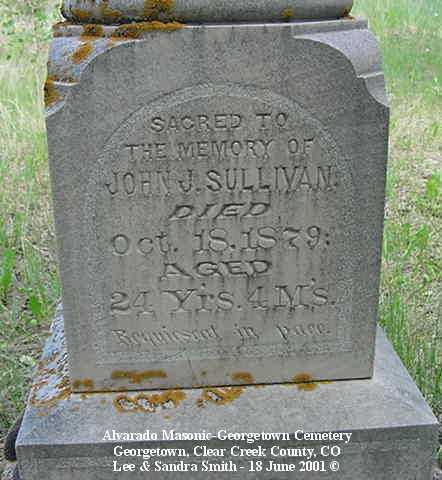 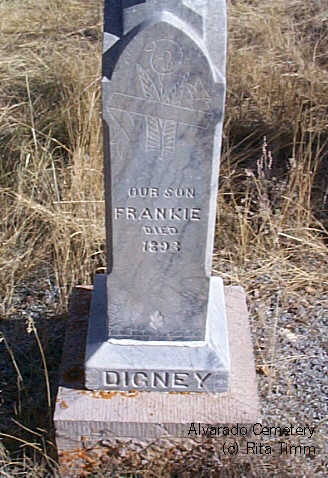 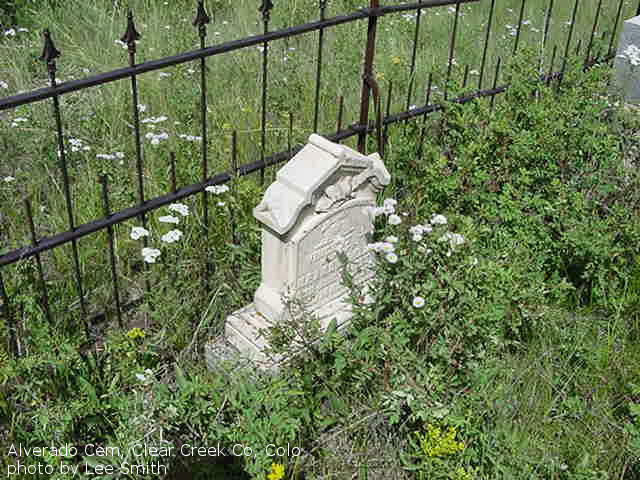 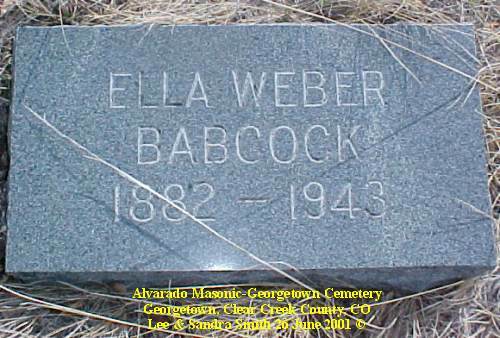 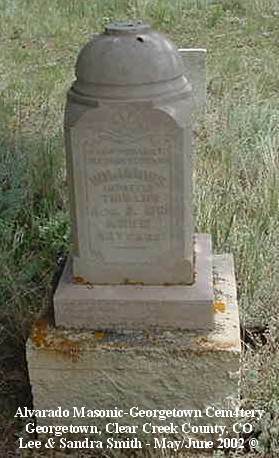 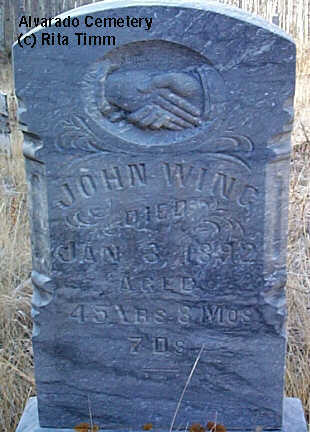 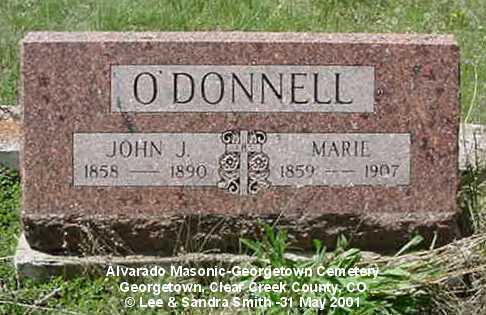 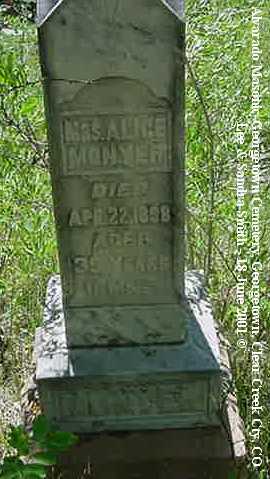 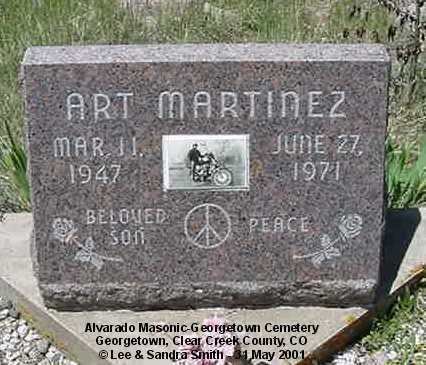 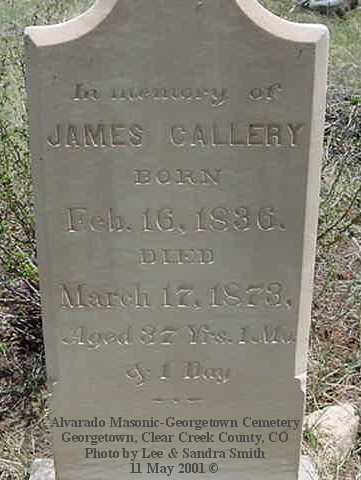 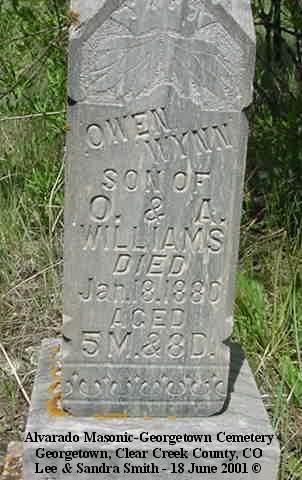 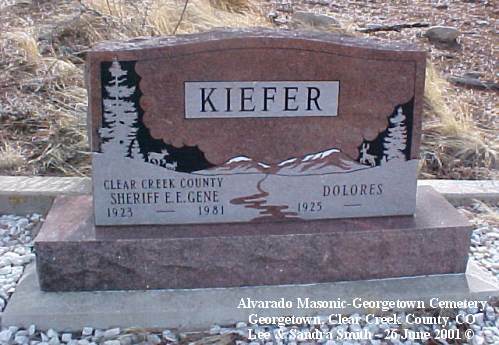 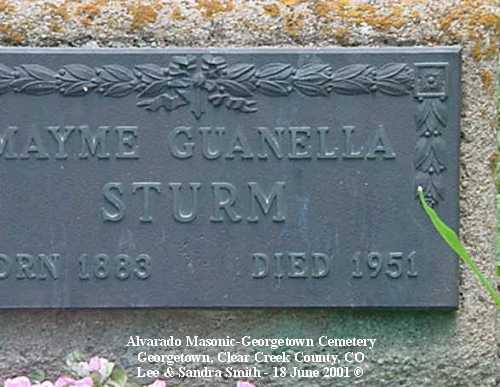 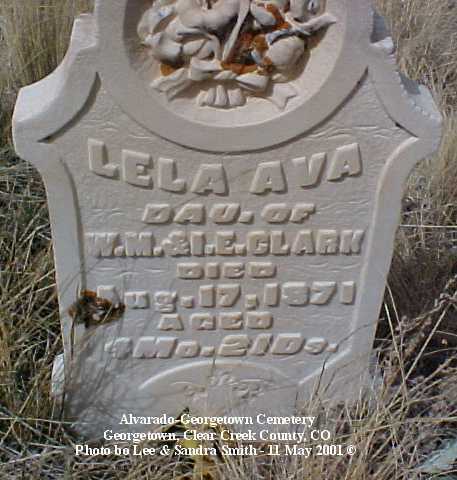 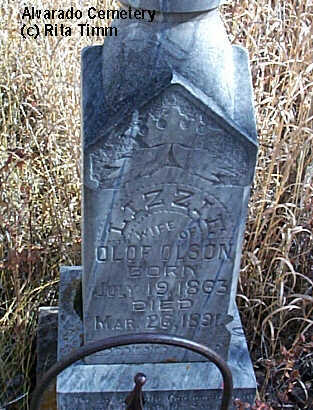 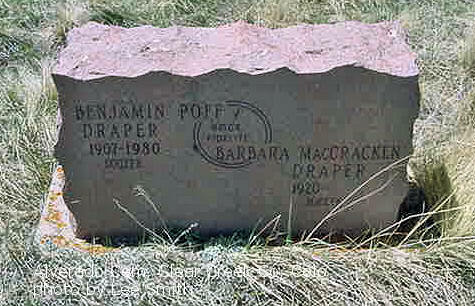 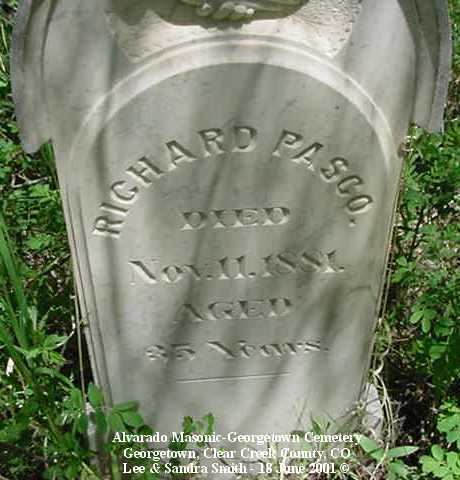 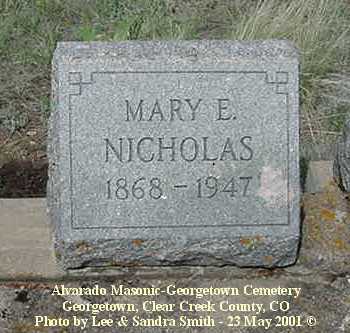 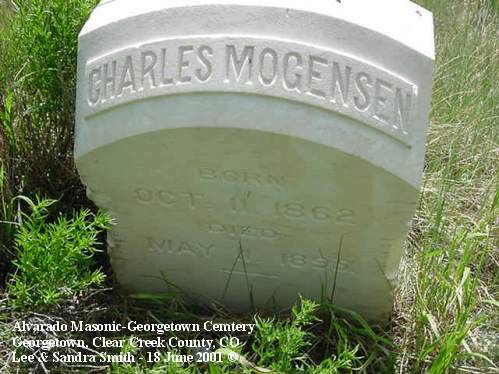 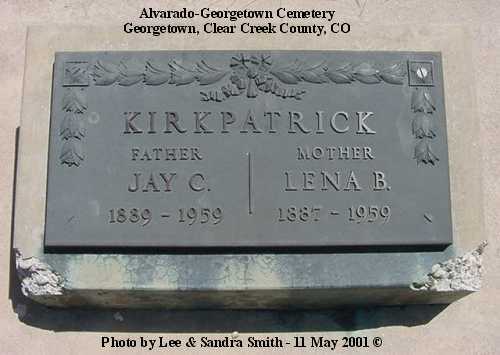 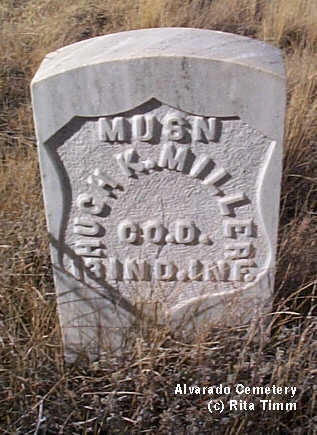 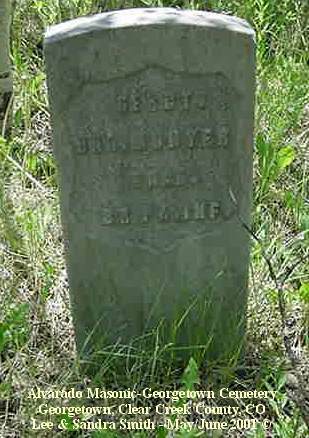 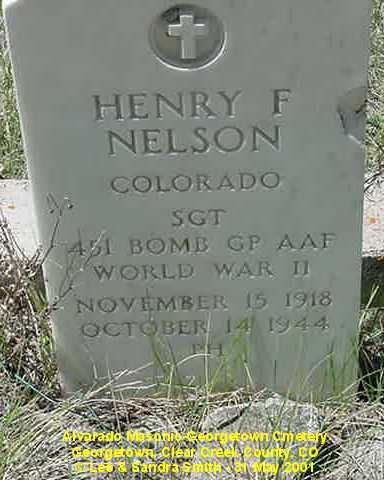 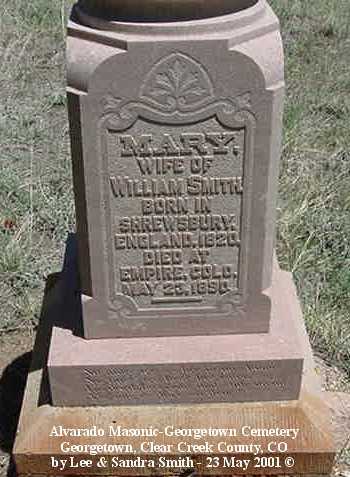 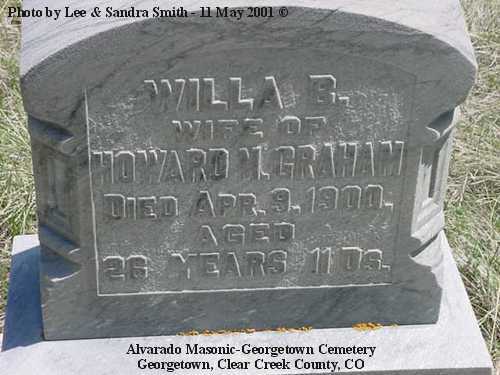 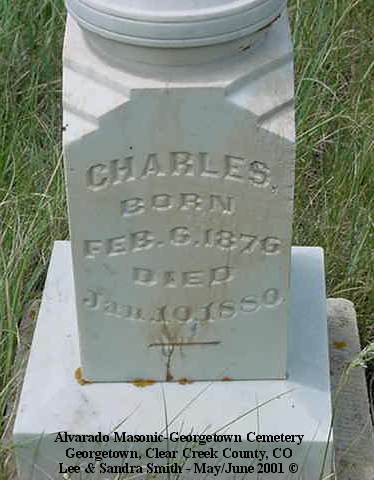 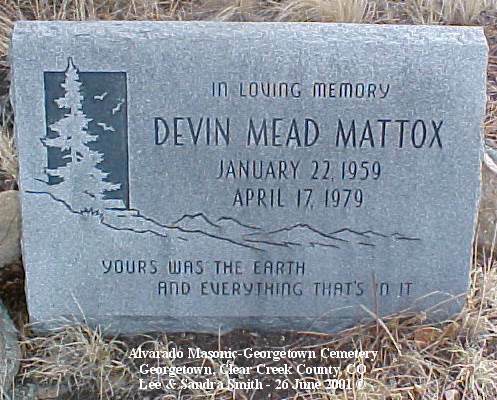 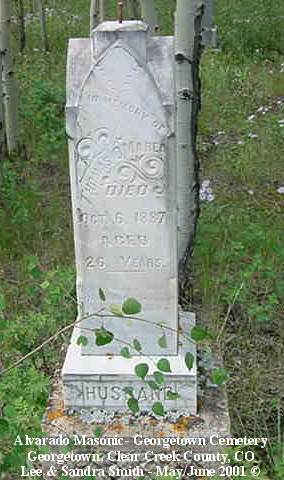 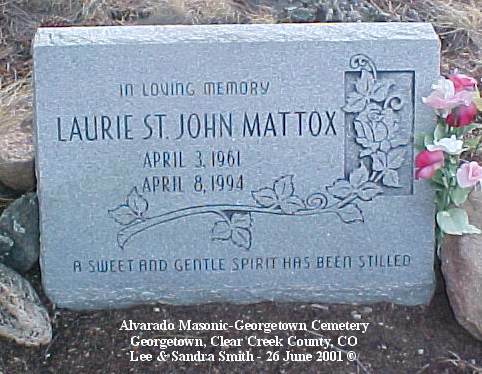 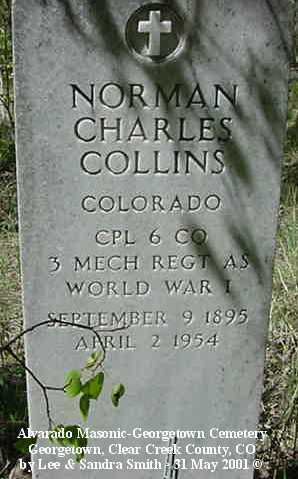 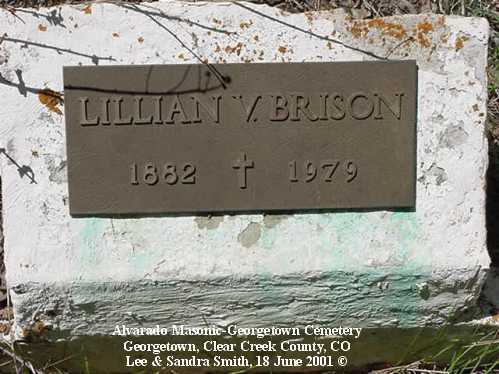 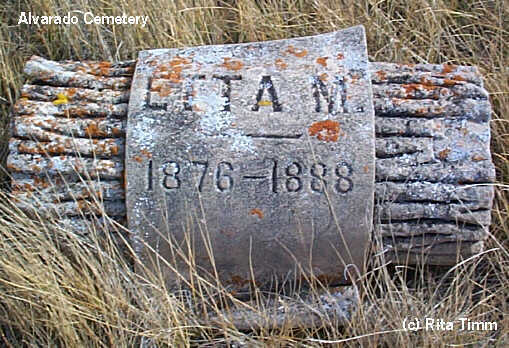 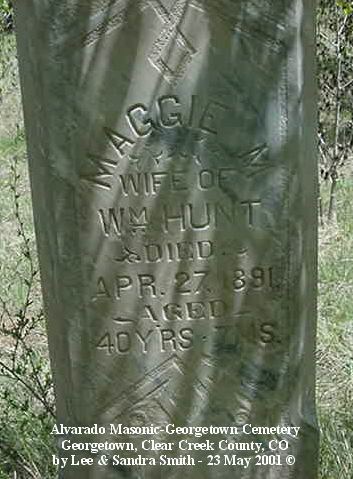 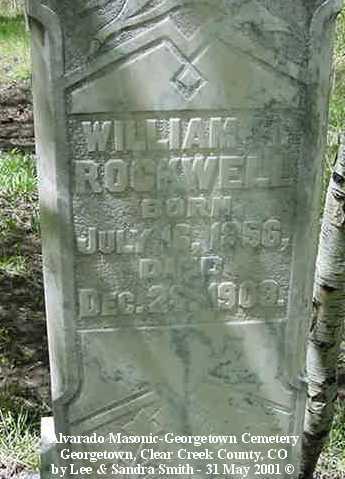 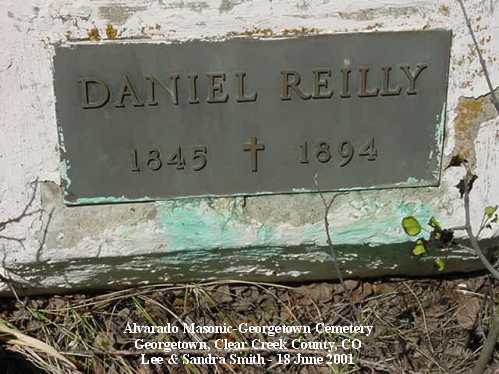 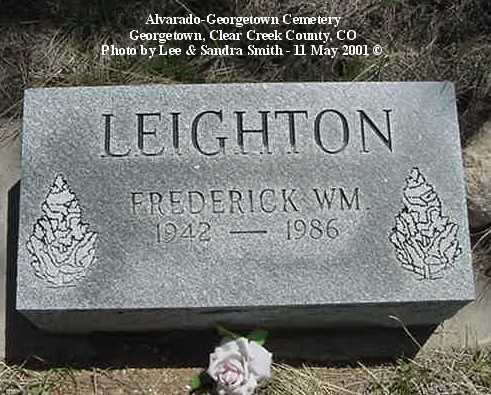 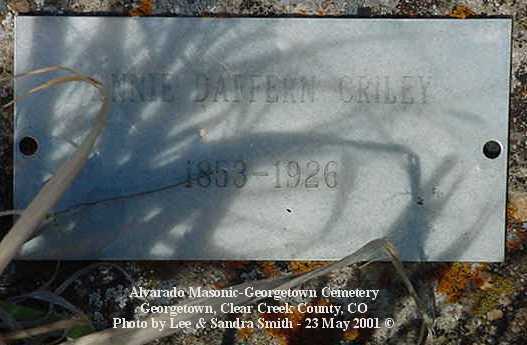 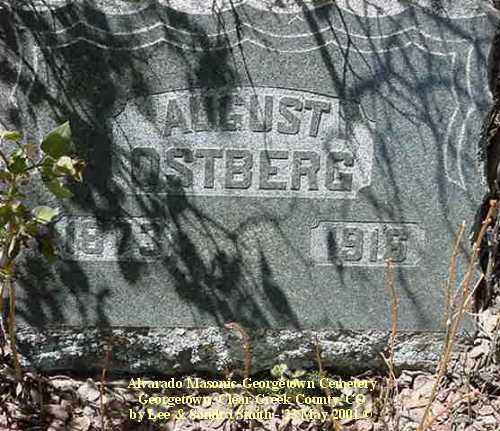 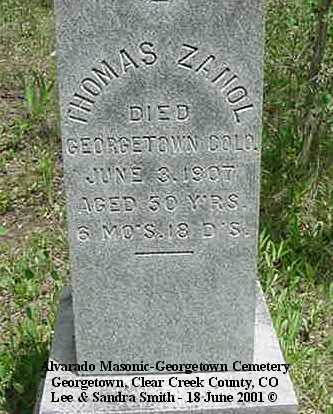 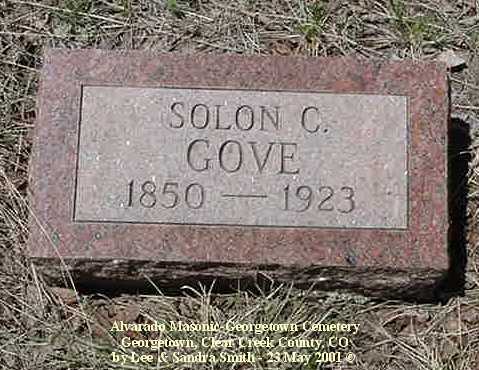 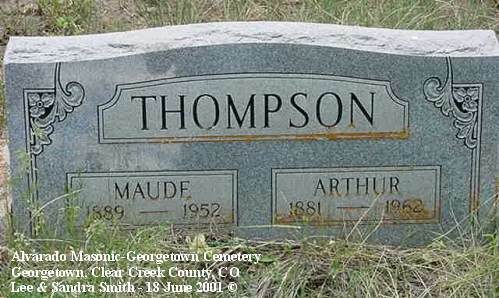 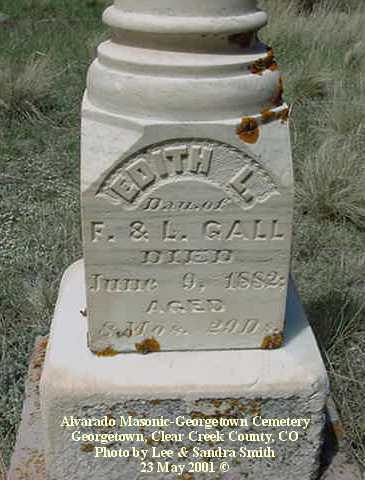 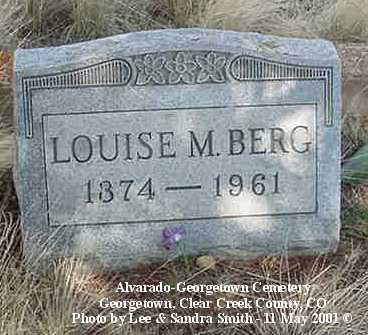 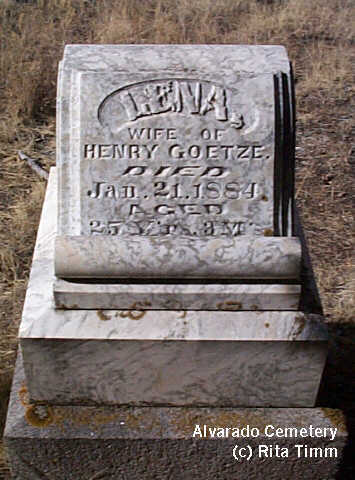 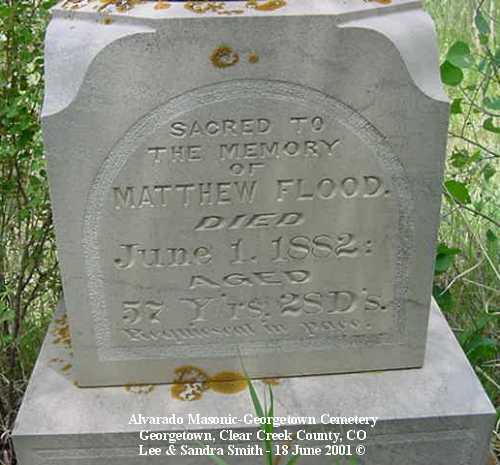 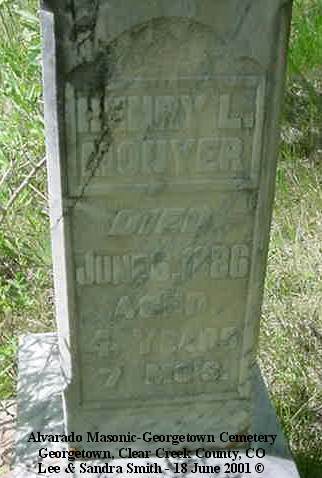 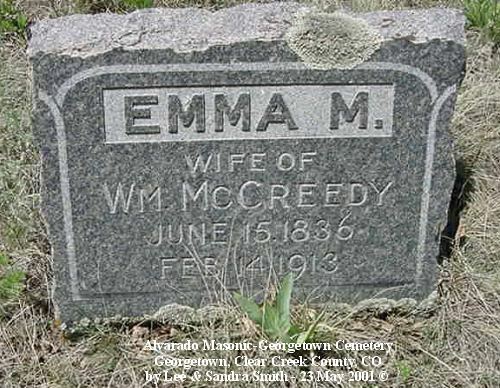 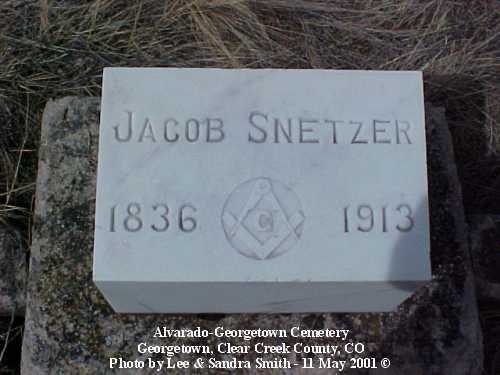 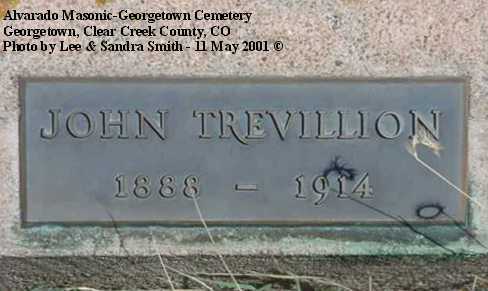 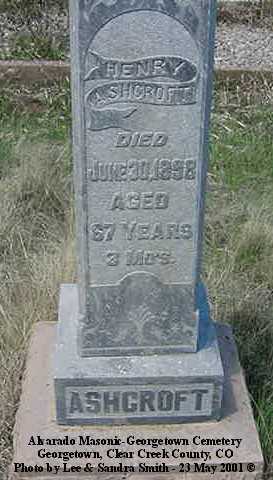 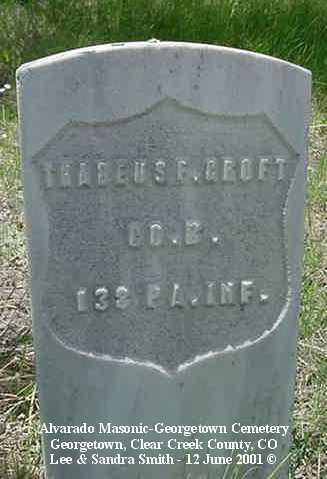 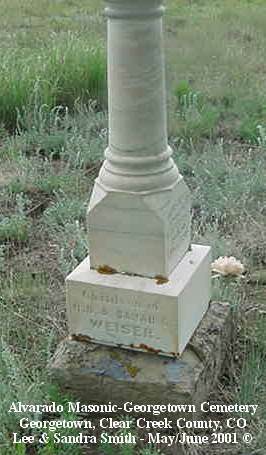 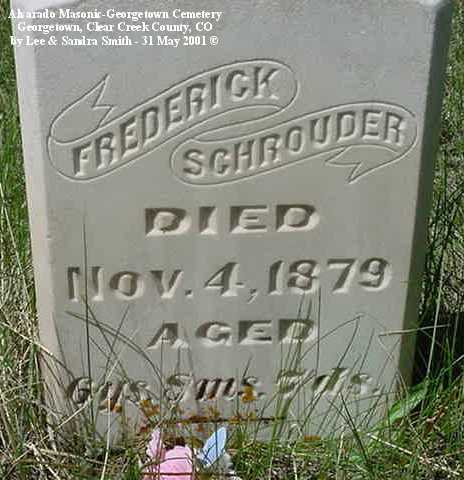 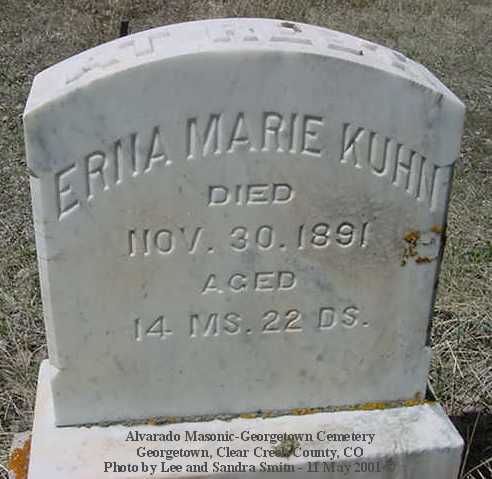 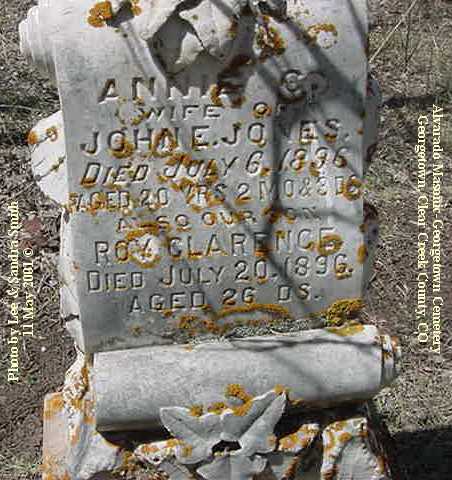 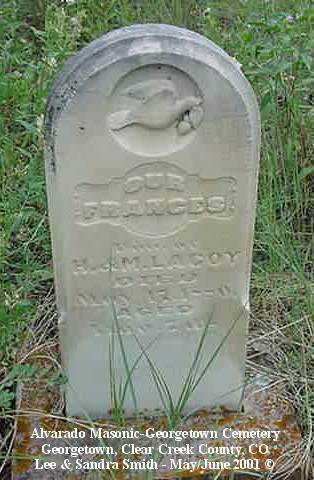 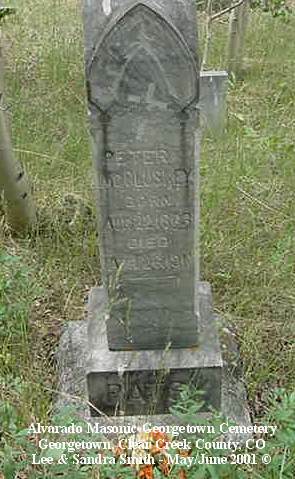 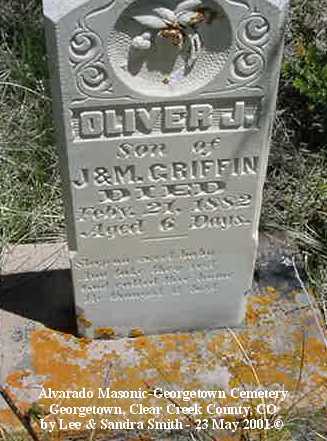 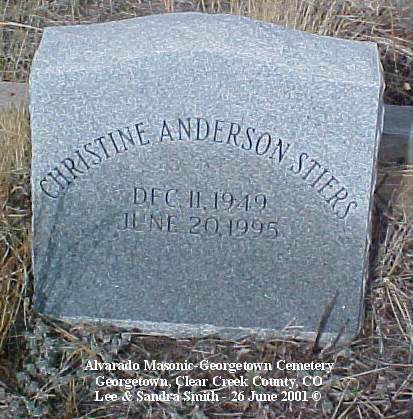 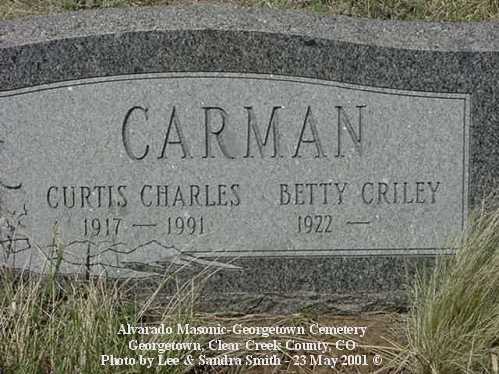 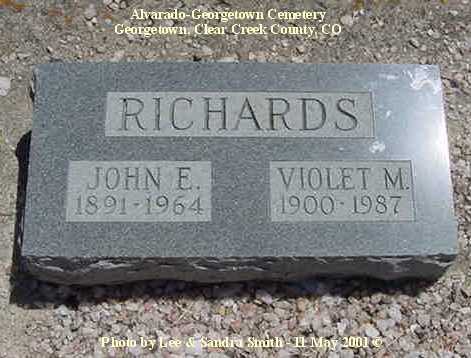 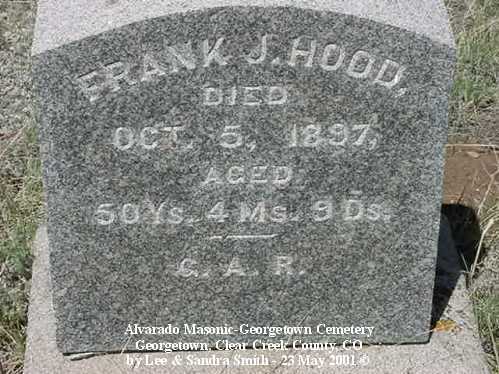 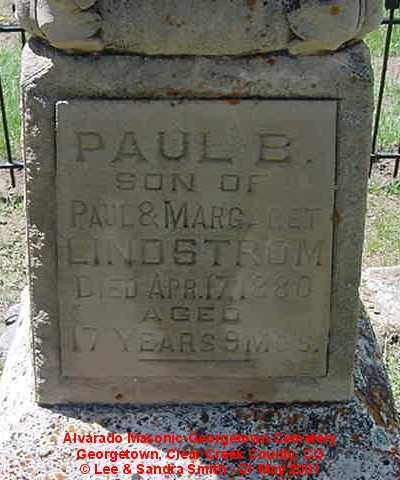 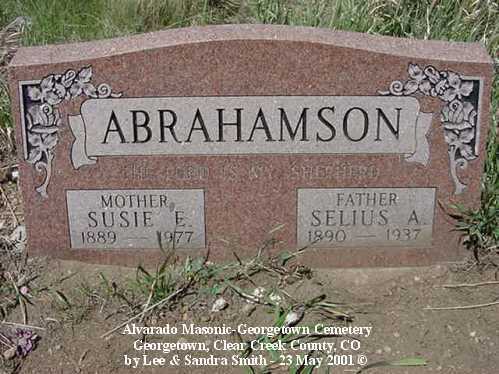 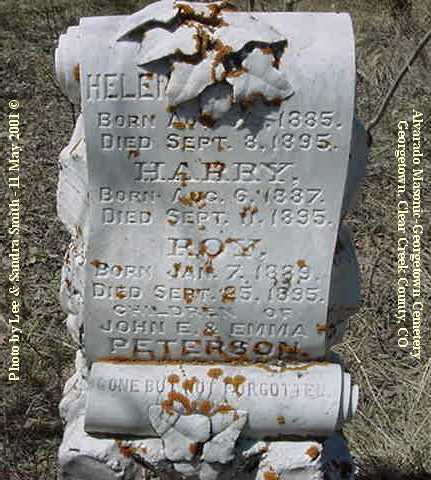 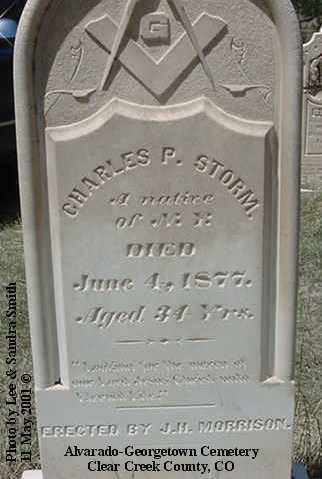 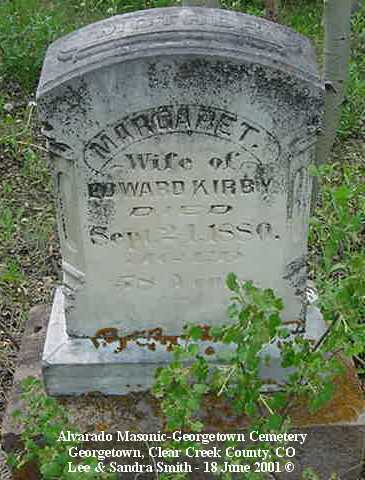 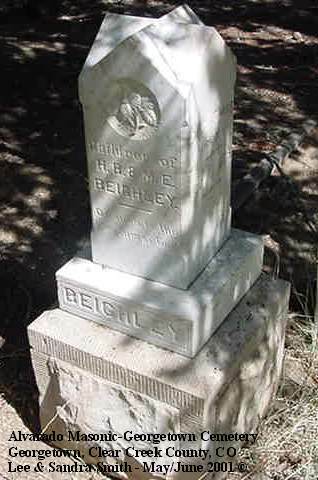 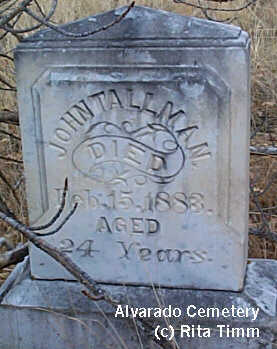 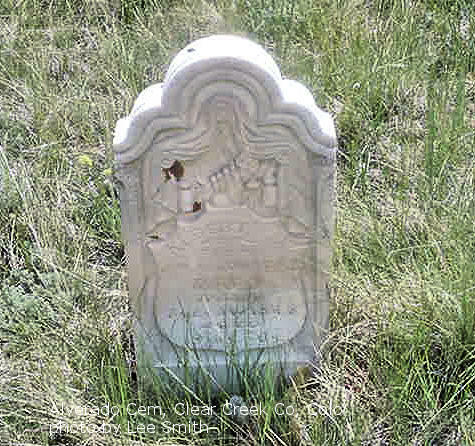 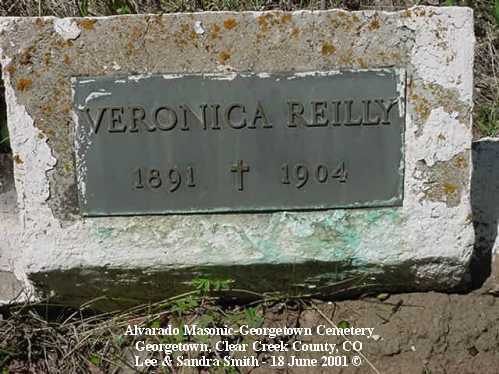 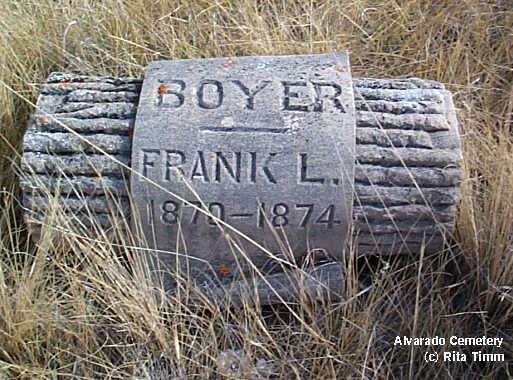 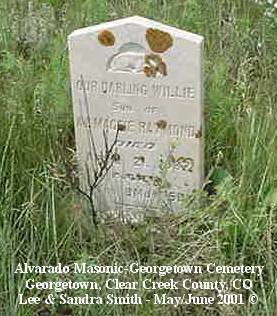 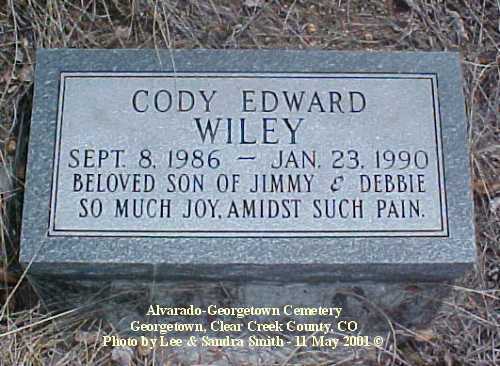 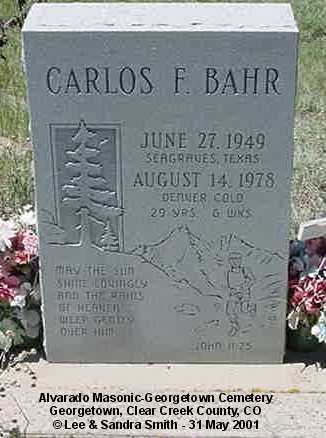 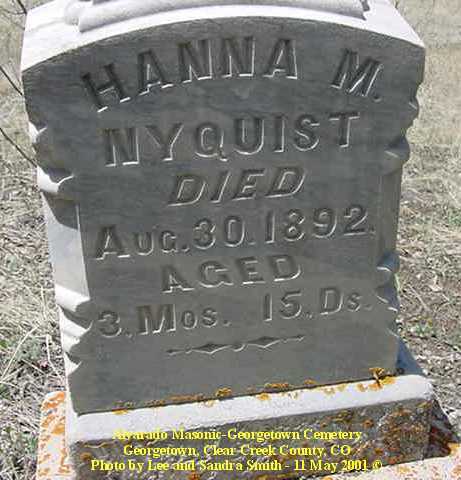 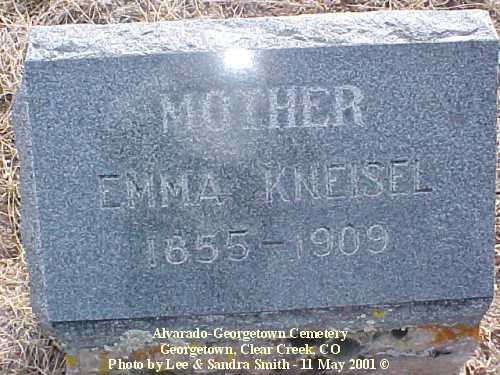 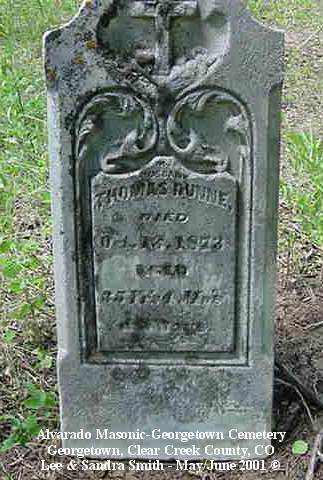 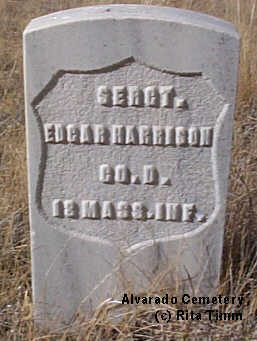 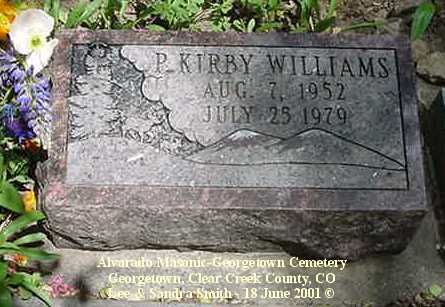 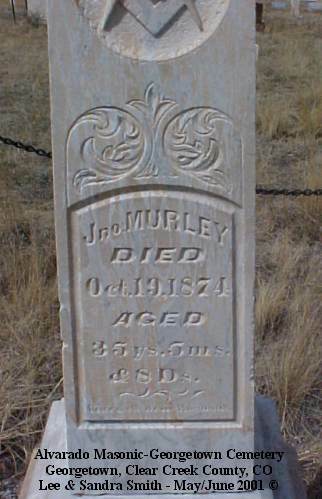 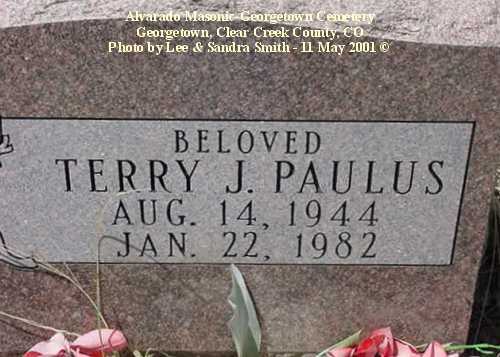 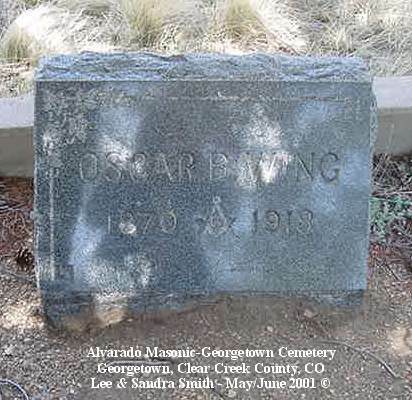 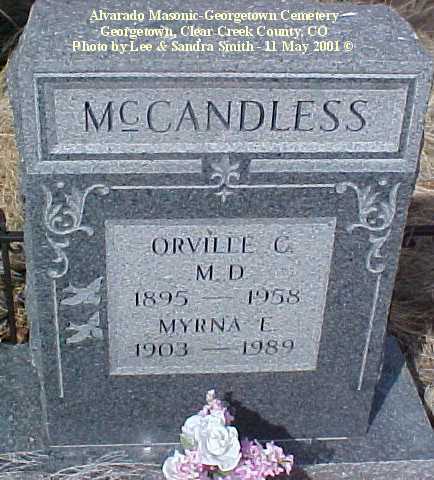 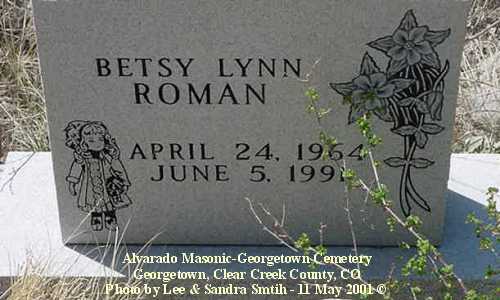 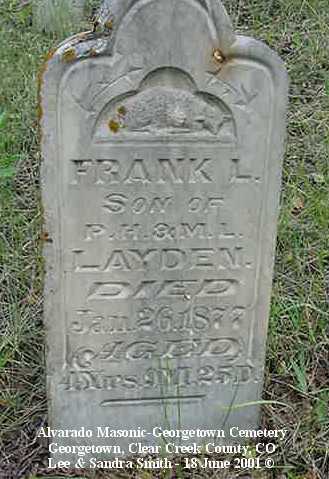 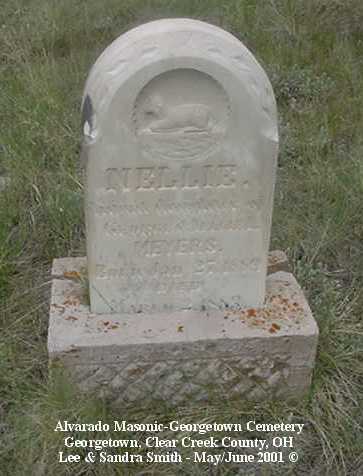 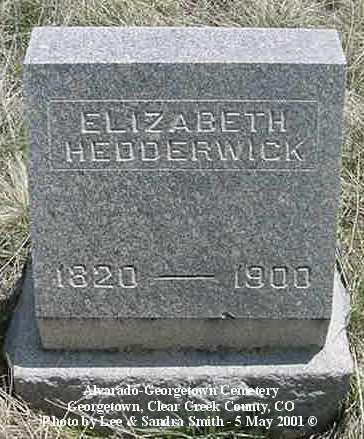 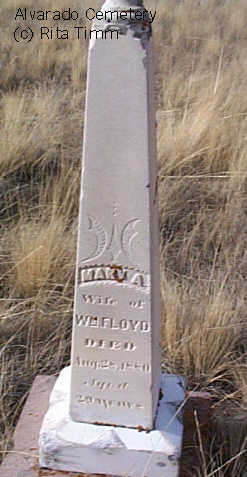 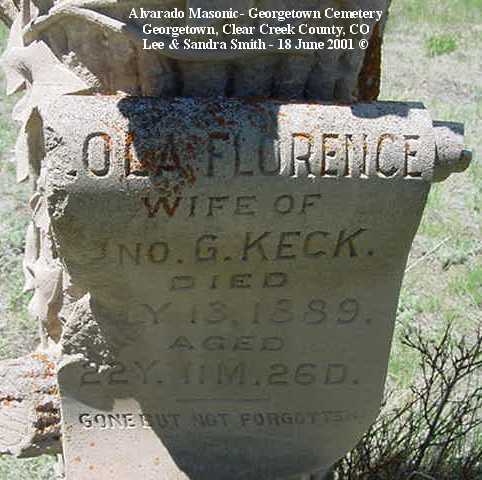 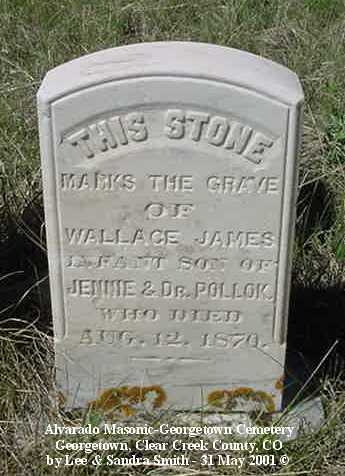 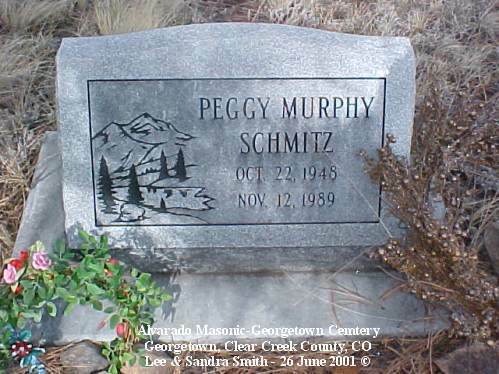 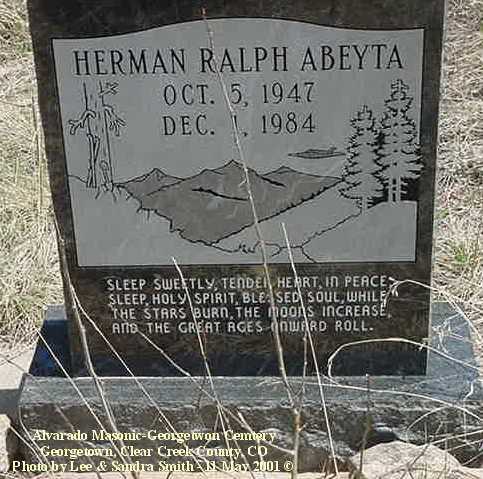 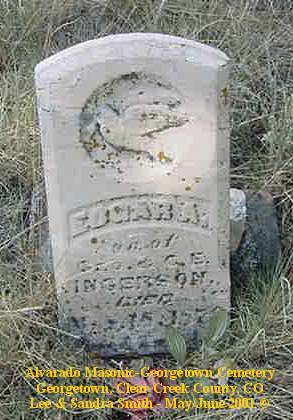 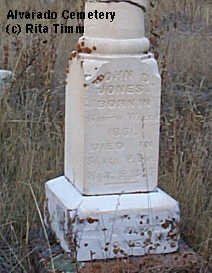 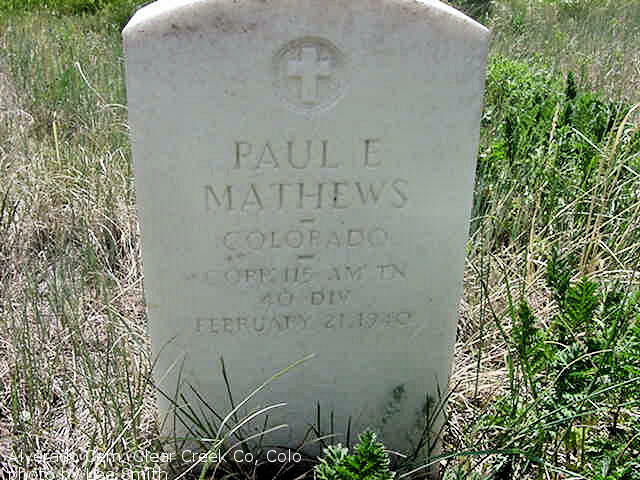 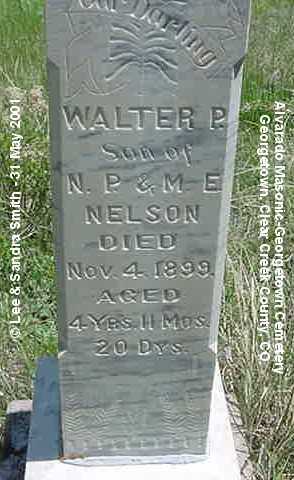 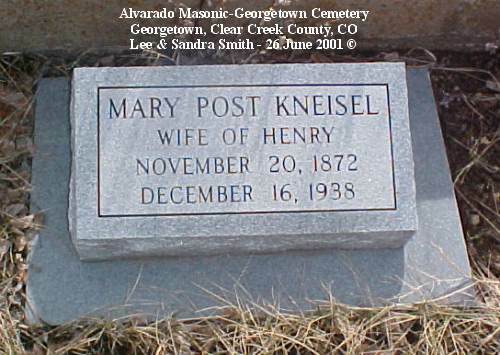 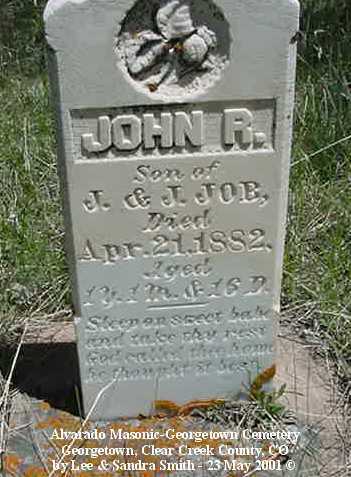 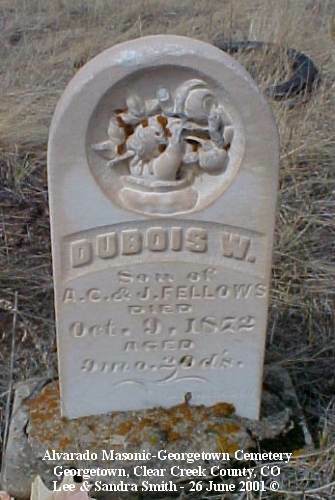 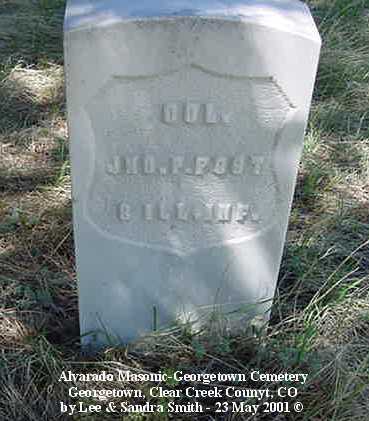 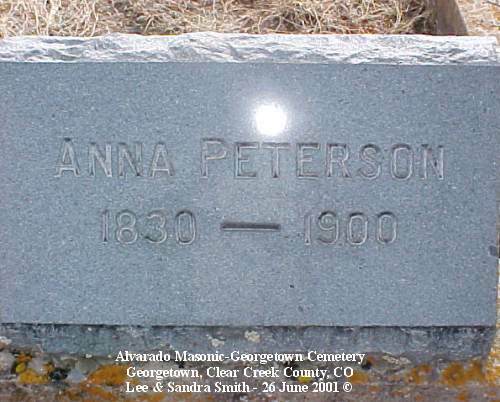 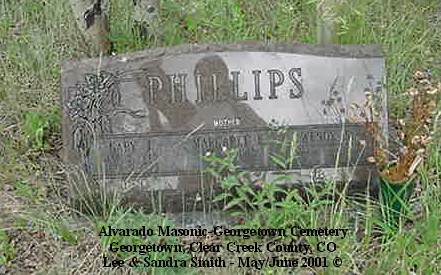 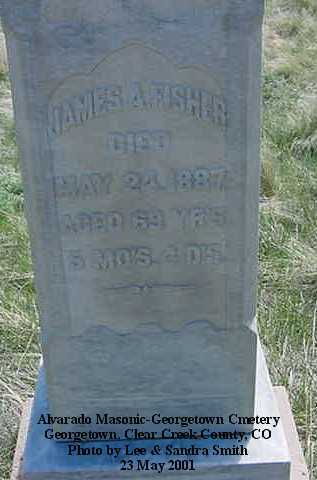 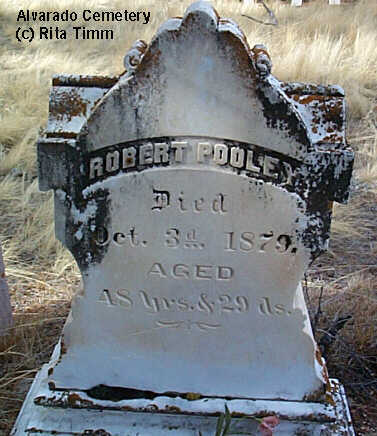 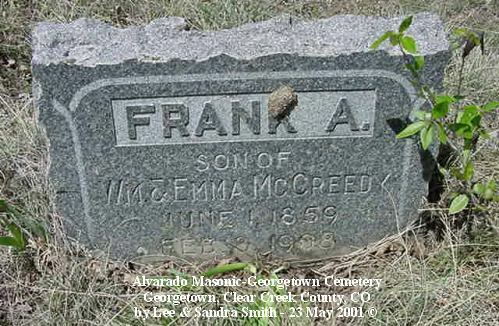 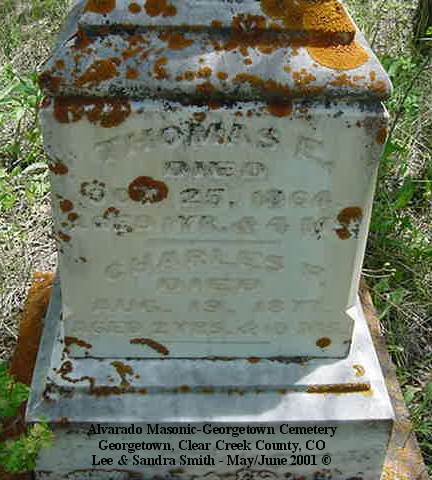 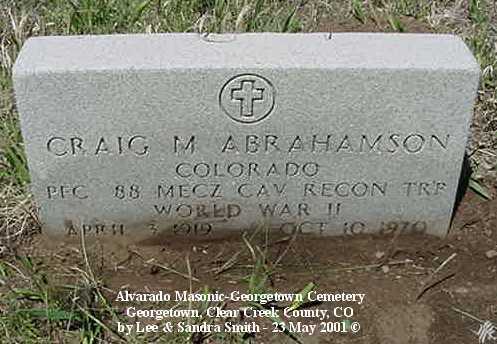 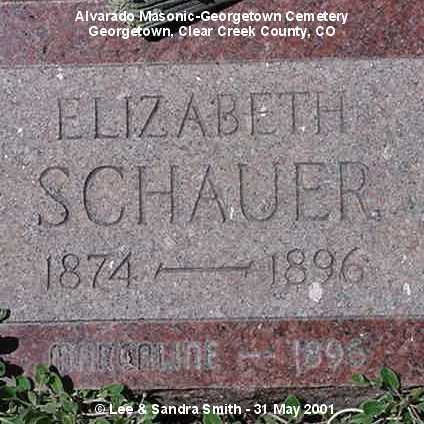 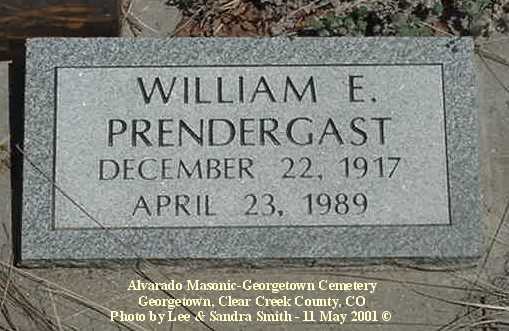 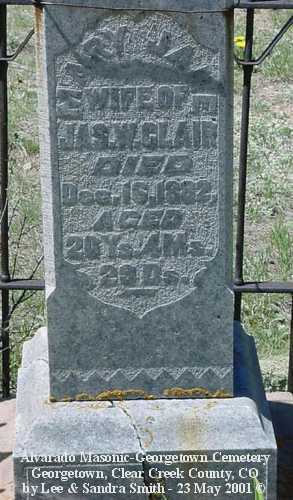 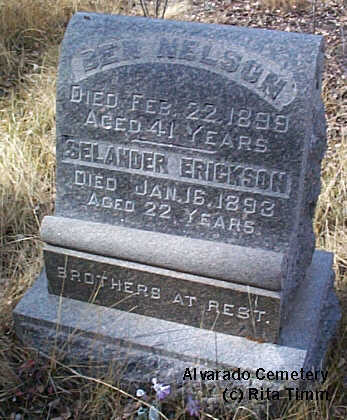 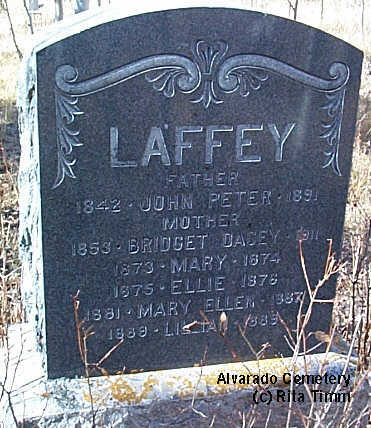 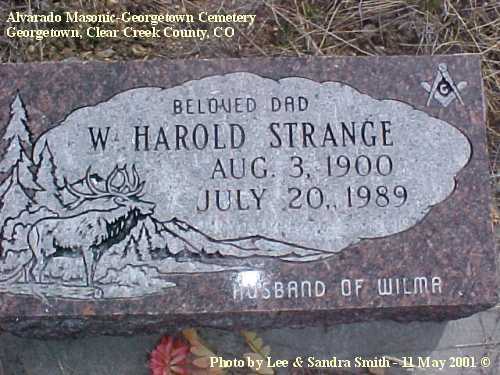 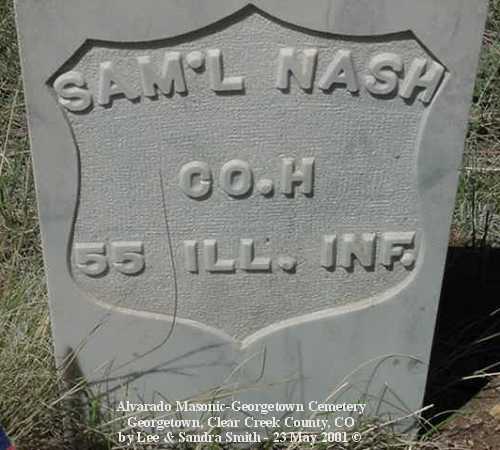 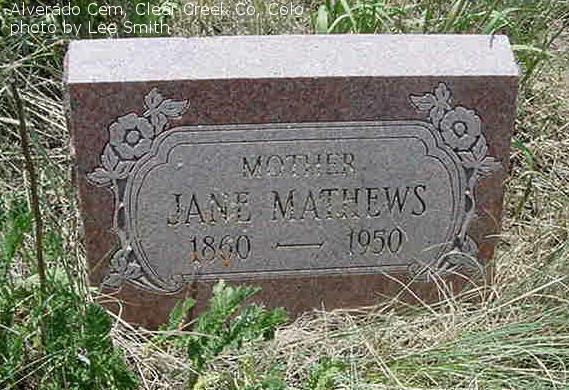 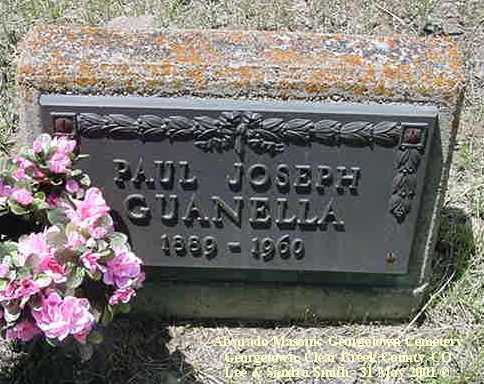 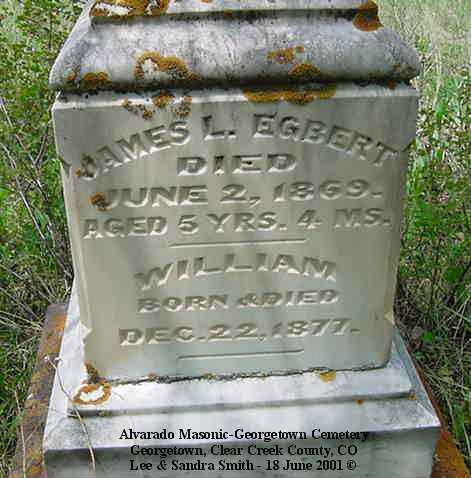 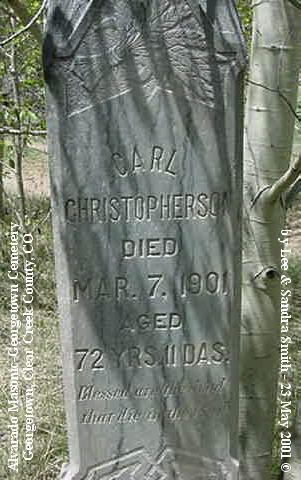 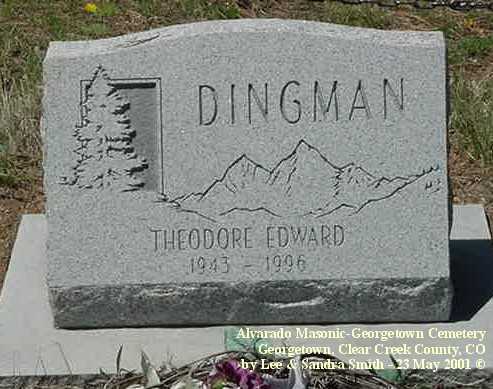 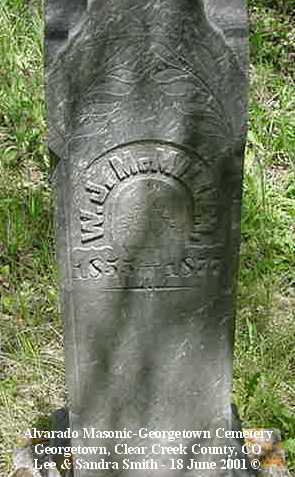 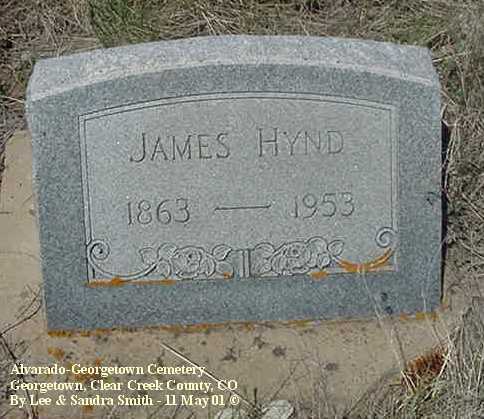 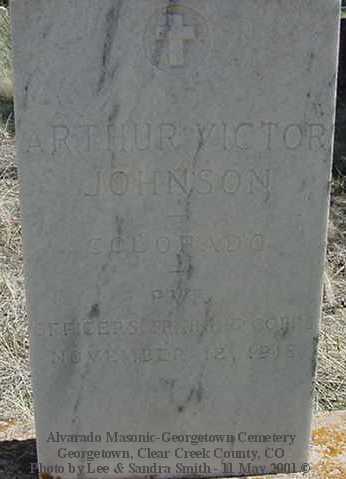 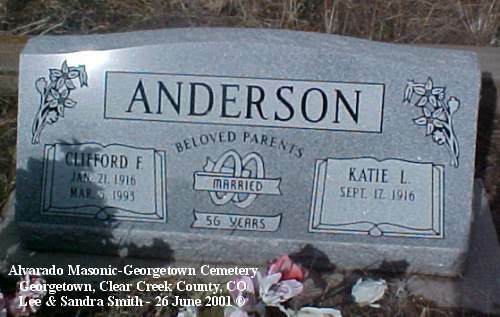 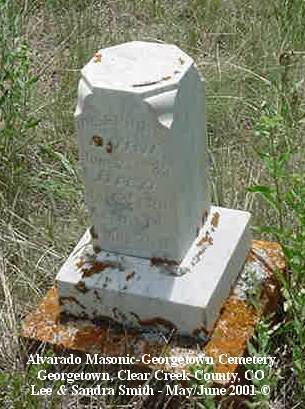 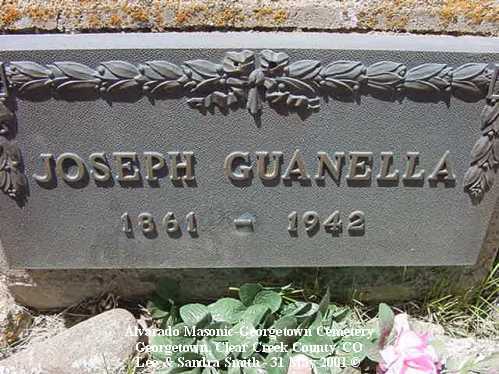 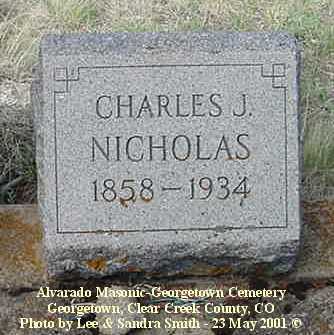 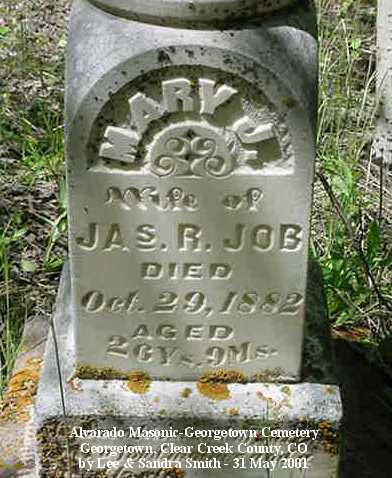 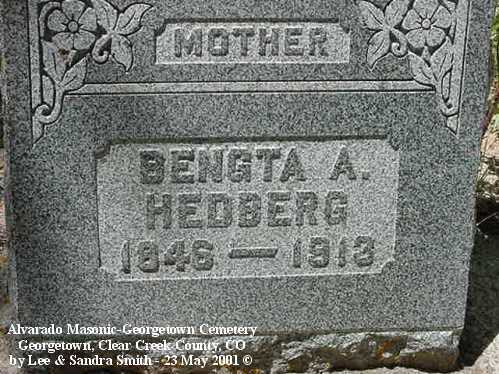 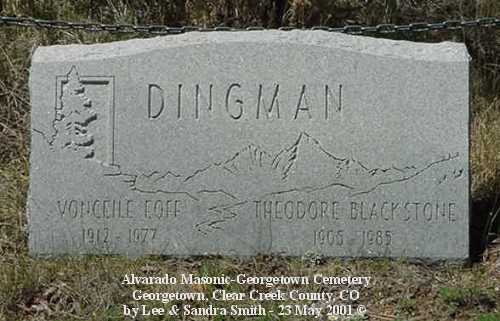 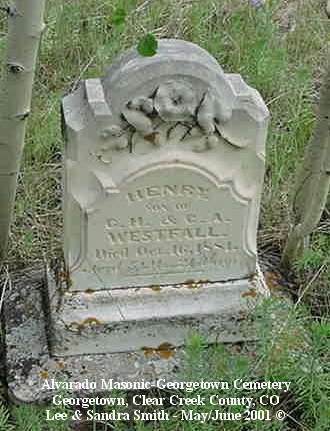 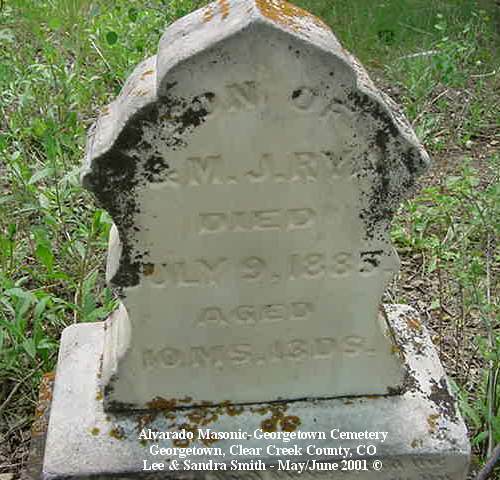 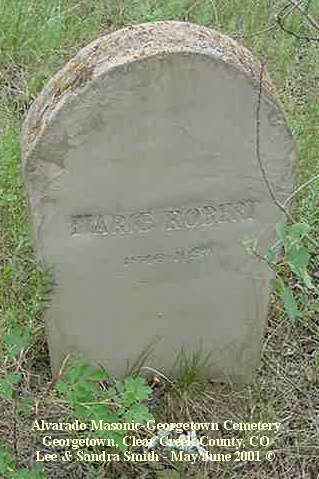 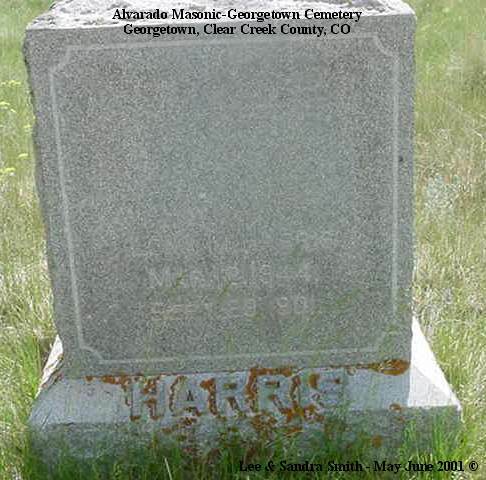 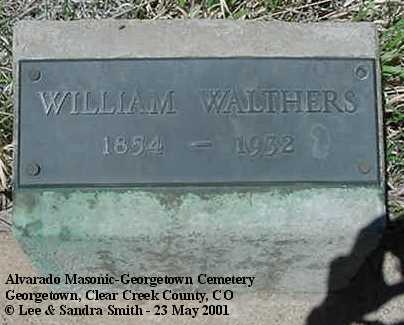 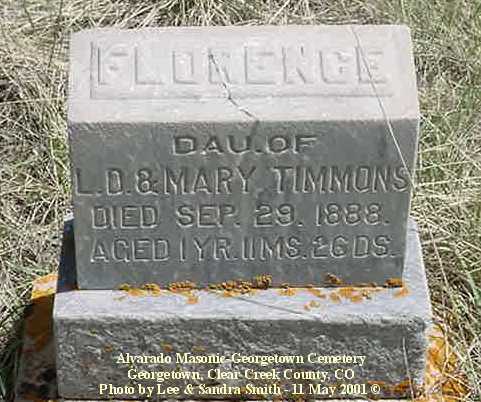 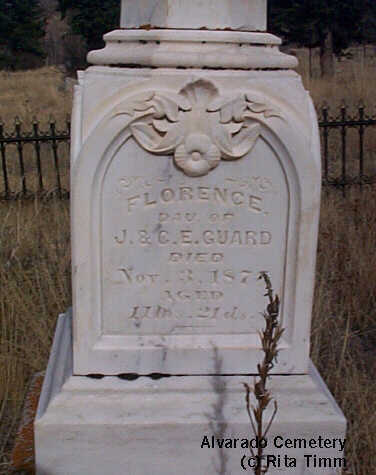 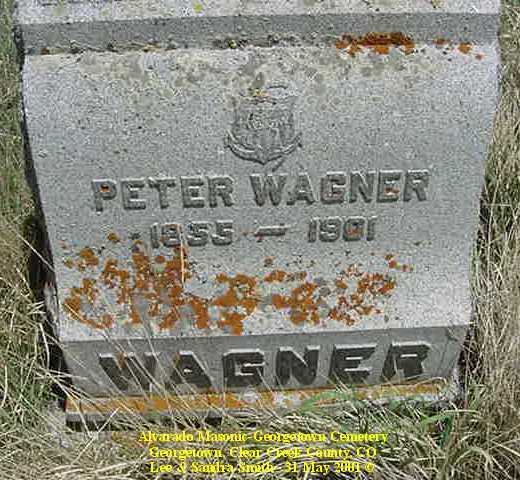 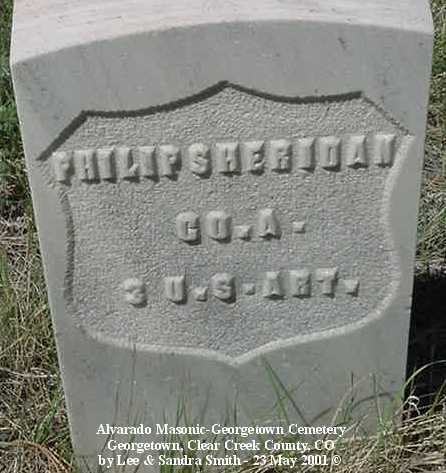 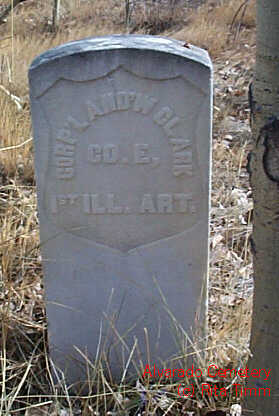 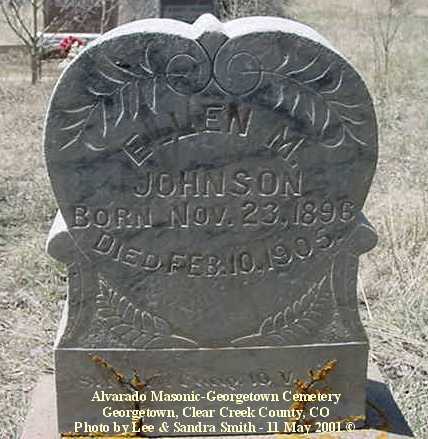 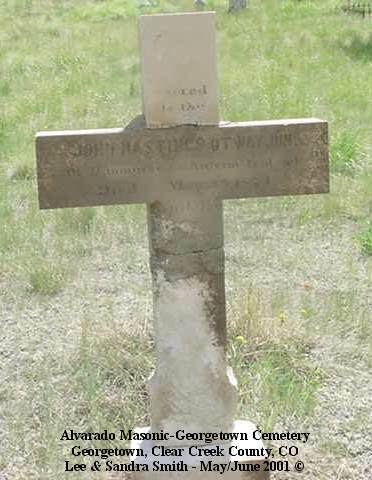 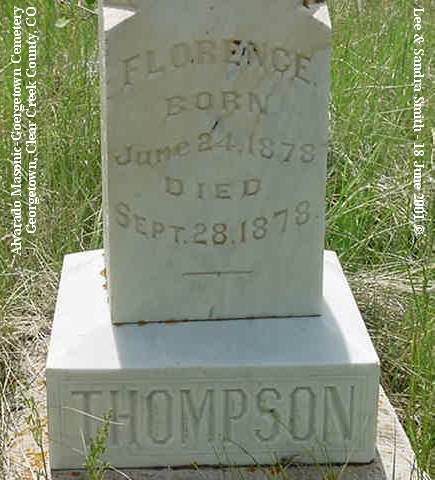 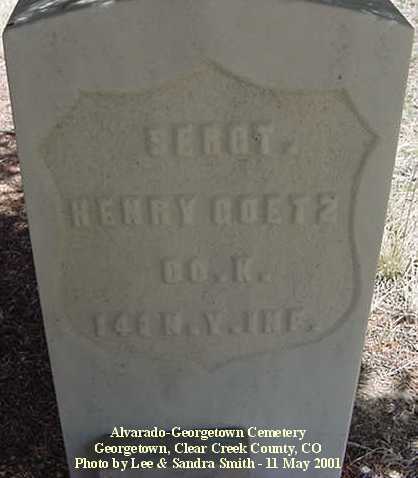 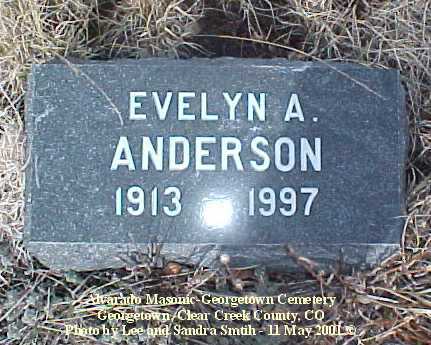 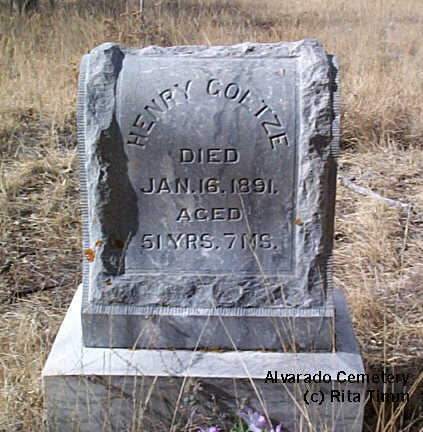 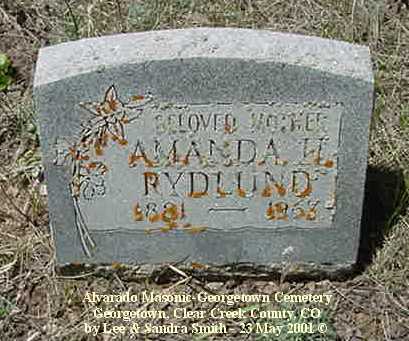 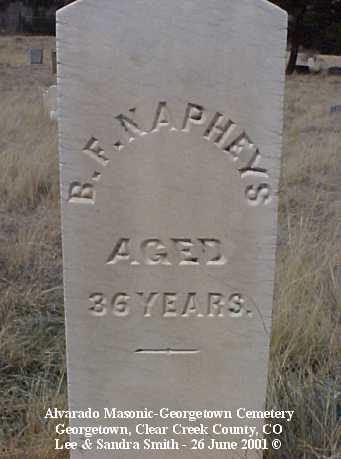 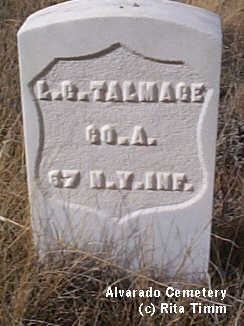 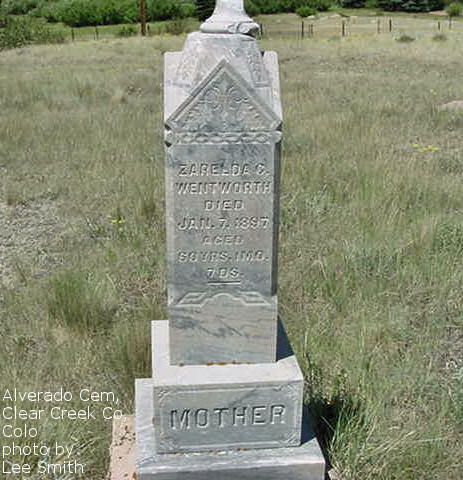 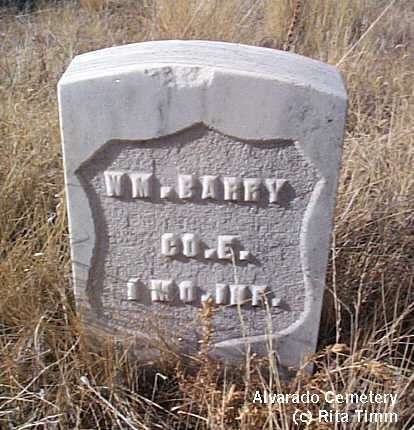 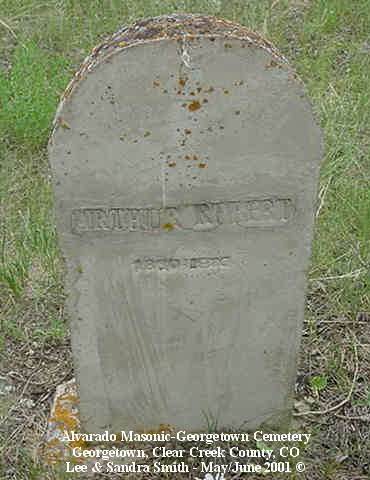 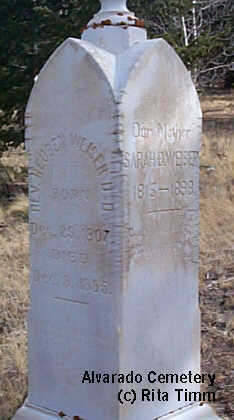 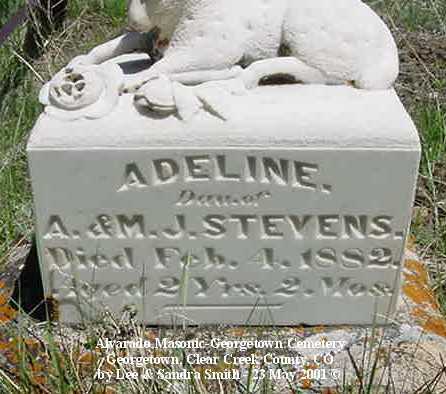 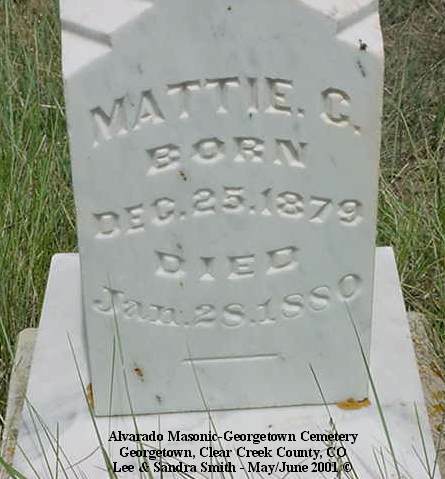 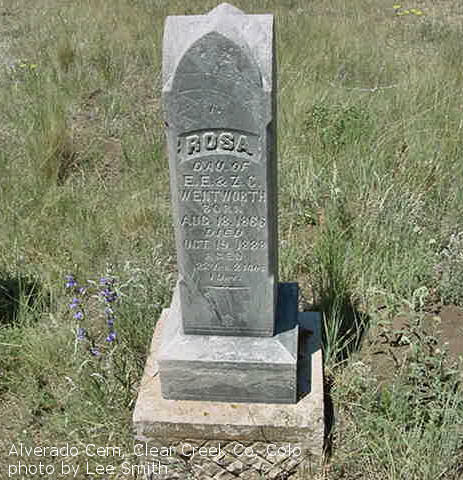 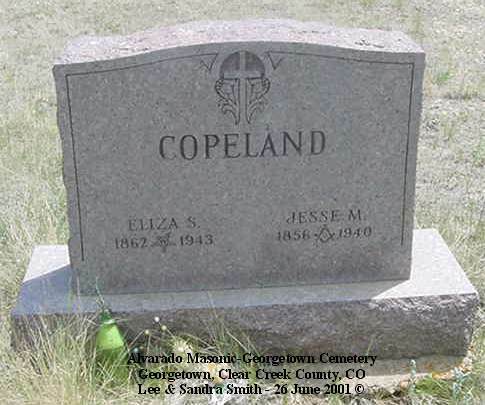 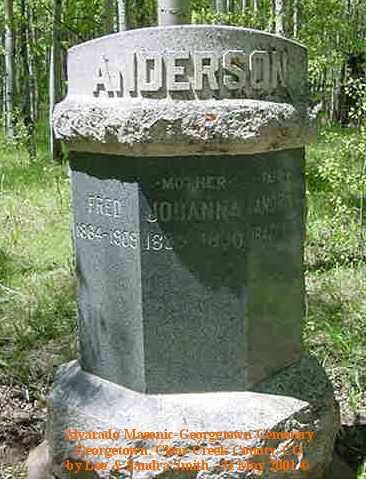 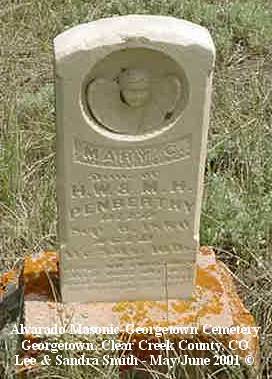 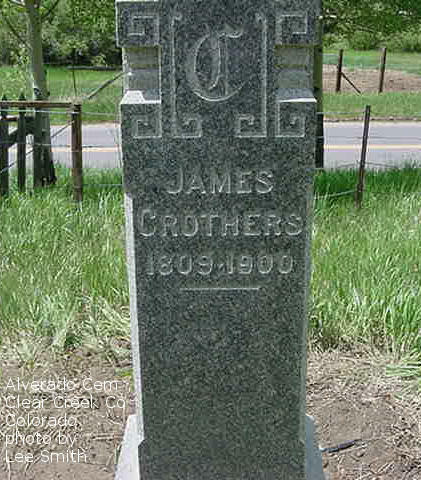 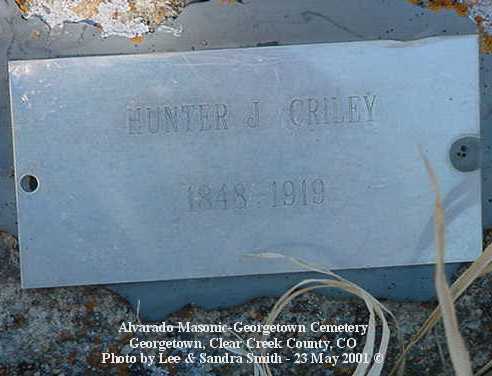 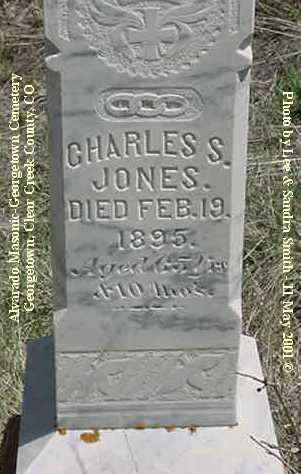 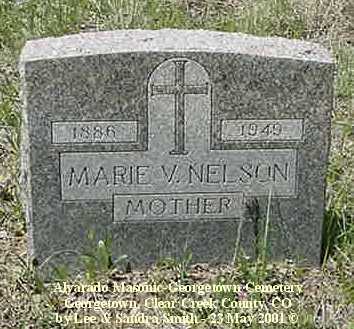 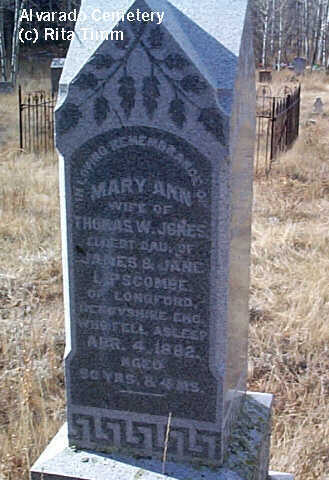 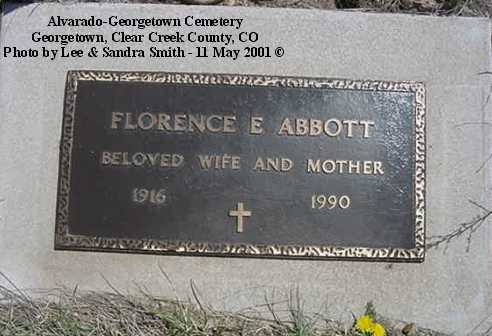 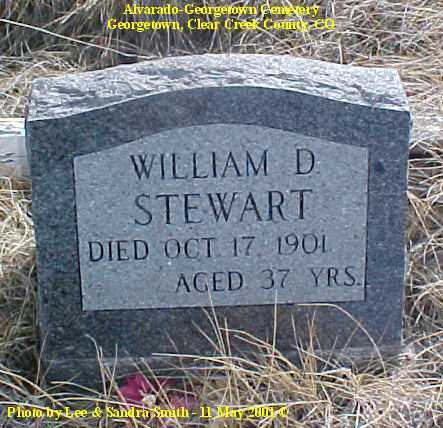 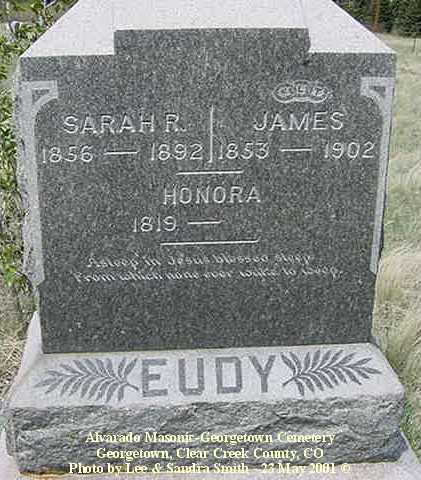 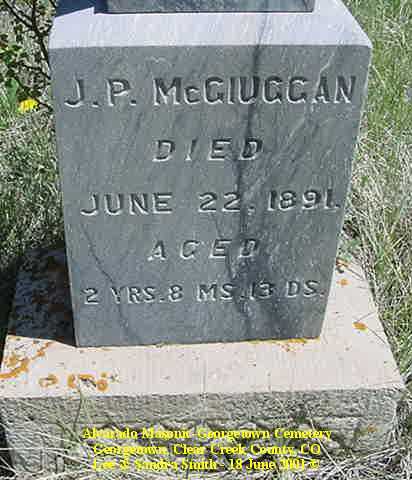 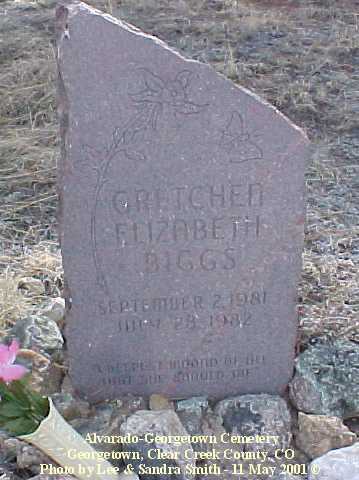 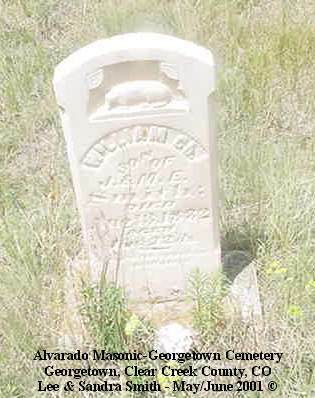 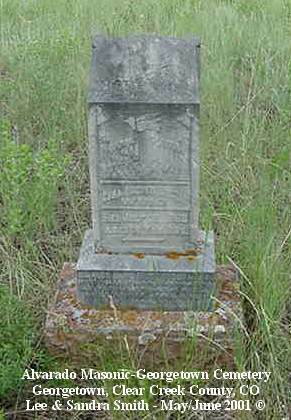 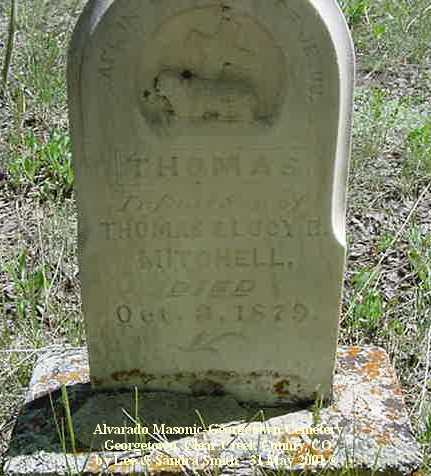 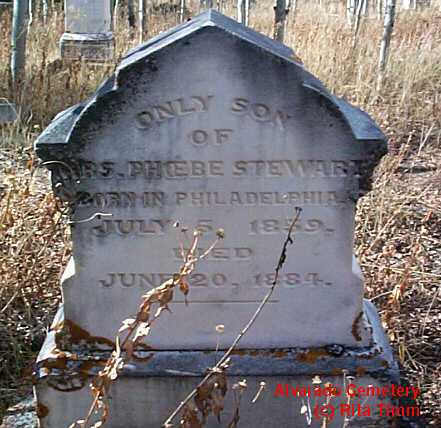 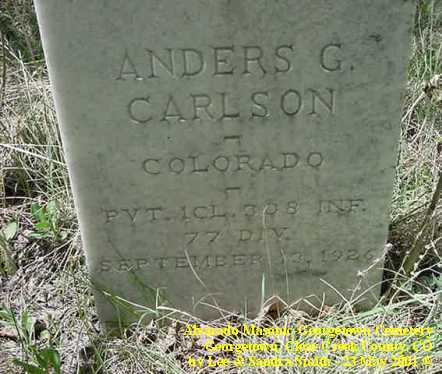 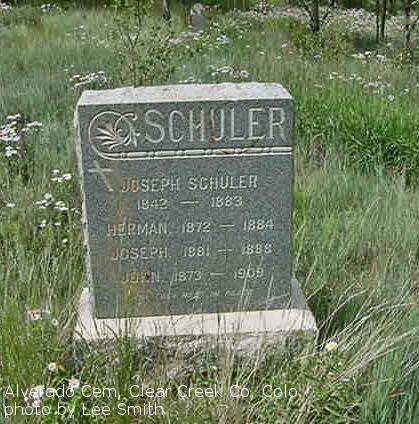 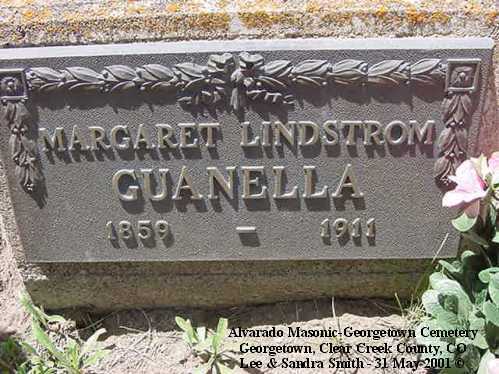 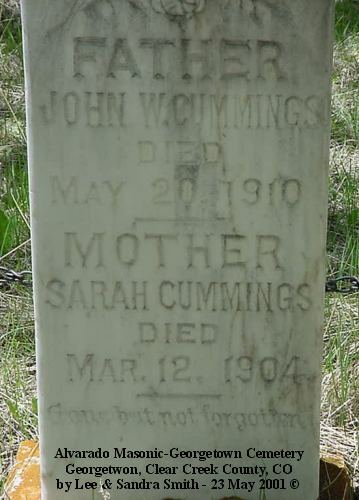 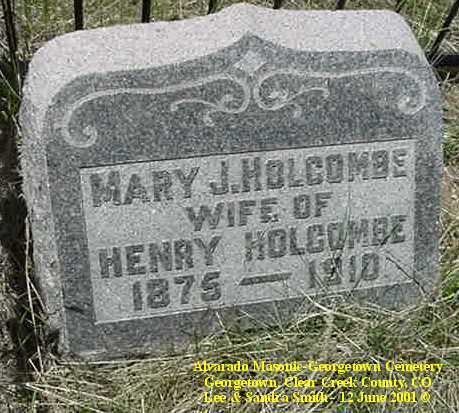 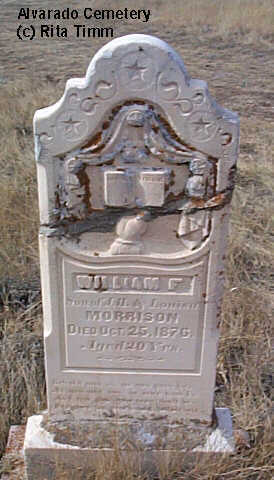 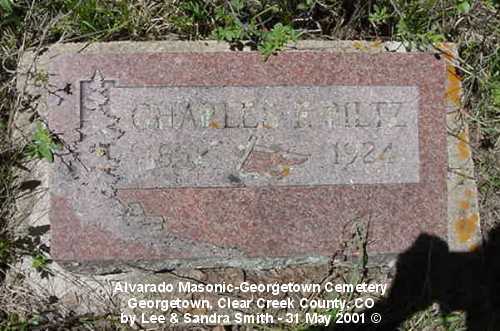 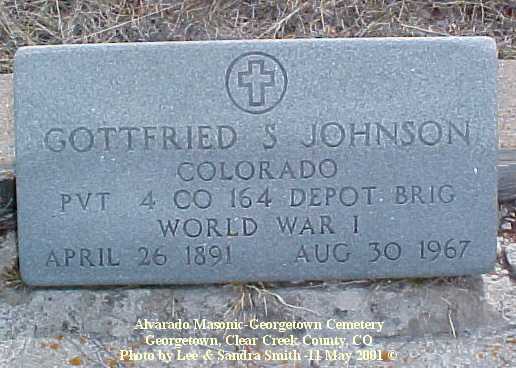 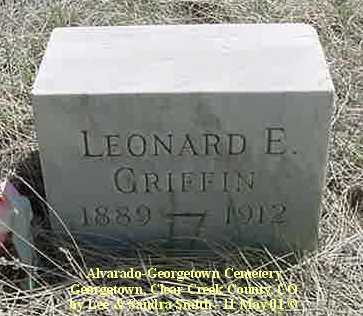 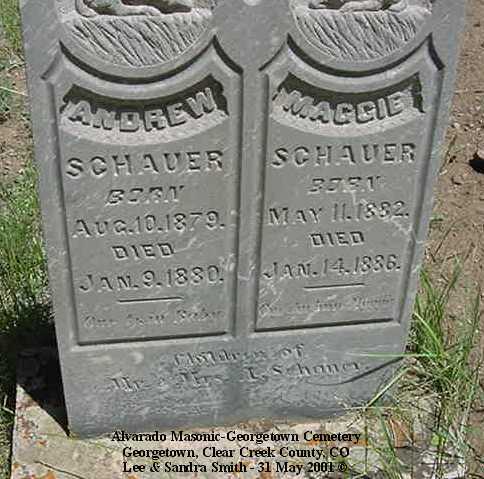 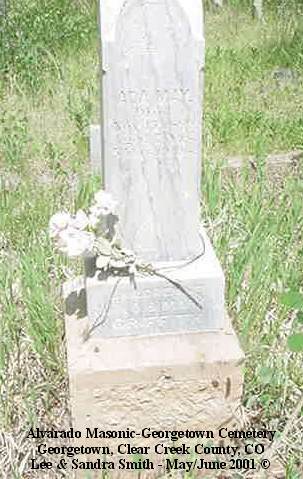 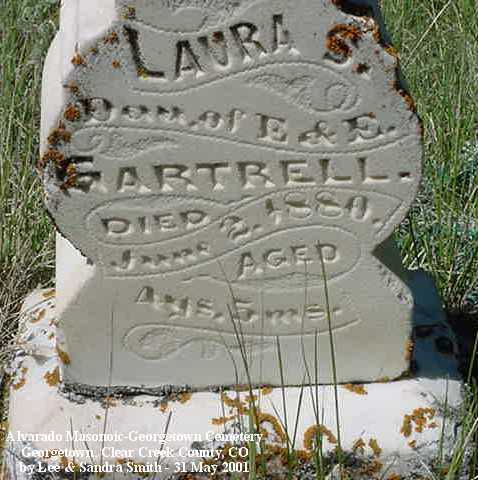 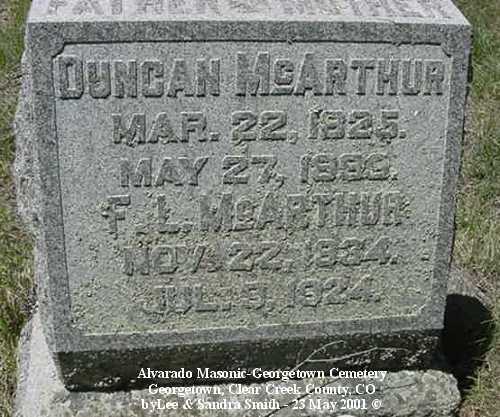 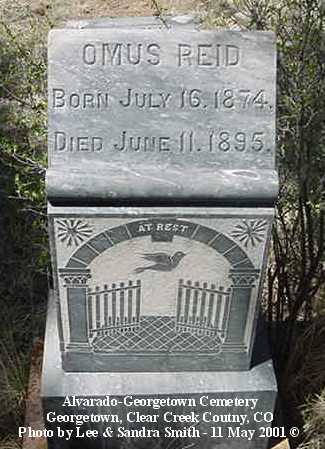 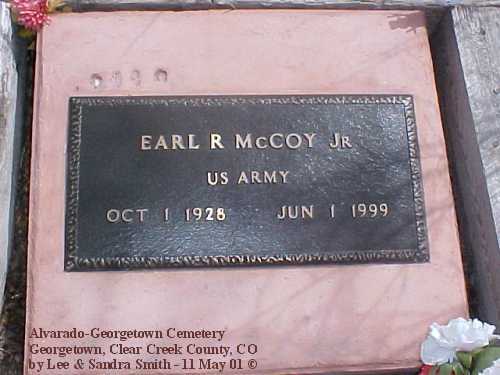 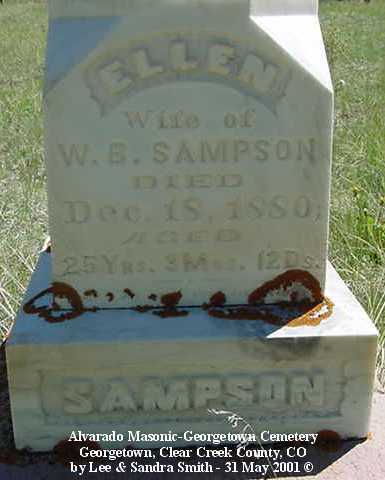 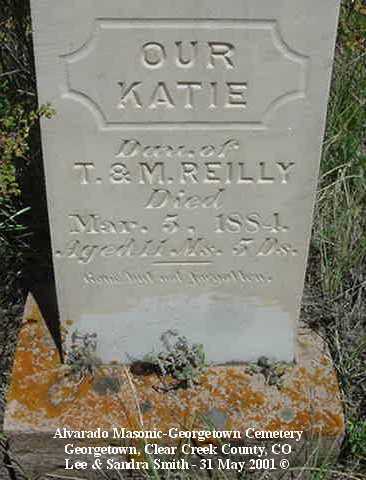 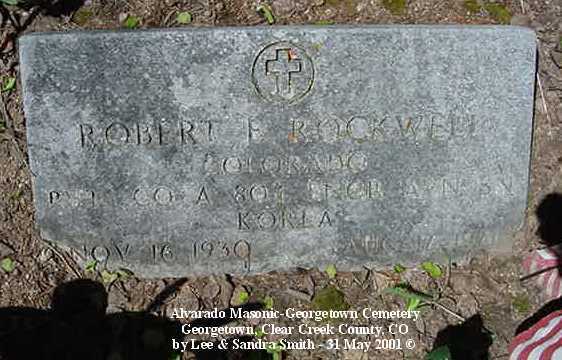 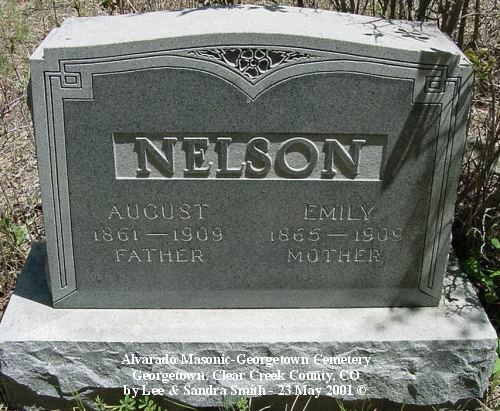 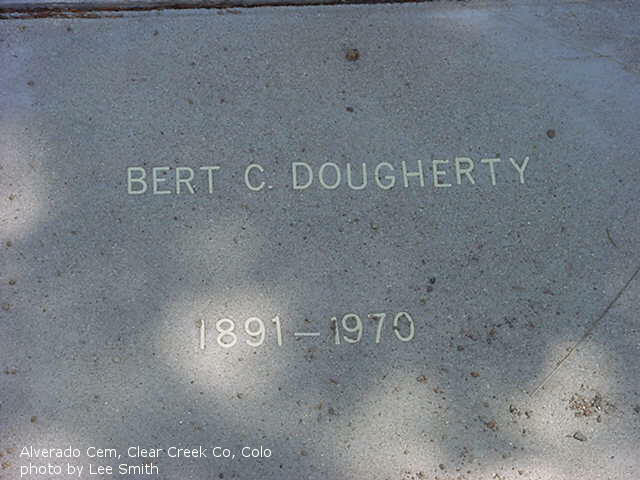 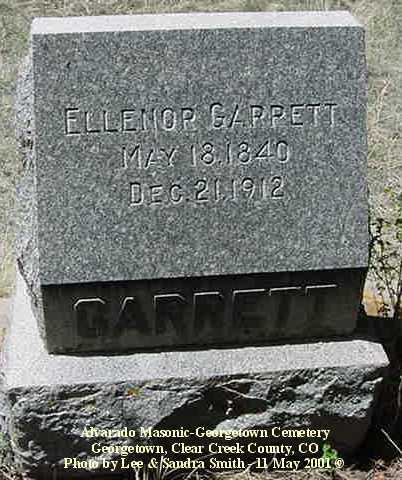 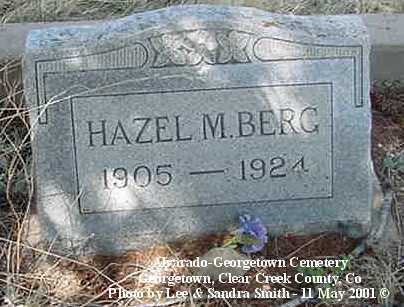 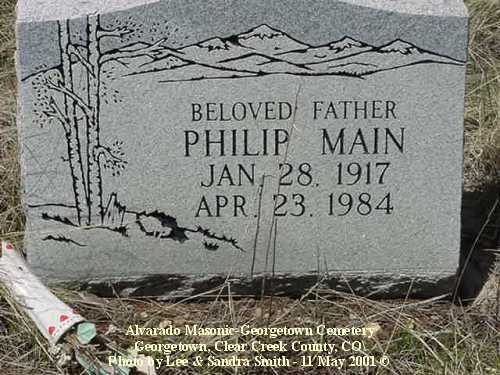 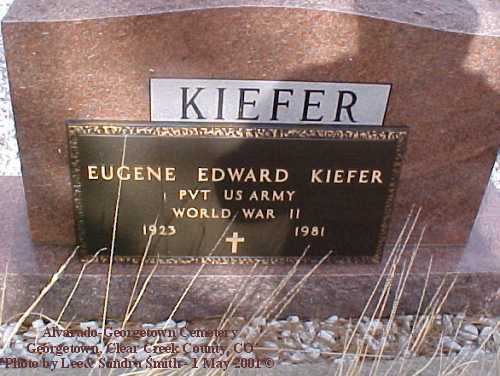 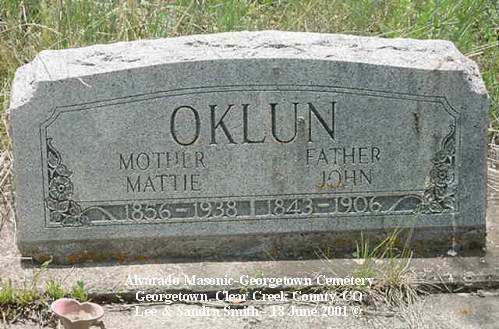 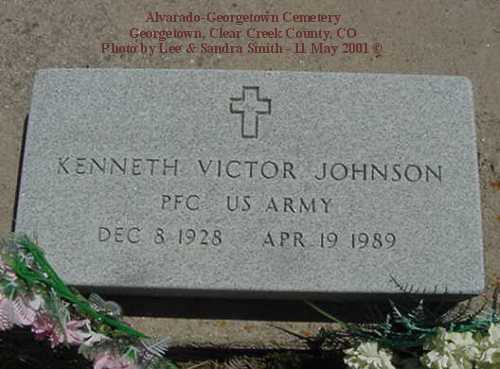 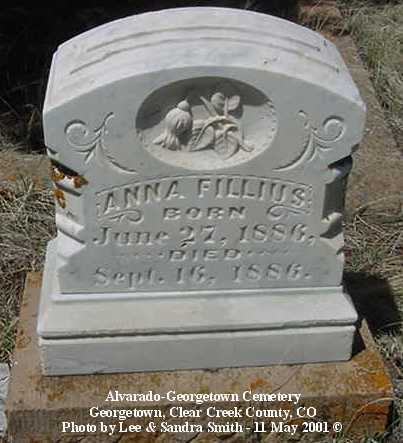 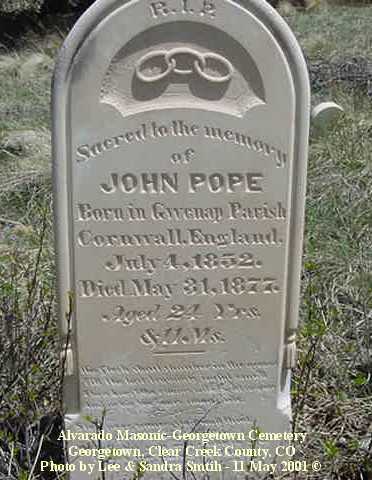 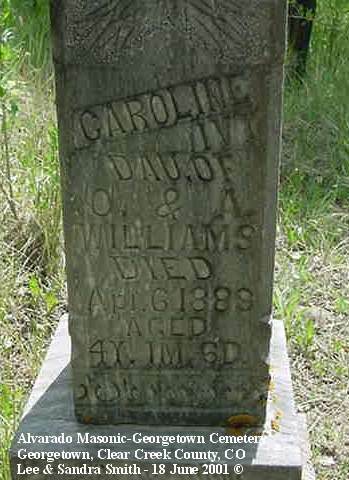 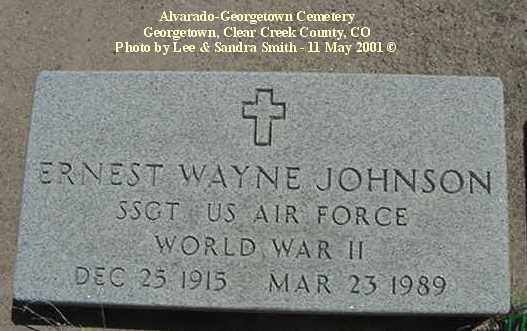 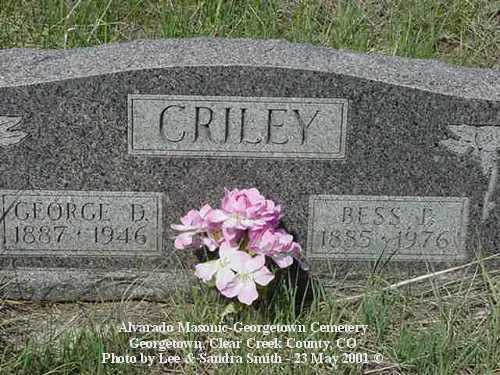 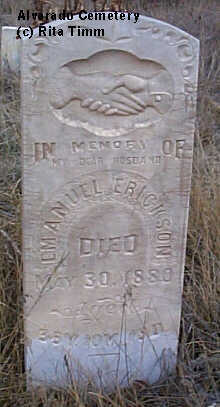 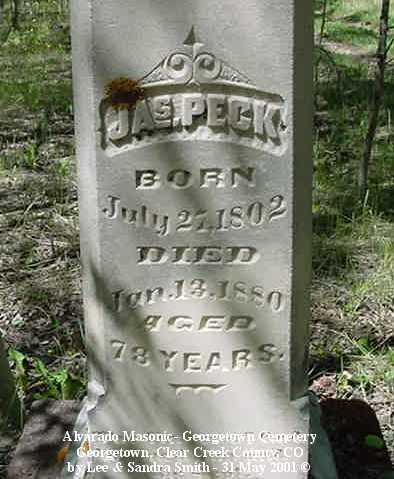 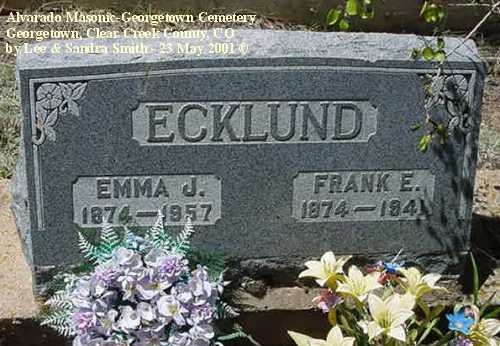 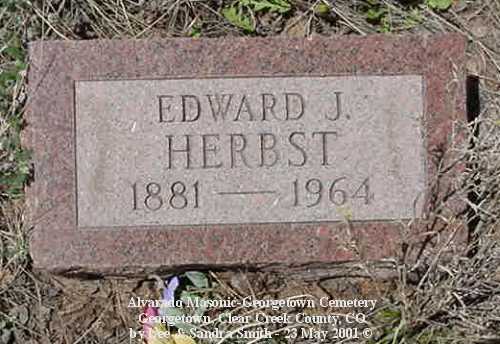 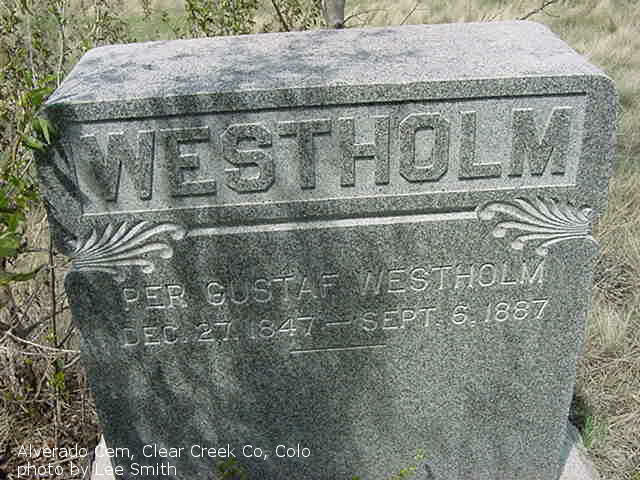 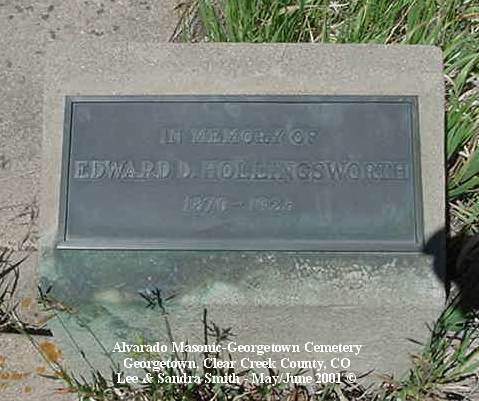 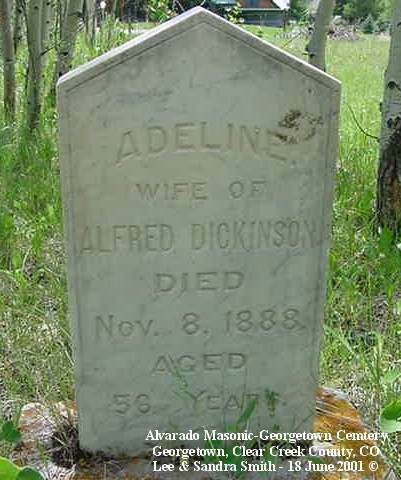 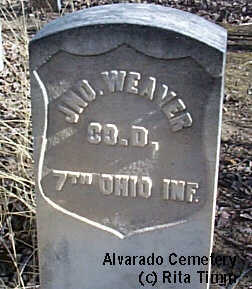 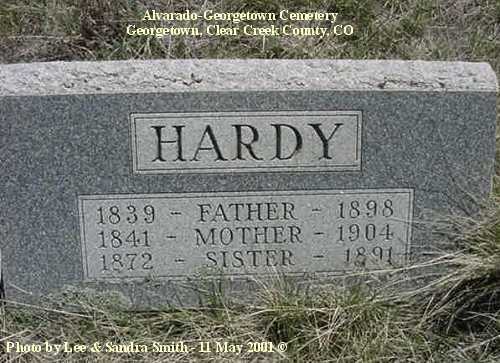 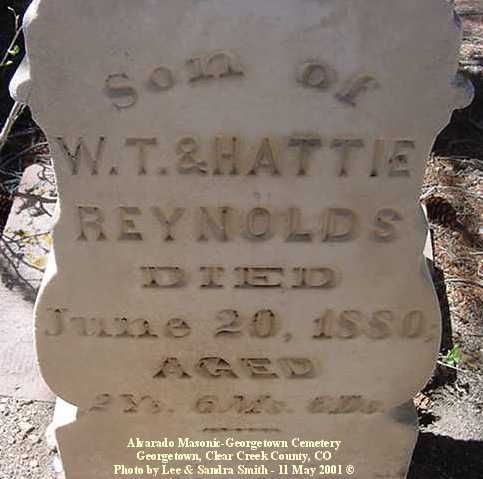 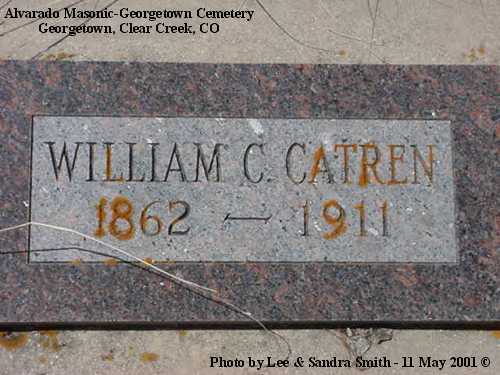 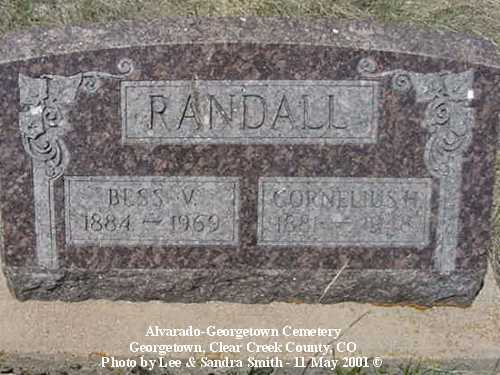 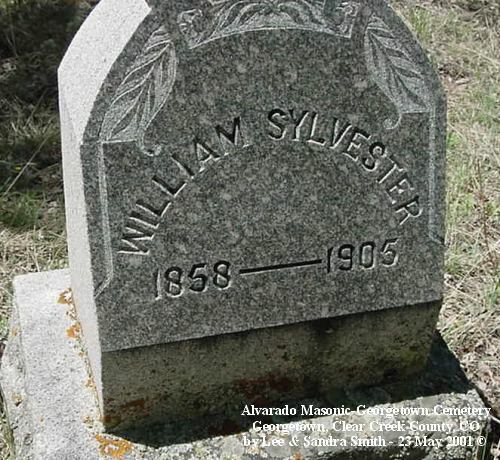 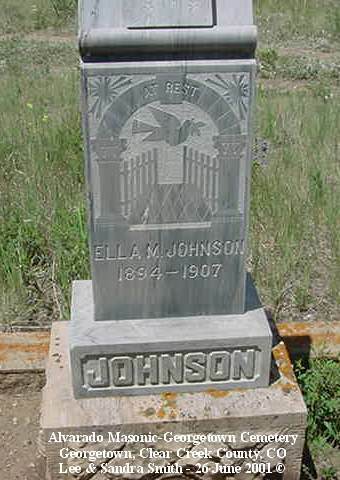 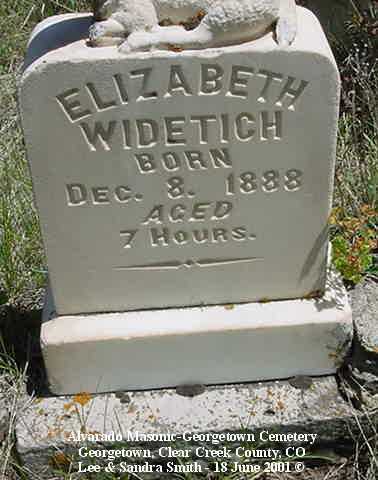 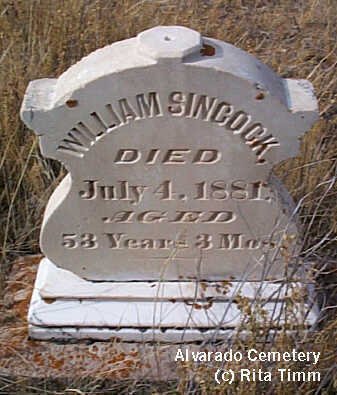 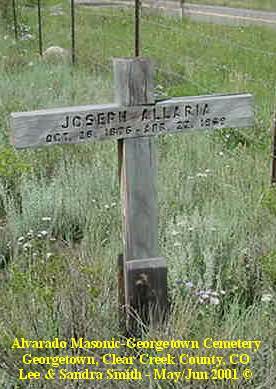 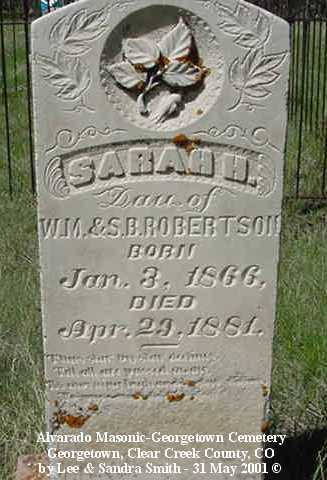 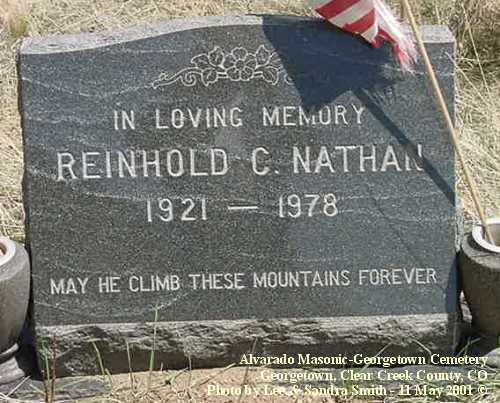 The cemetery is located approximately five miles east of Georgetown, Colorado on the I-70 frontage road. 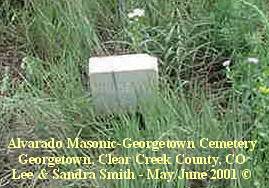 Take the Georgetown exit off of I-70, turn left at the 4-way stop when entering the town, and proceed east past the lake. 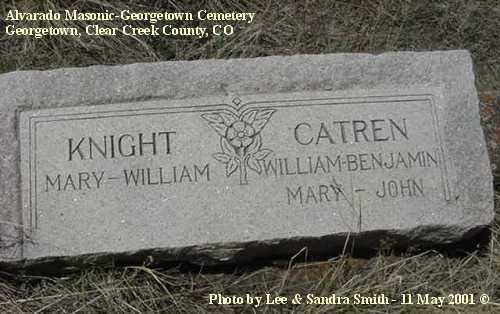 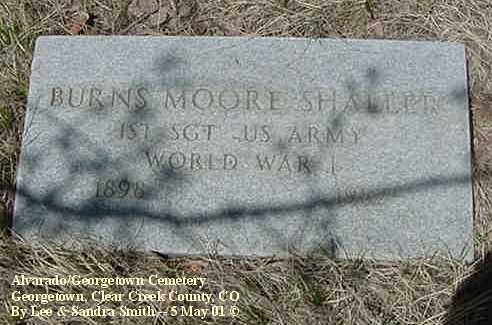 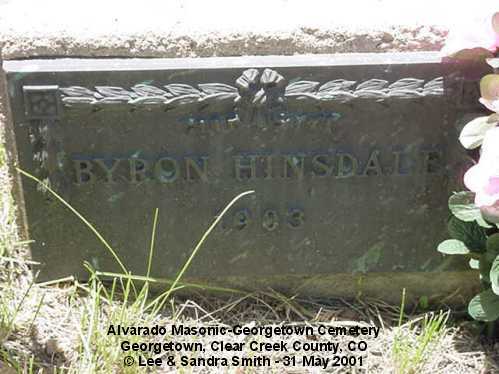 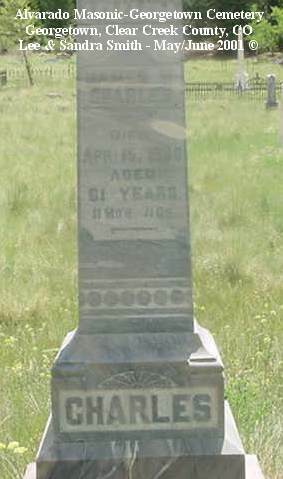 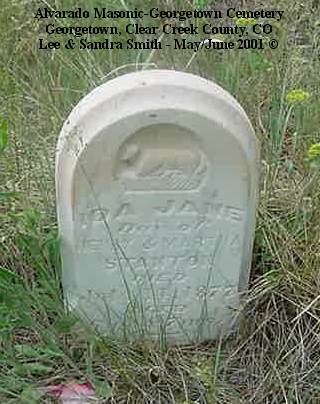 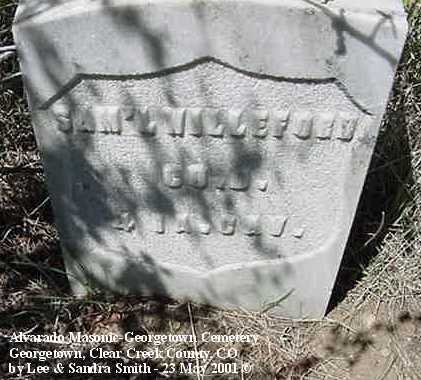 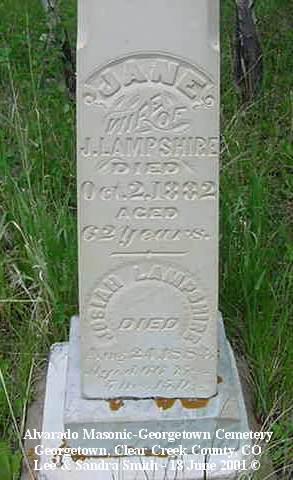 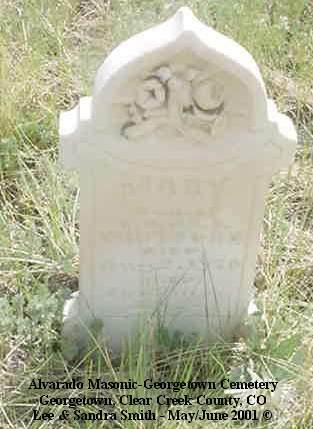 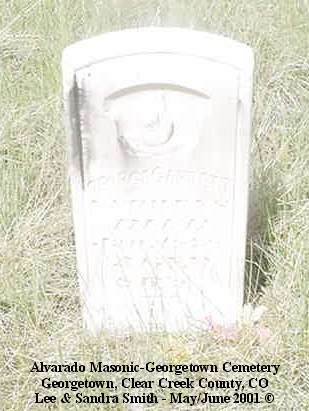 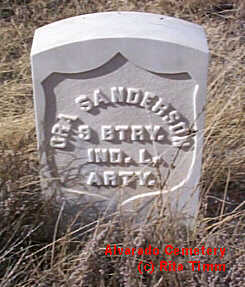 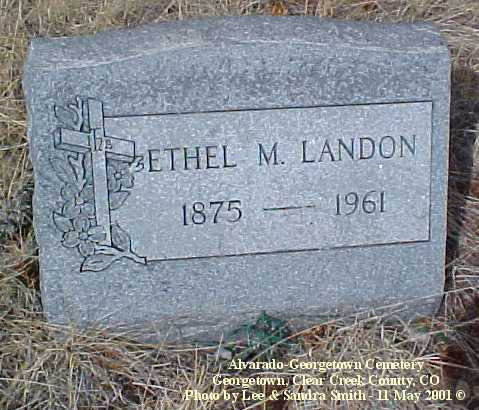 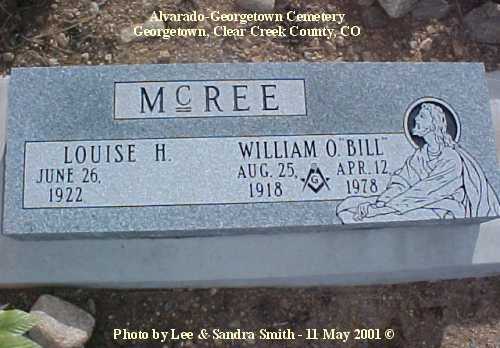 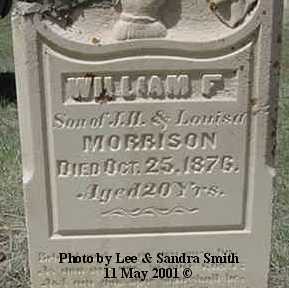 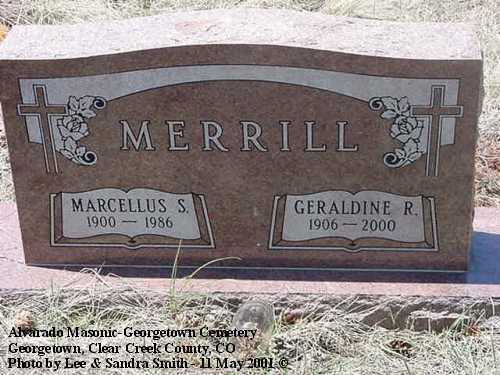 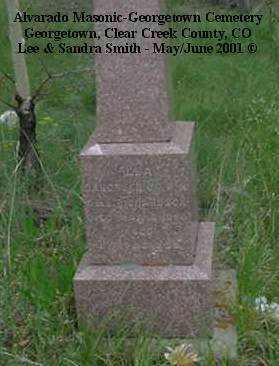 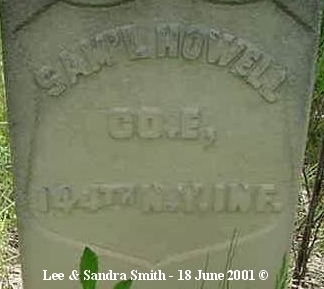 Lee and Sandra Smith of Broomfield, Colorado transcribed the cemetery during the spring and summer of 2001. 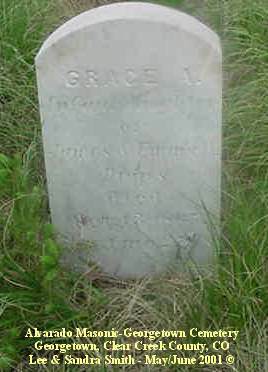 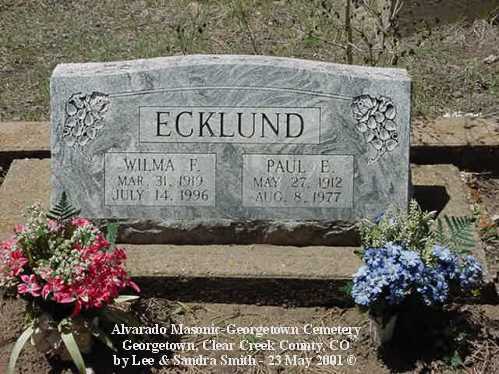 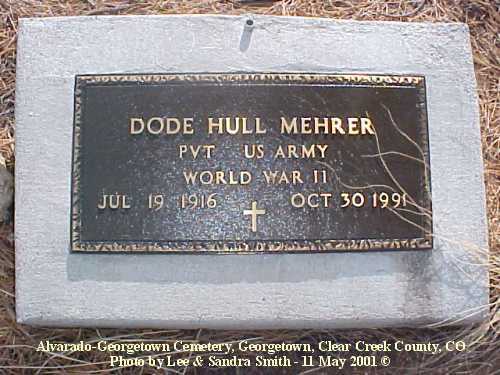 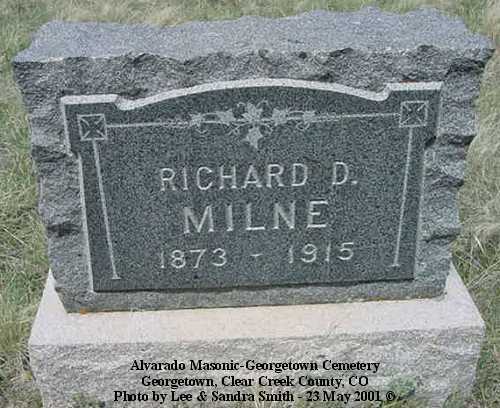 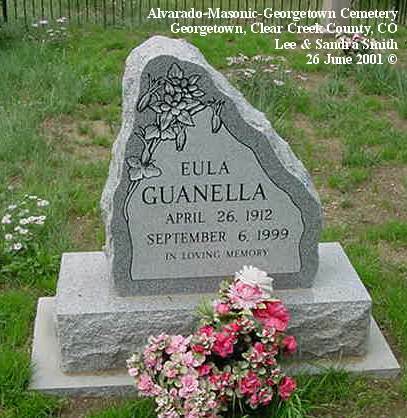 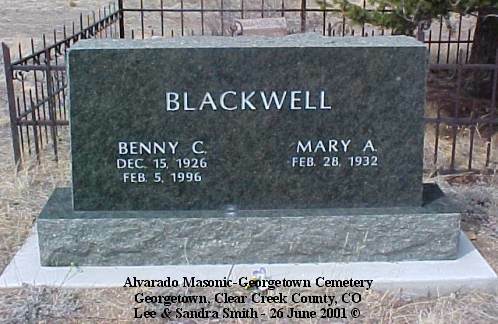 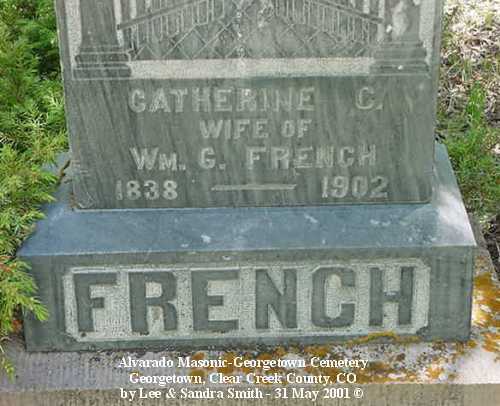 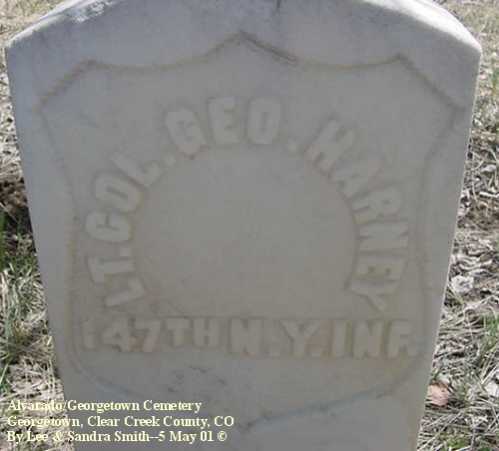 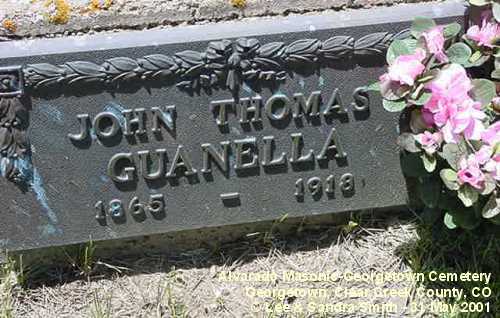 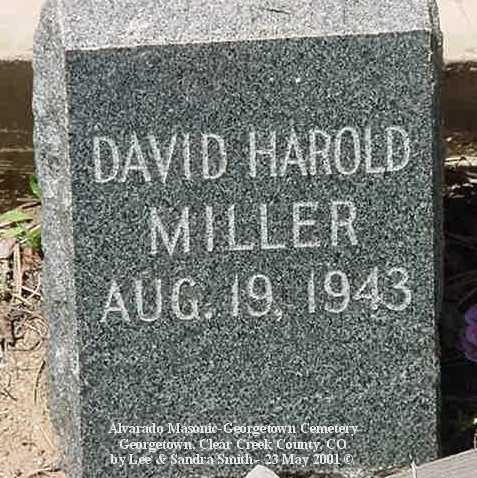 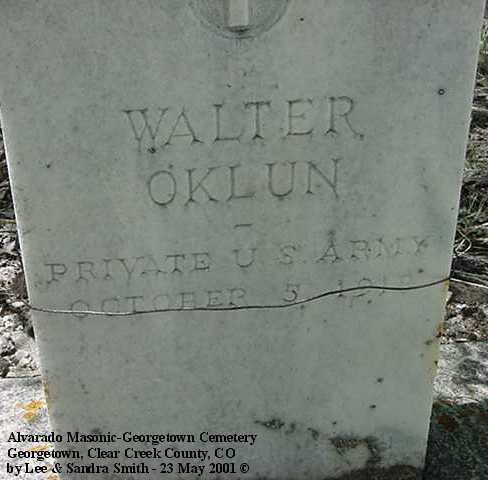 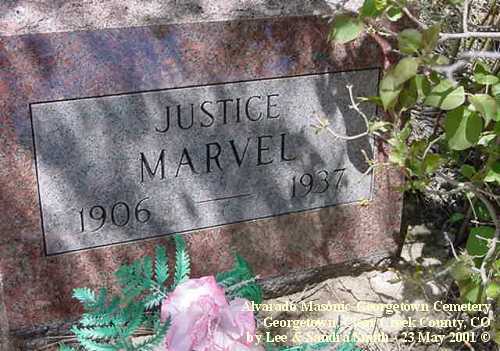 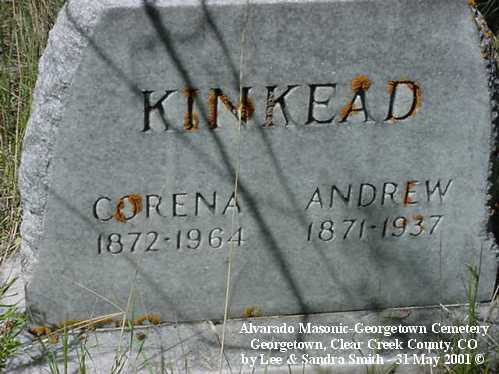 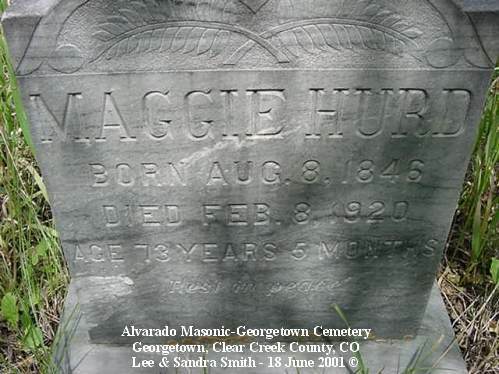 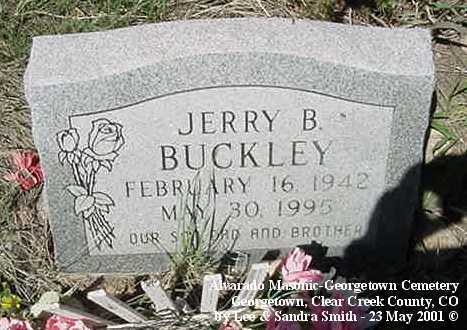 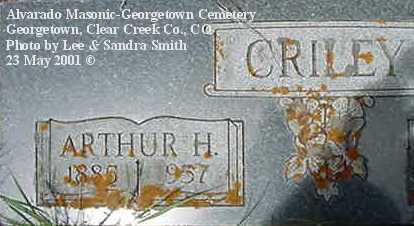 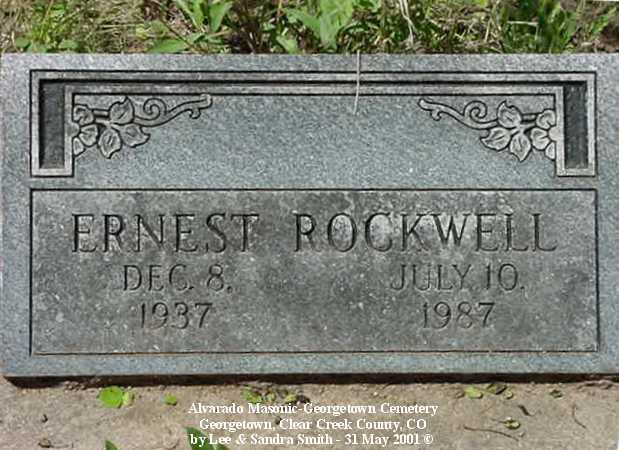 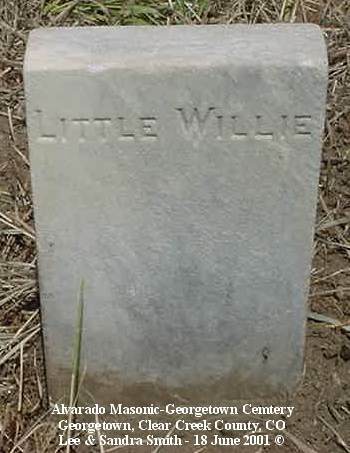 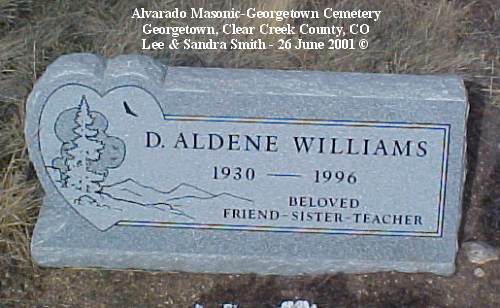 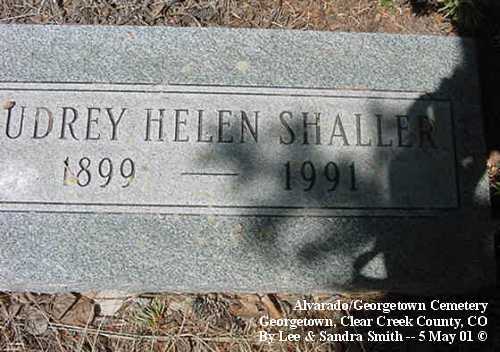 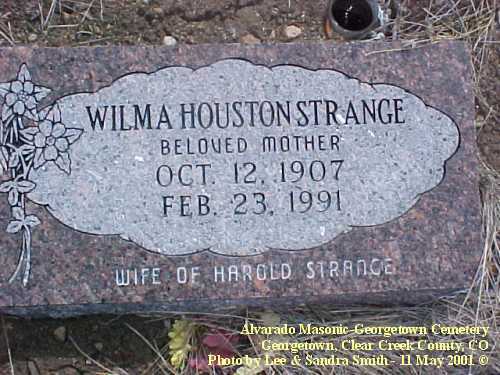 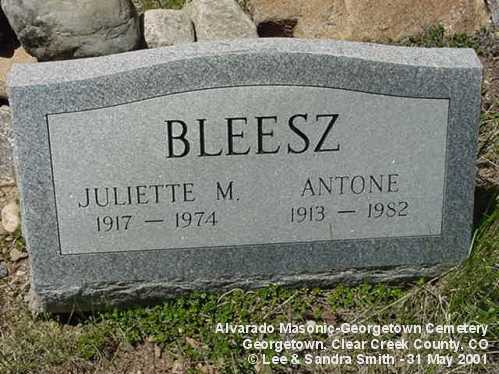 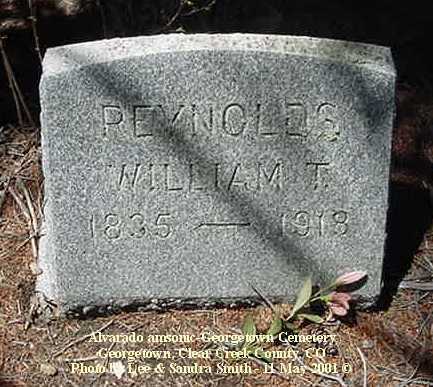 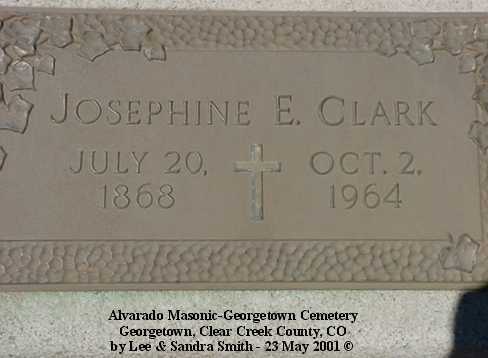 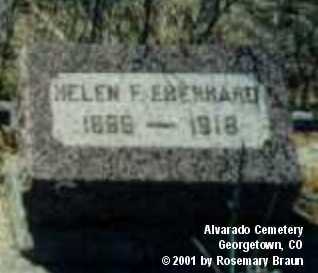 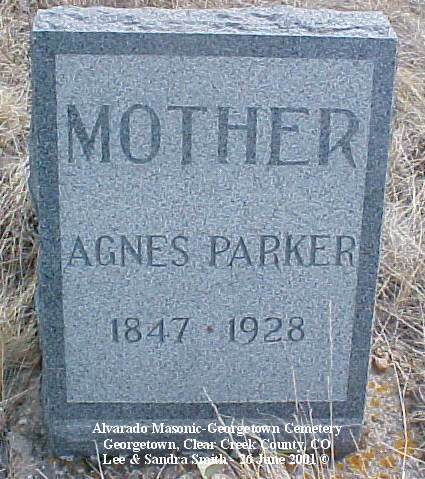 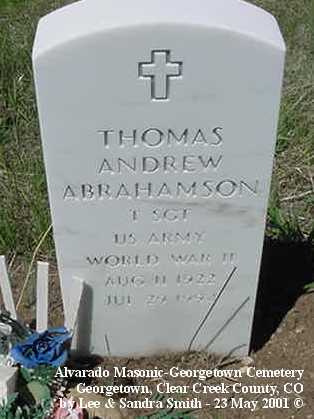 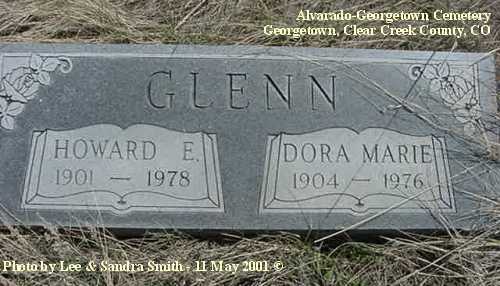 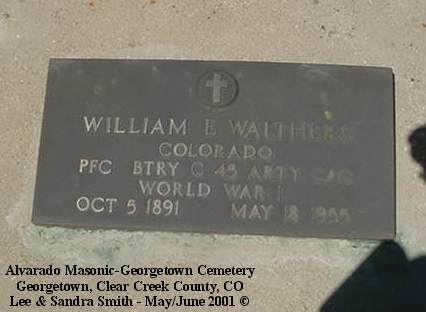 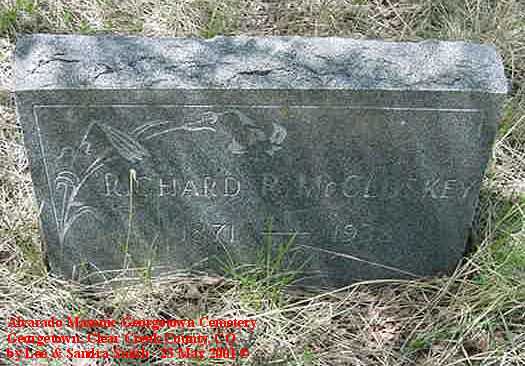 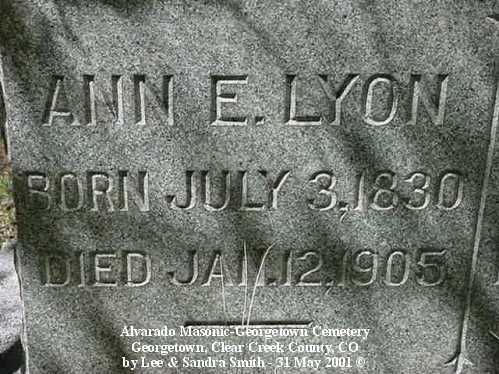 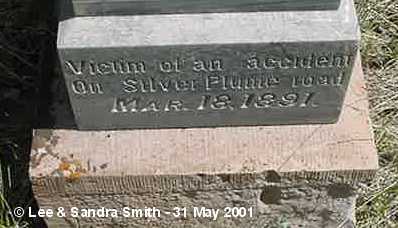 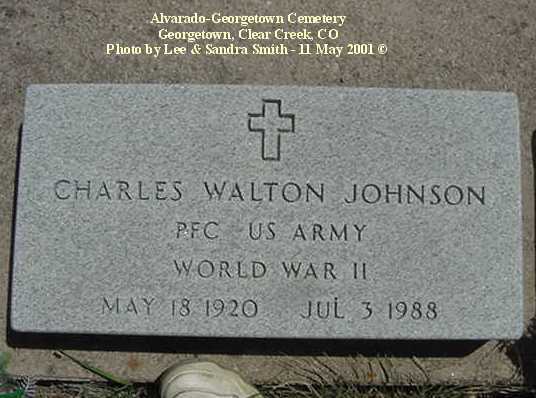 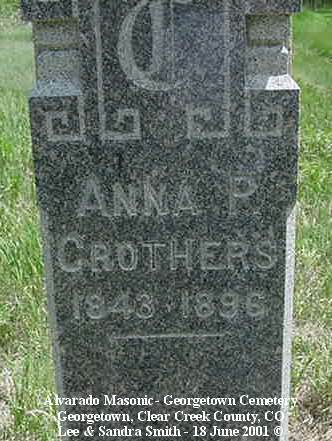 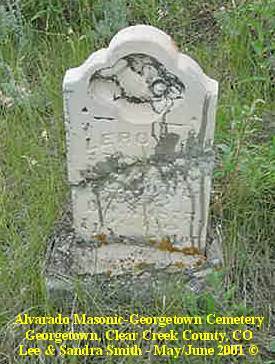 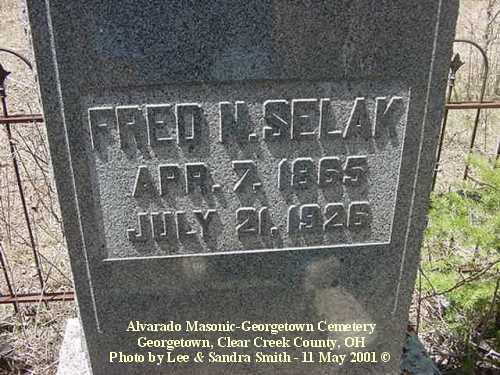 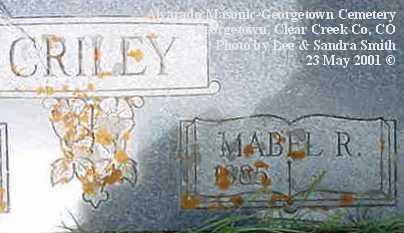 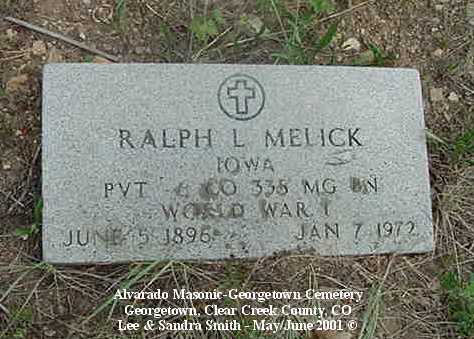 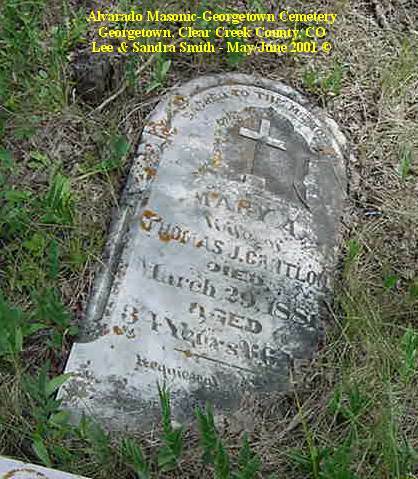 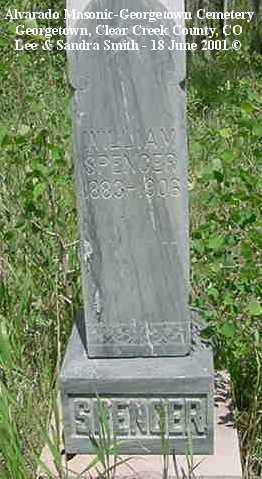 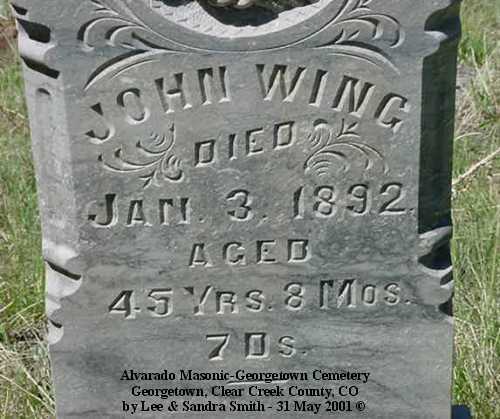 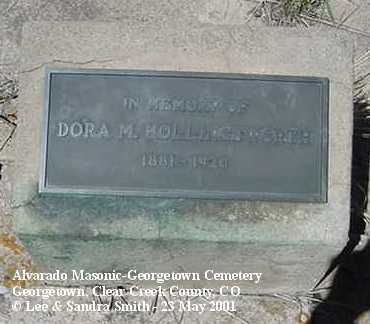 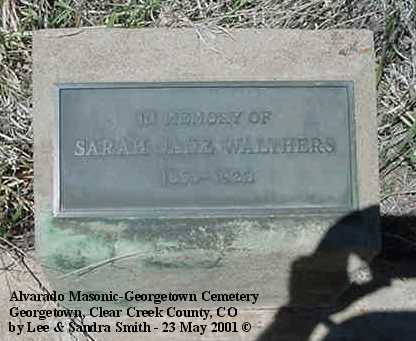 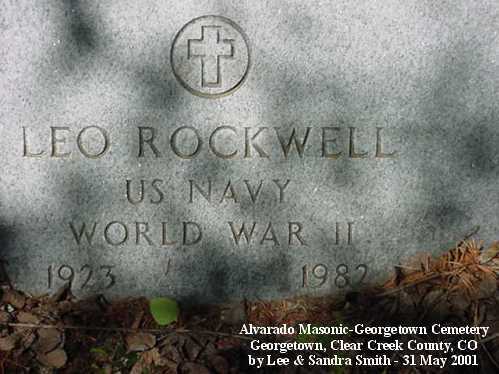 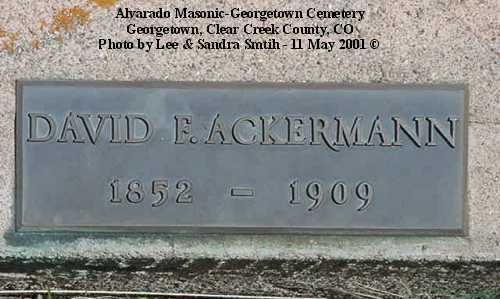 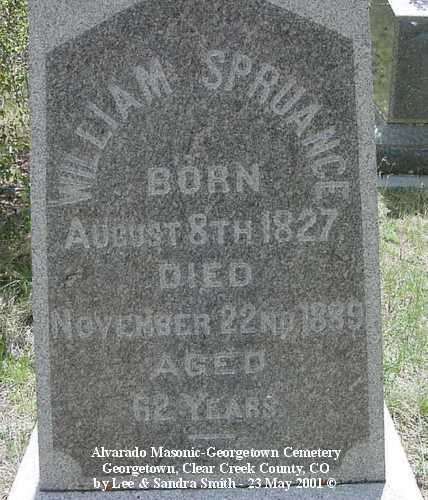 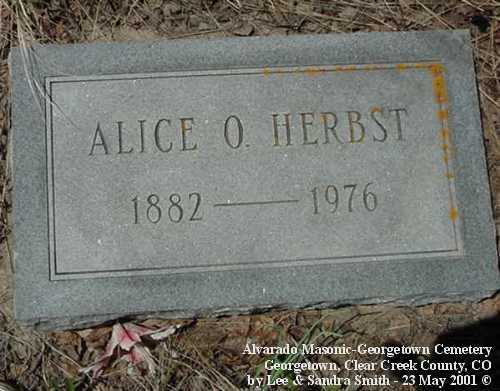 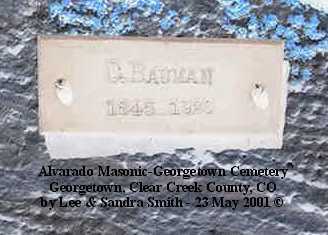 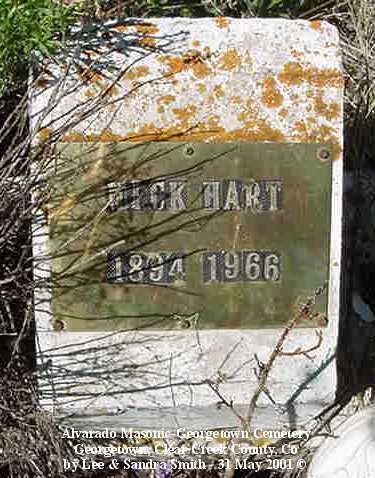 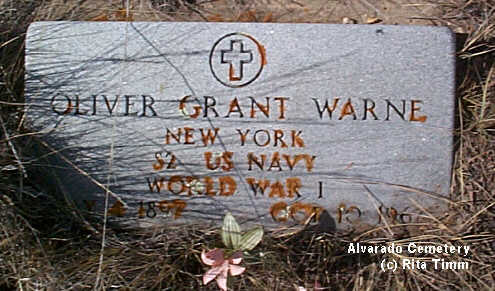 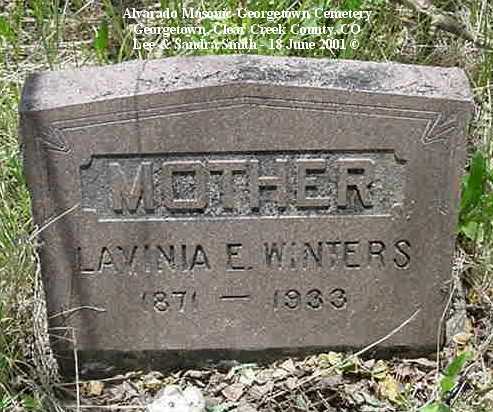 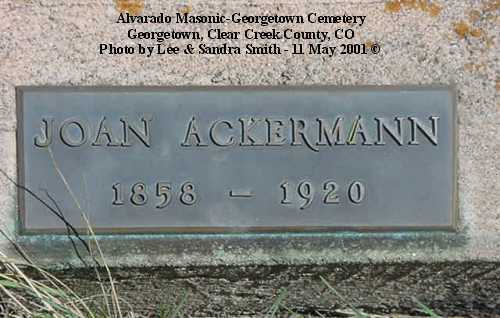 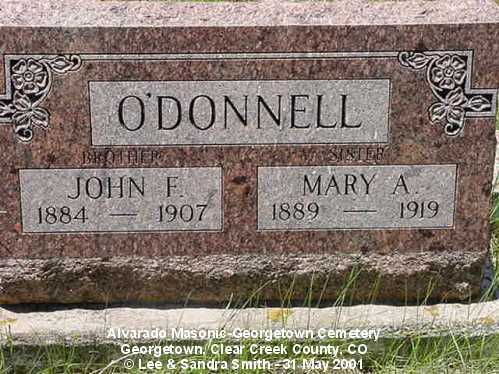 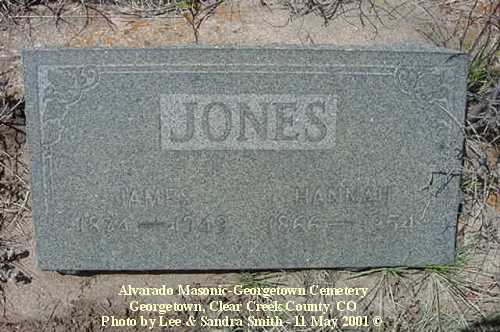 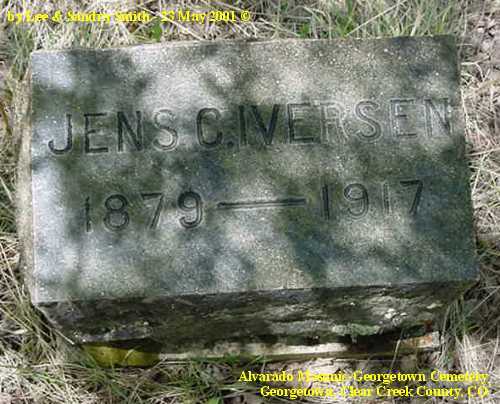 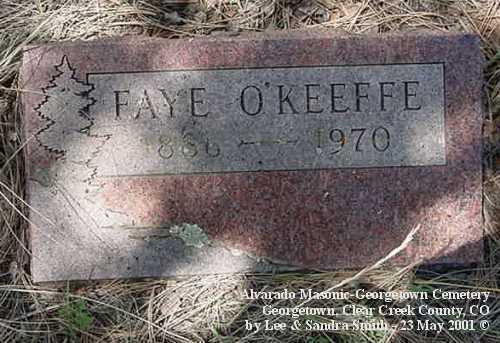 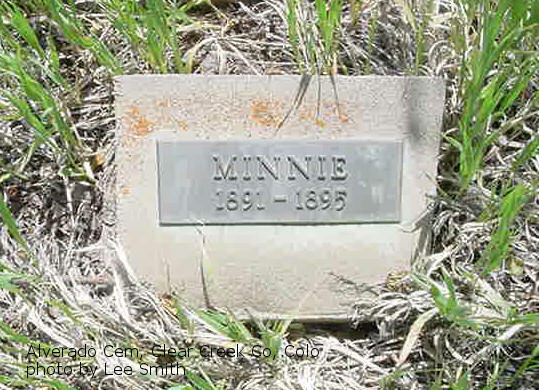 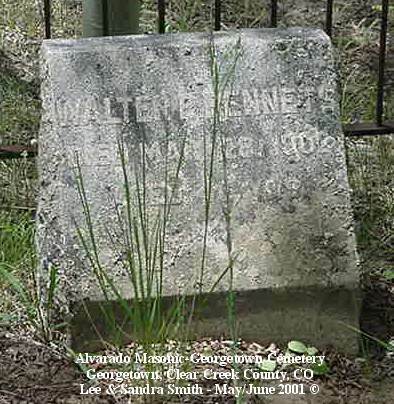 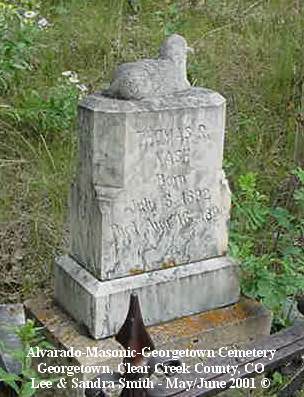 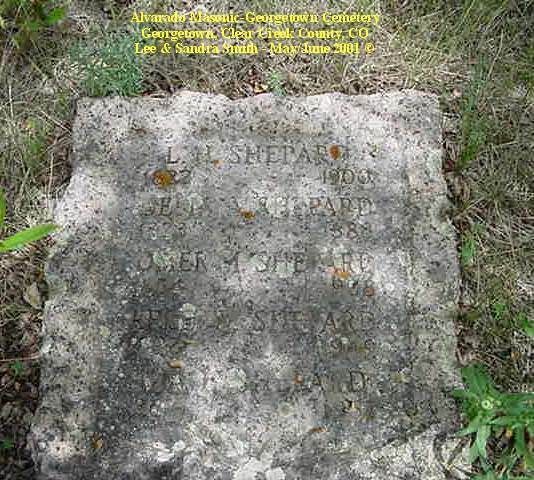 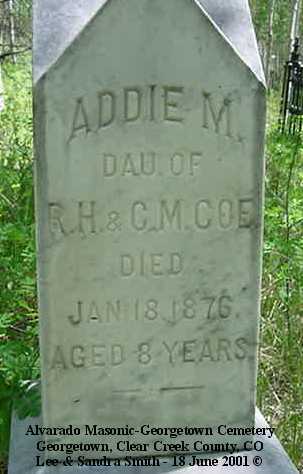 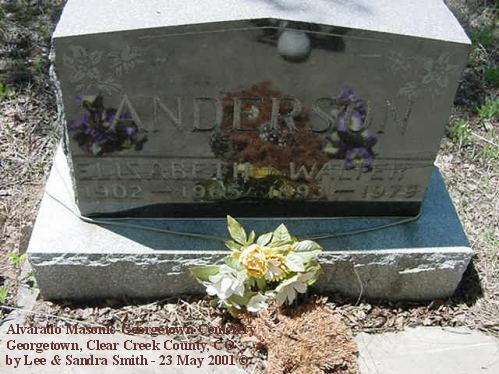 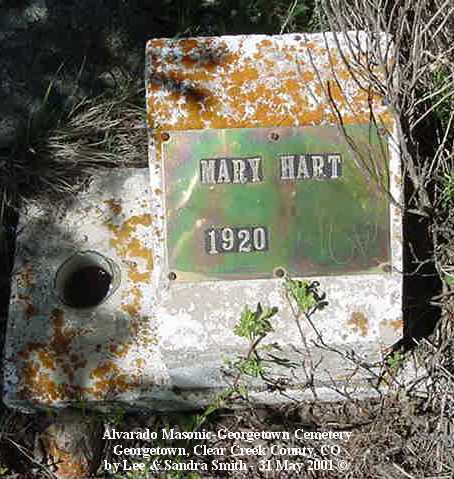 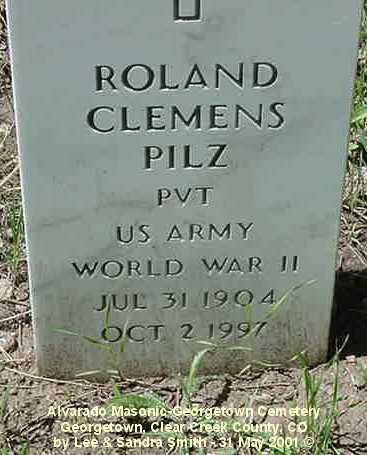 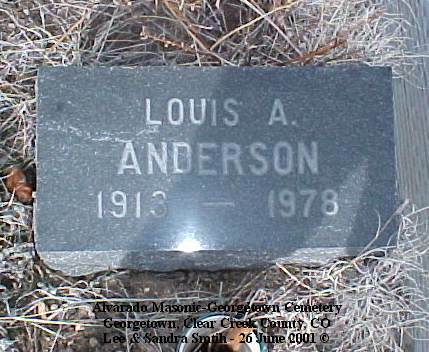 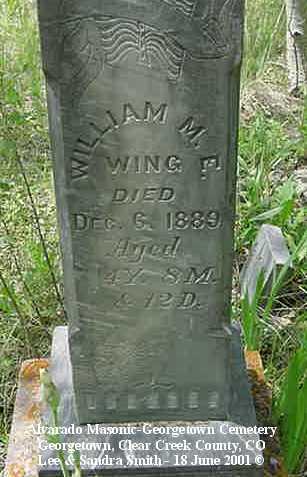 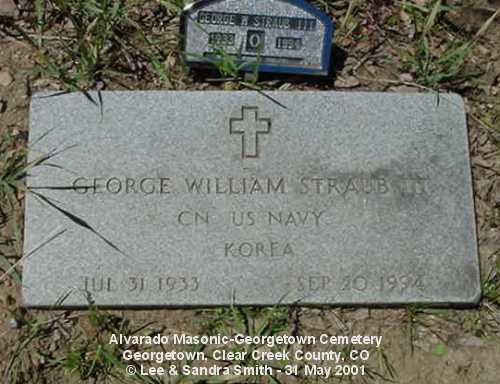 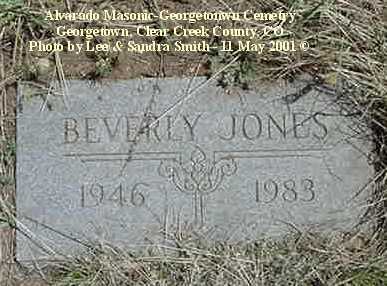 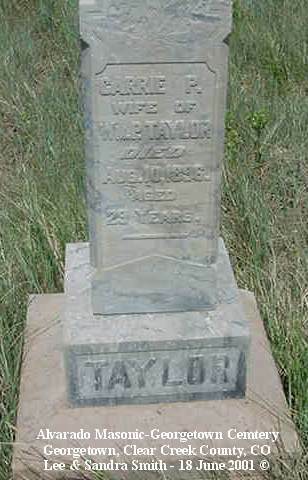 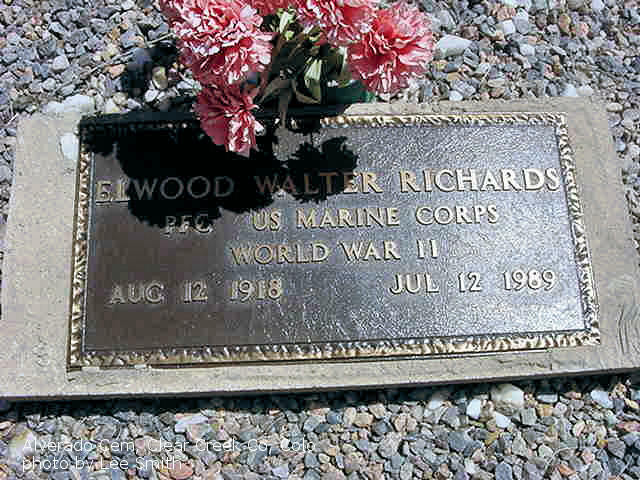 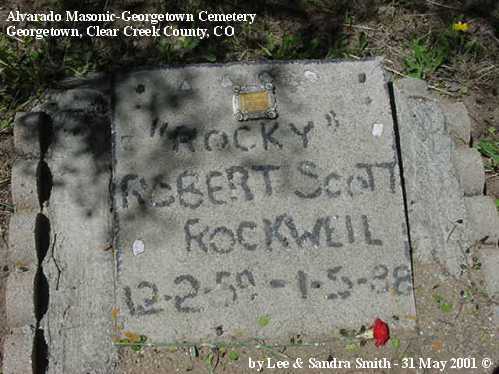 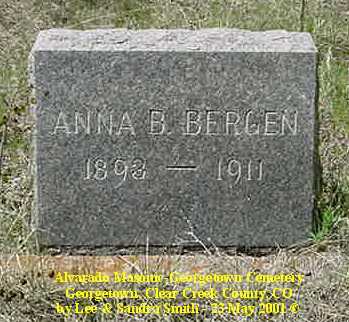 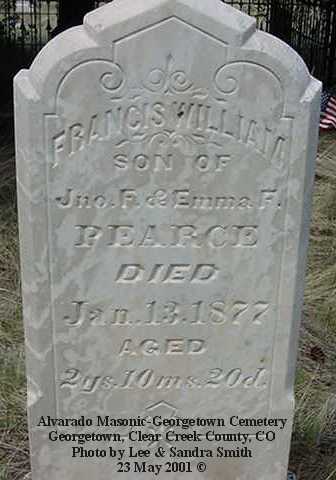 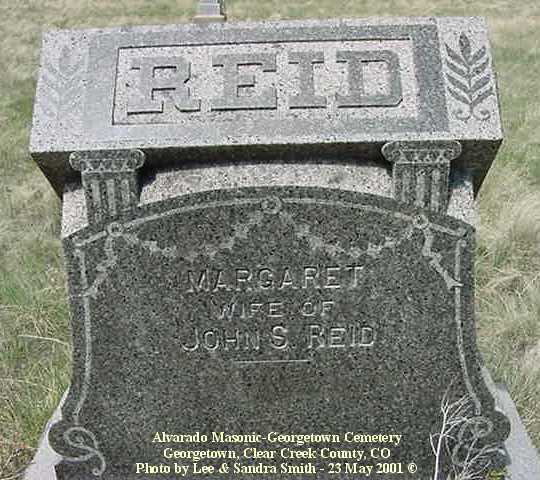 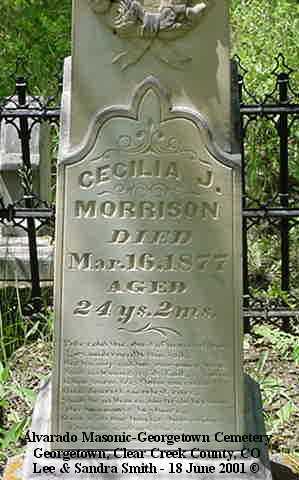 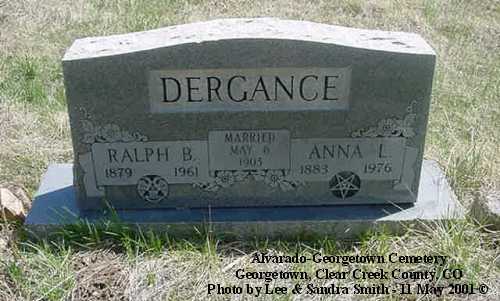 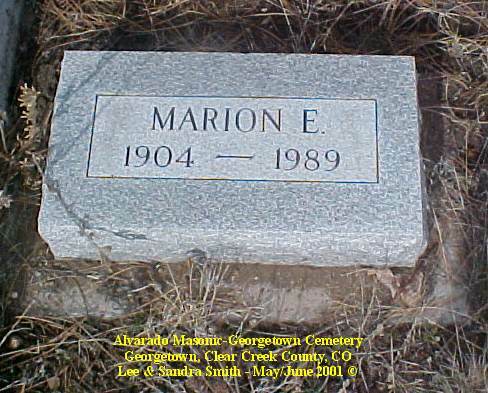 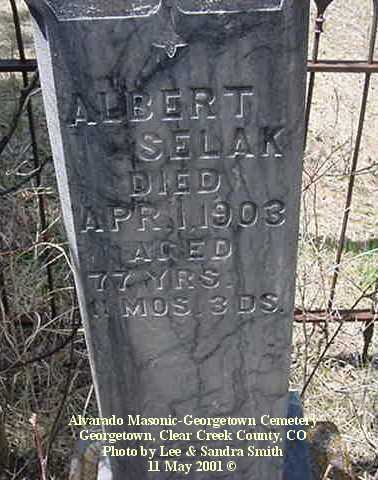 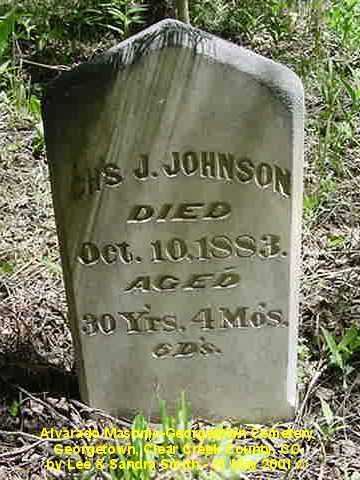 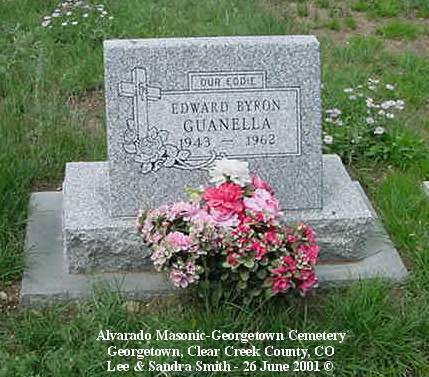 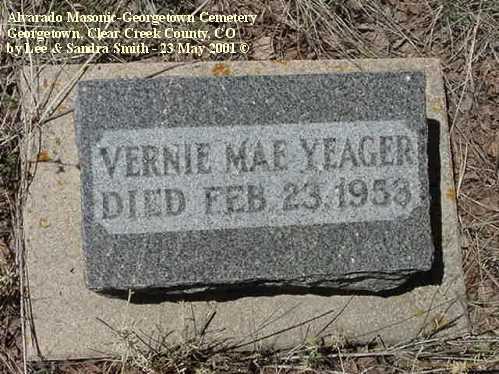 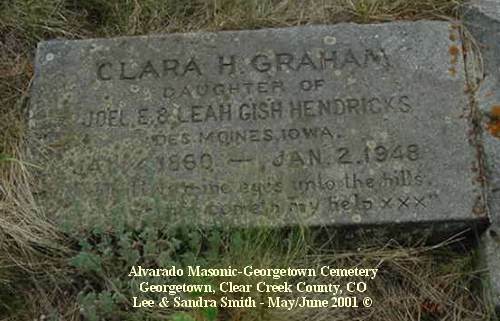 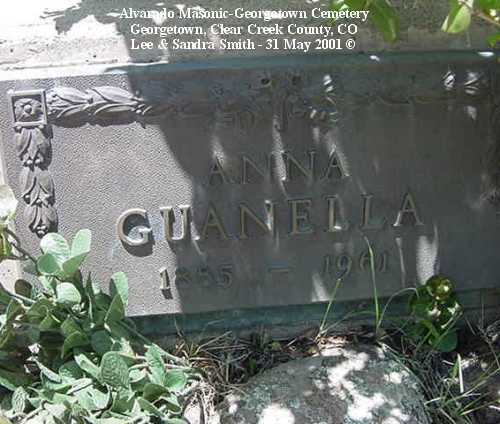 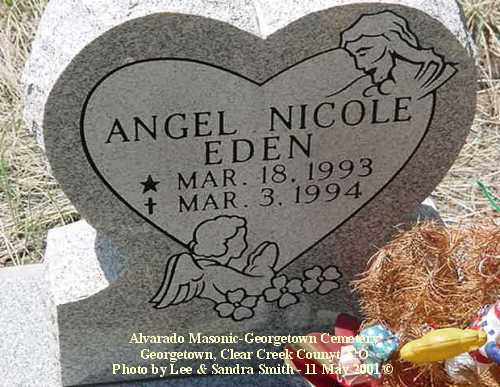 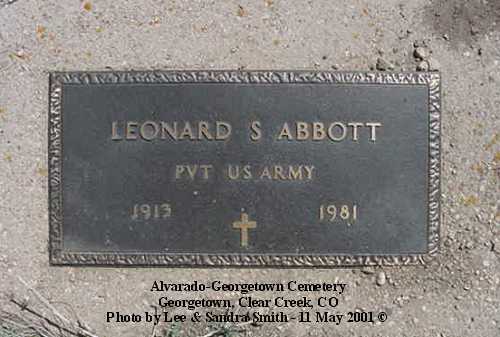 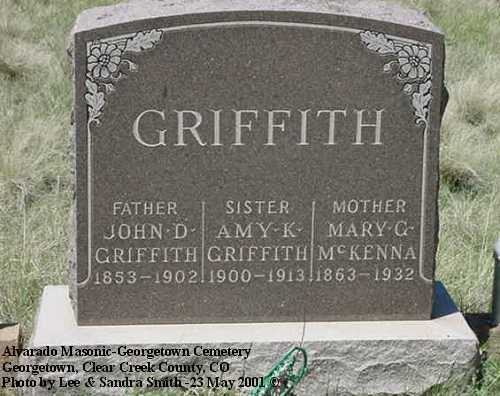 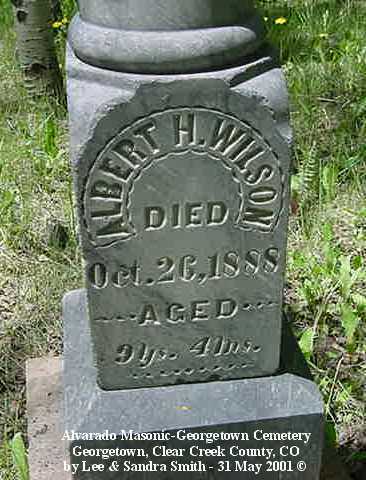 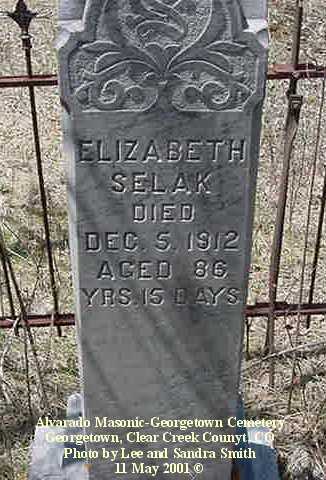 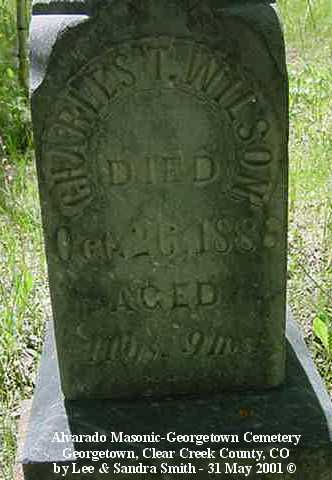 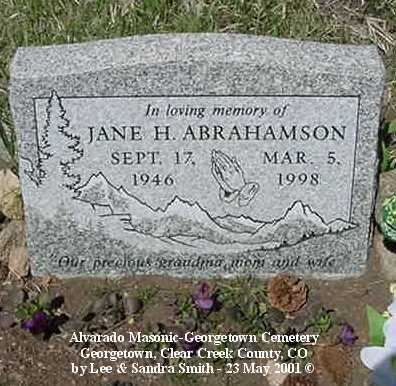 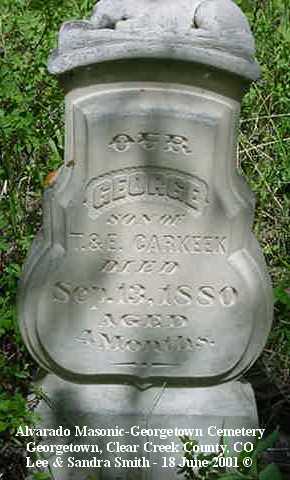 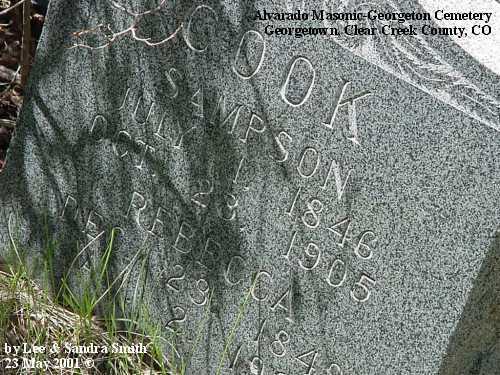 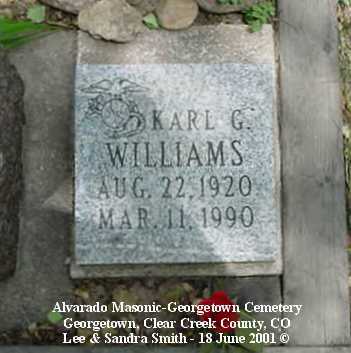 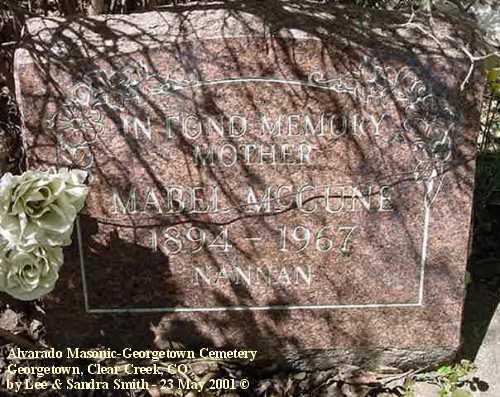 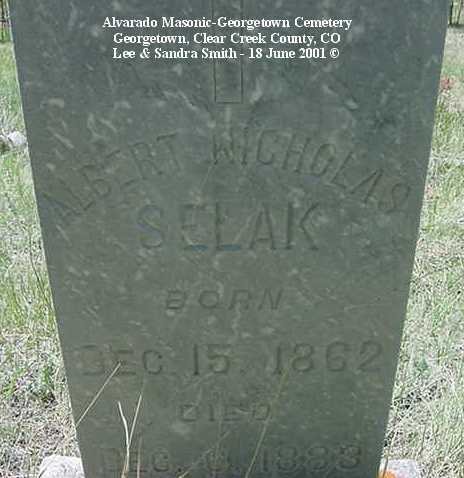 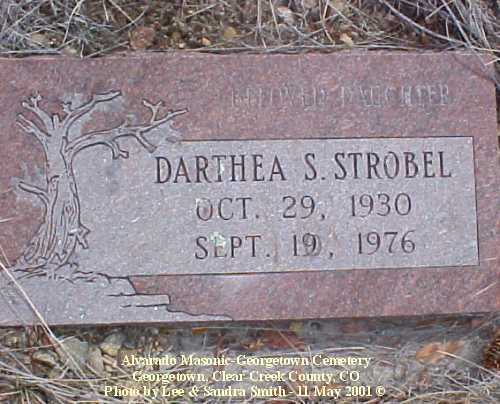 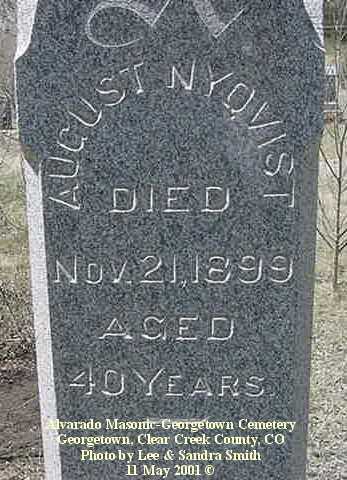 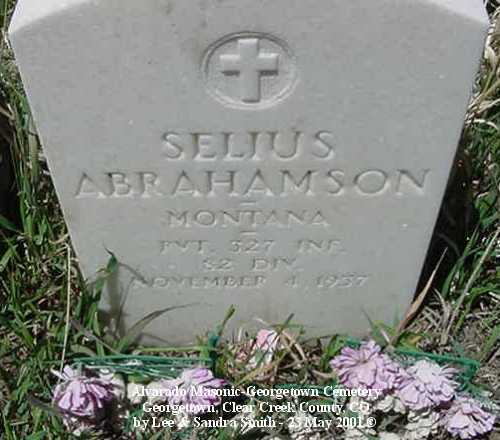 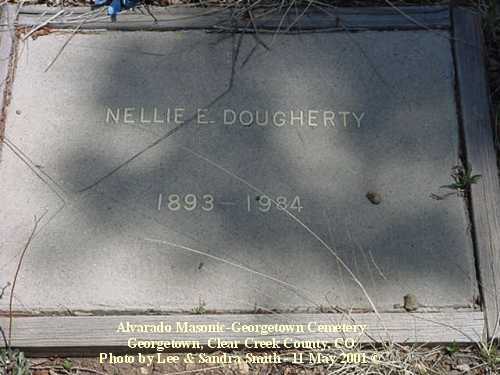 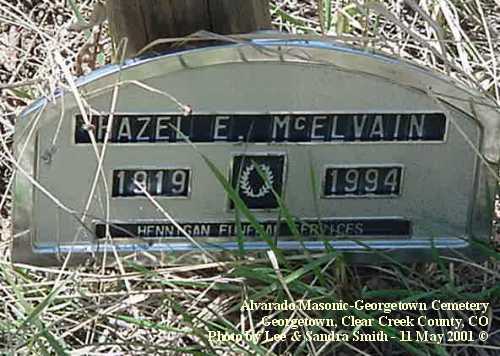 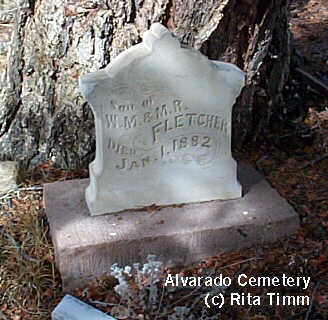 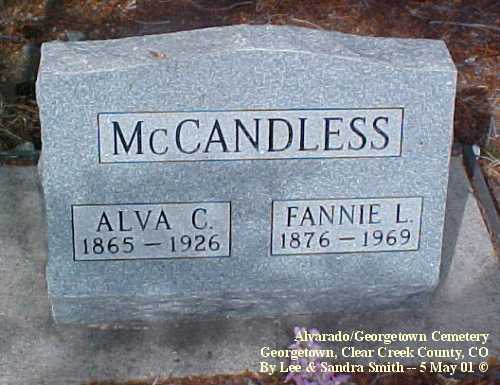 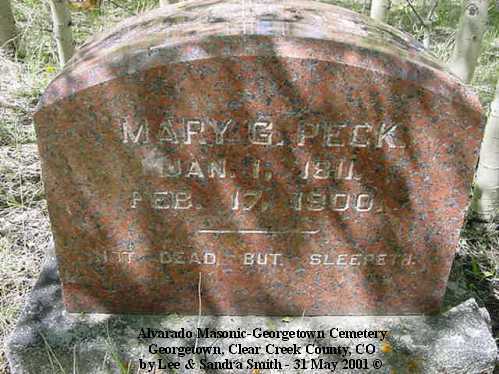 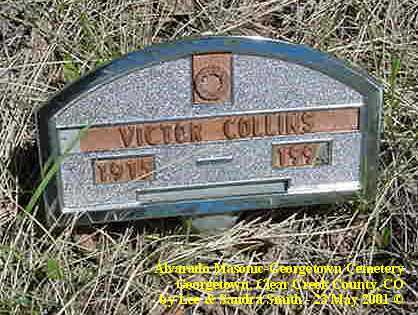 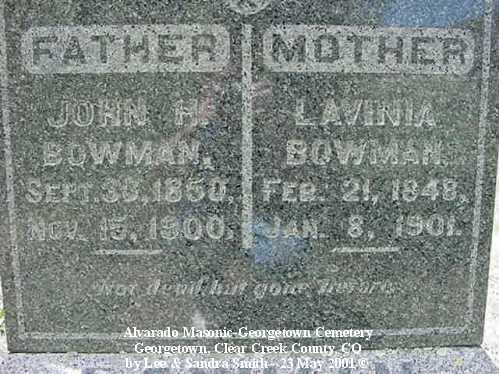 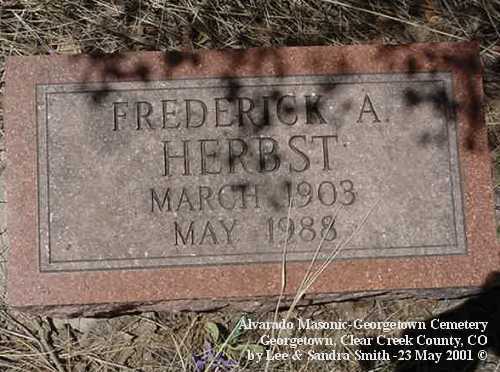 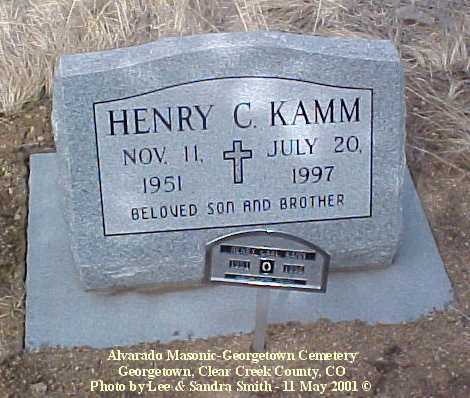 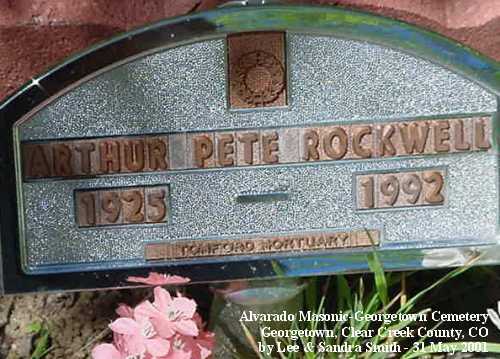 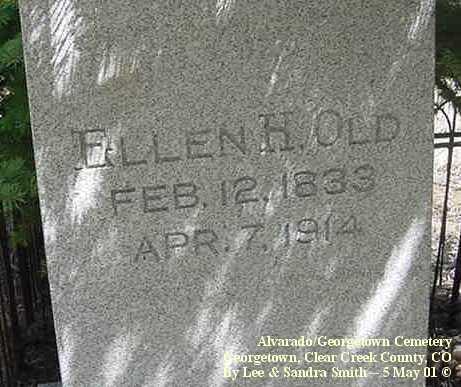 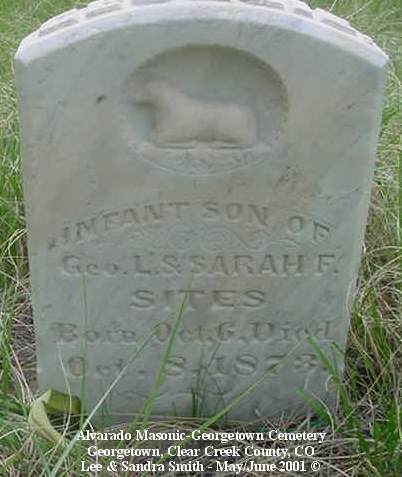 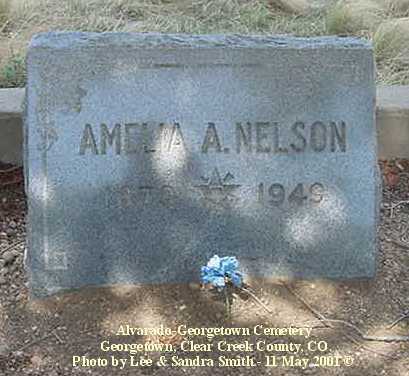 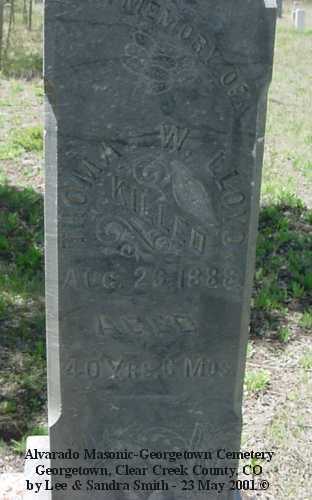 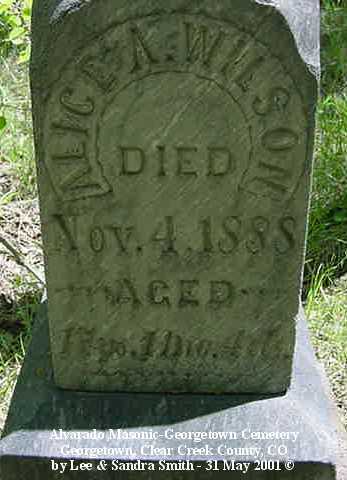 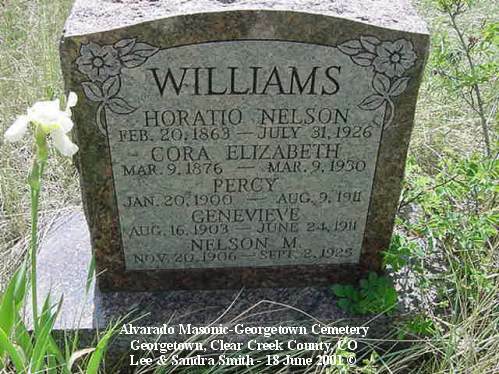 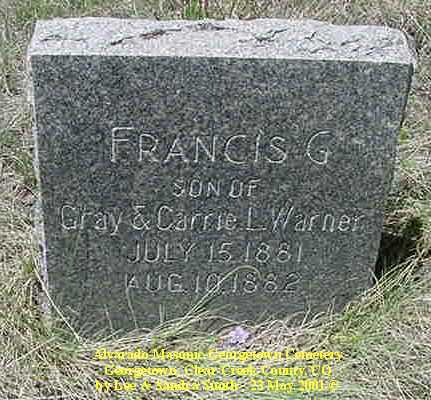 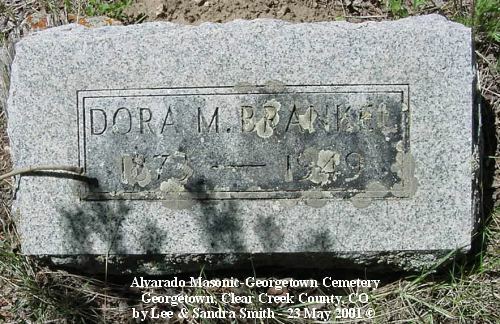 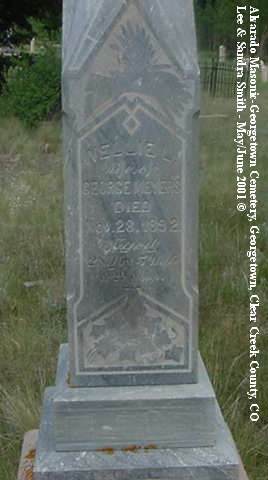 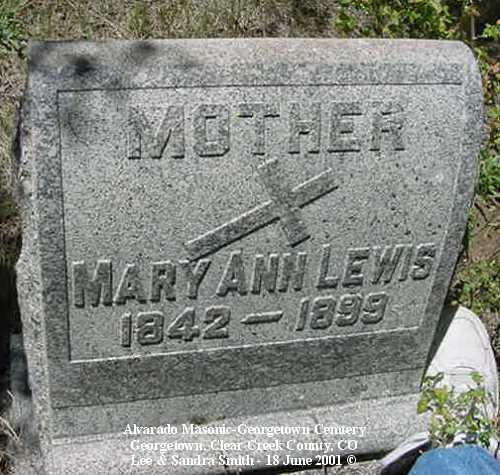 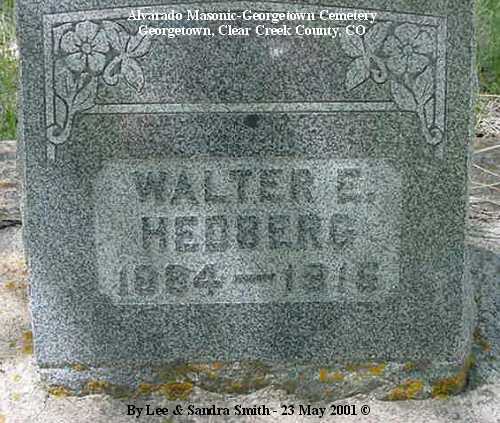 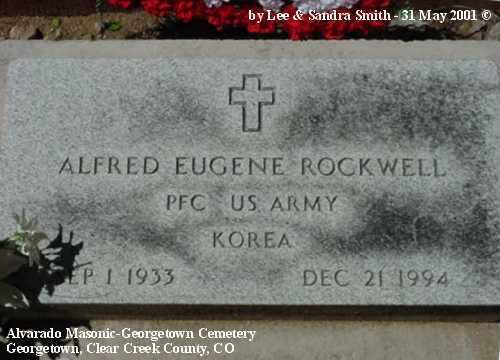 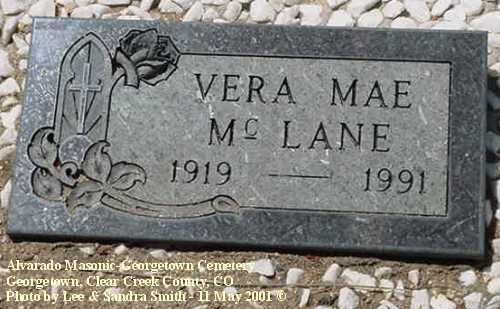 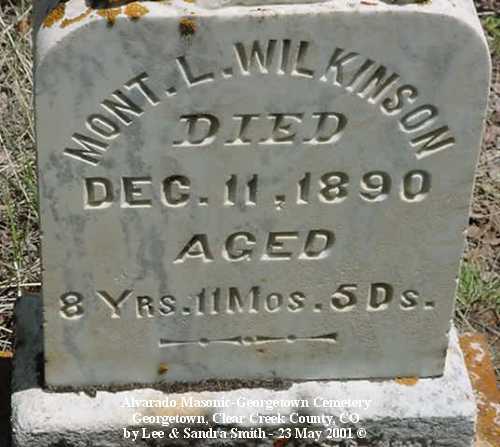 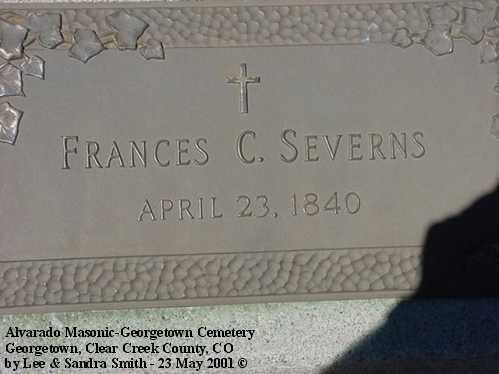 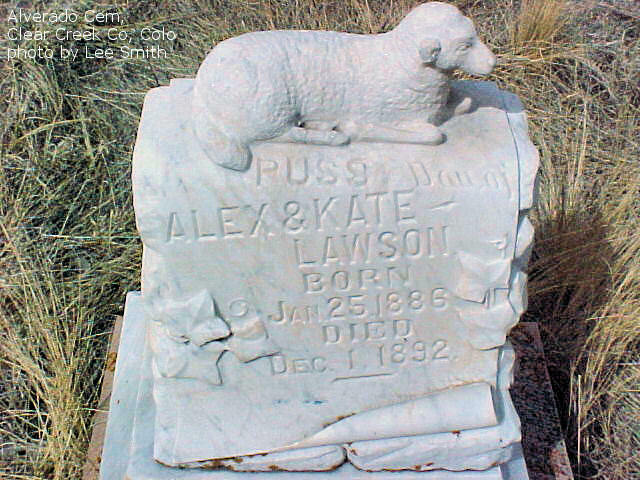 This is the complete photo collection; there are additional names indexed at http://files.usgwarchives.net/co/clearcreek/cemeteries/georgetwn.txt. 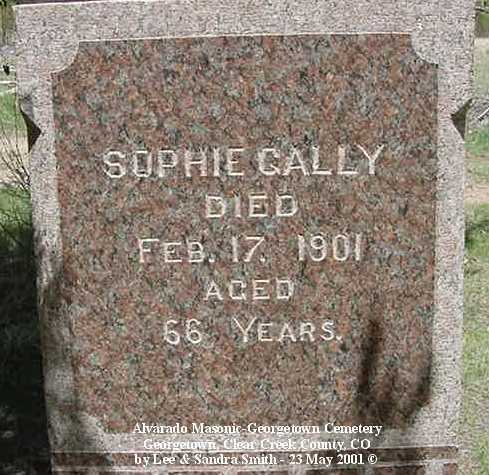 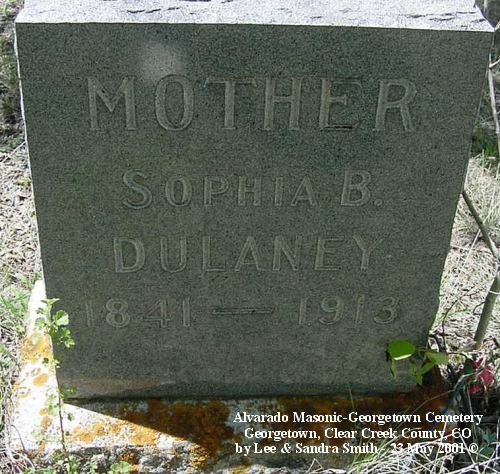 Also buried in this grave is Sophie Galley (see below) who was Louis Dupuy's maid for many years and to whom he willed his hotel, the famous Hotel De Paris. 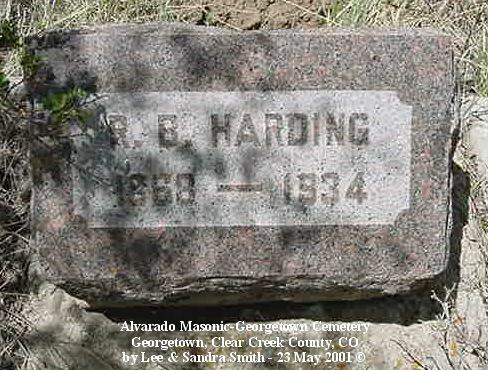 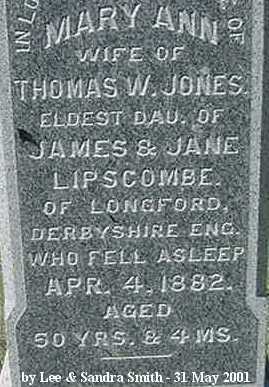 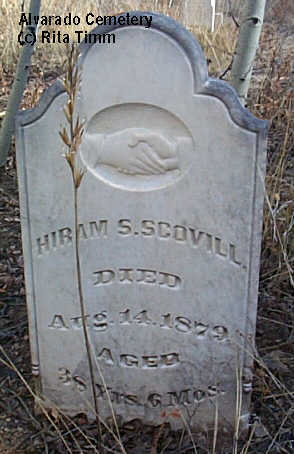 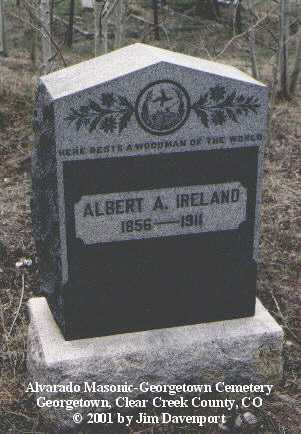 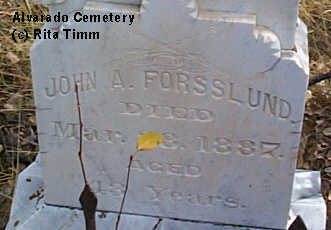 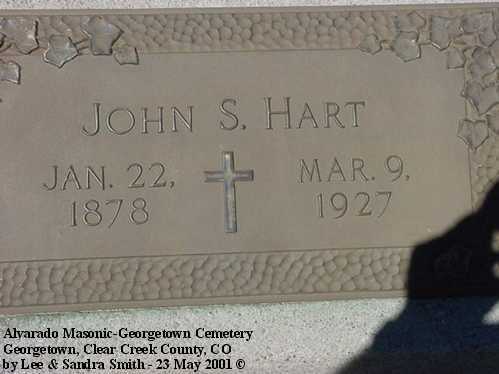 Buried in Harding family plot. 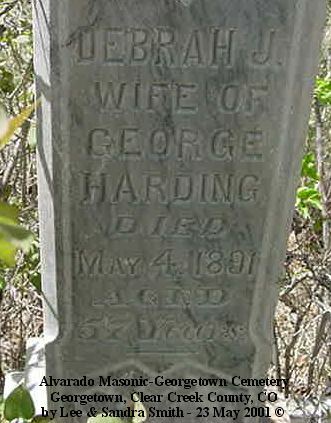 Granddaughter of George & Deborah (Treacy) Harding. 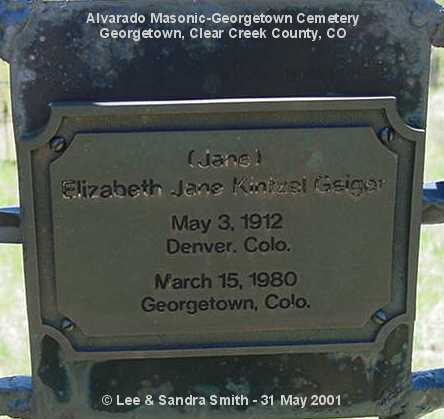 Elizabeth Jan Kintzel (Jane), May 3, 1912, Denver, Colo., March 15, 1980, Georgetown, Colo.
Children of John D. & Mary J.
Townsend, Chas. 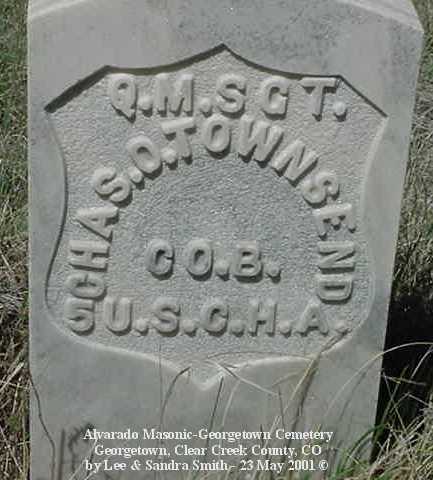 O. T., QM SGT, CO B, 5 U.S.C.H.A.